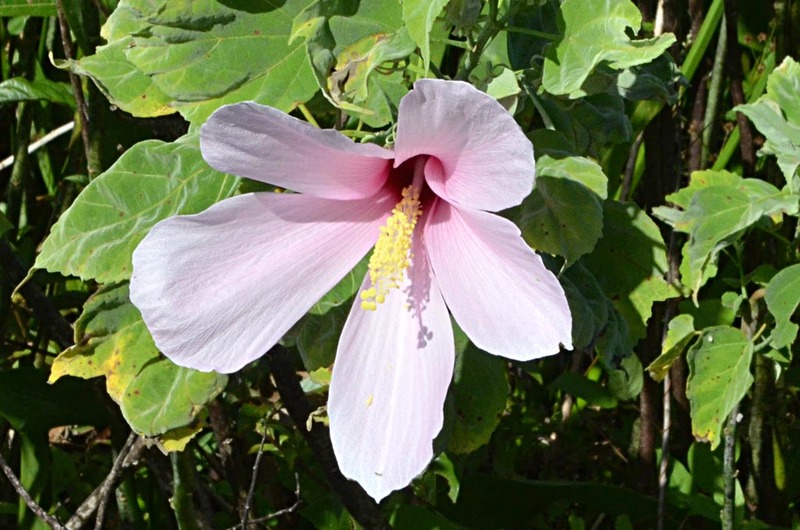 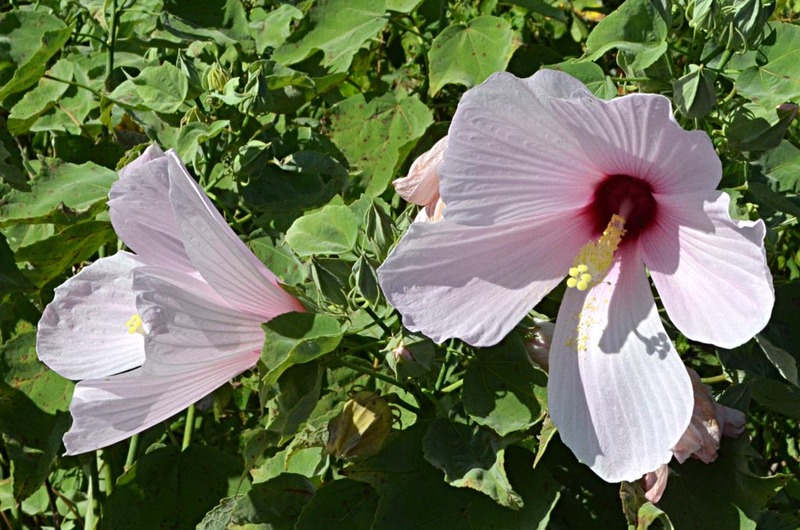 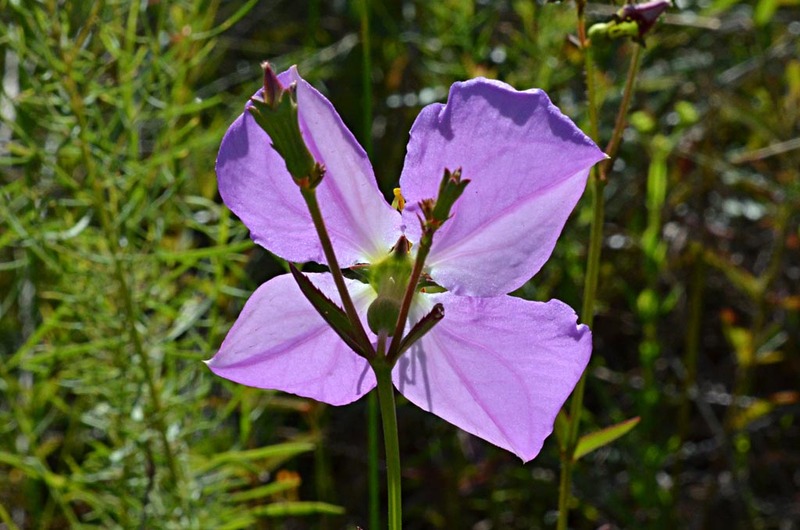 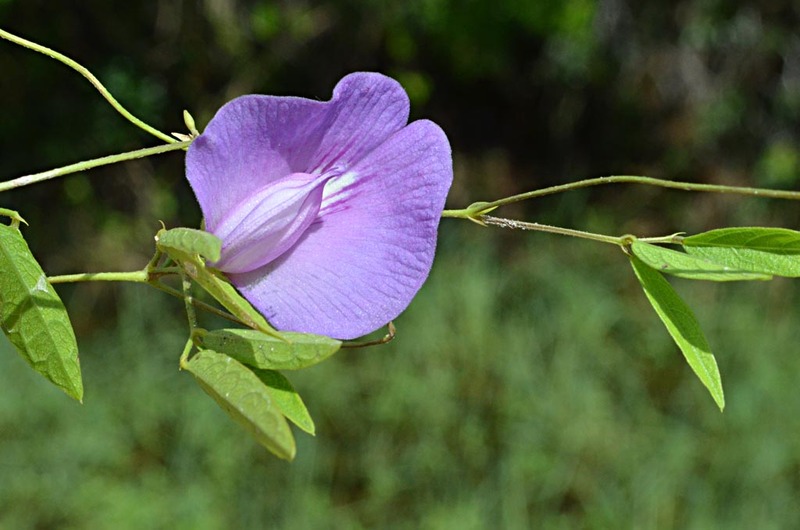 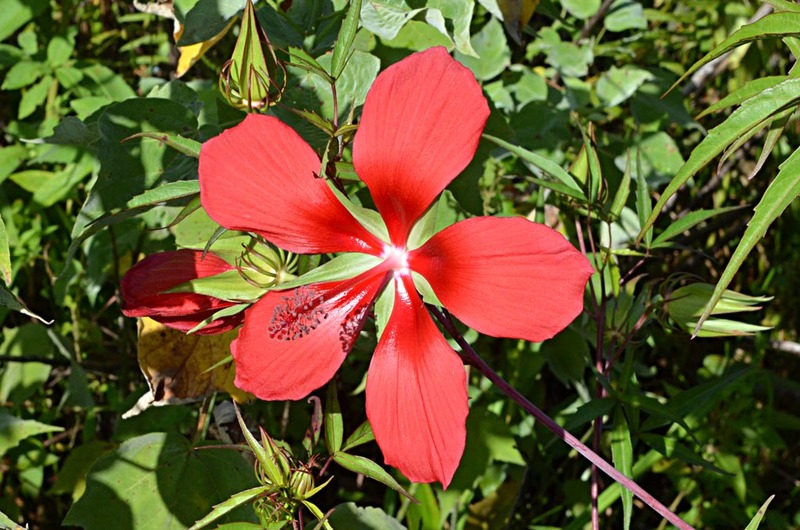 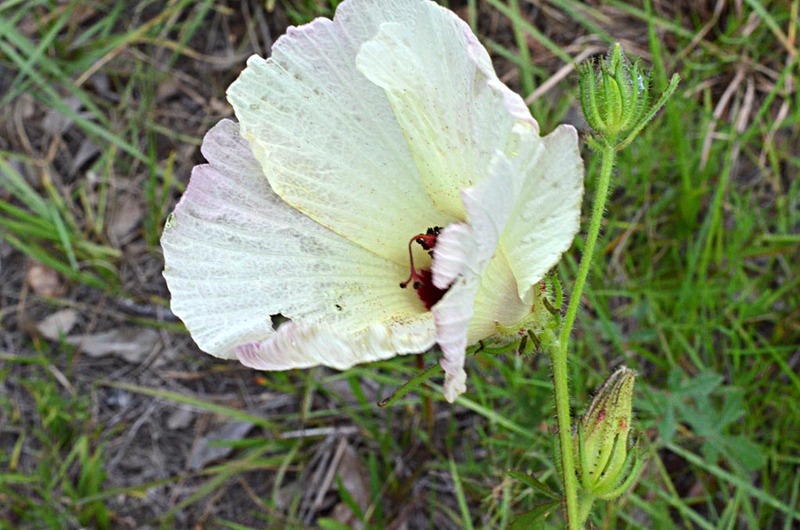 The main purpose of this visit was to photograph the abundant rosemallows (Hibiscus grandiflorus and H. coccineus) that are now blooming in the St. Johns River marshes. 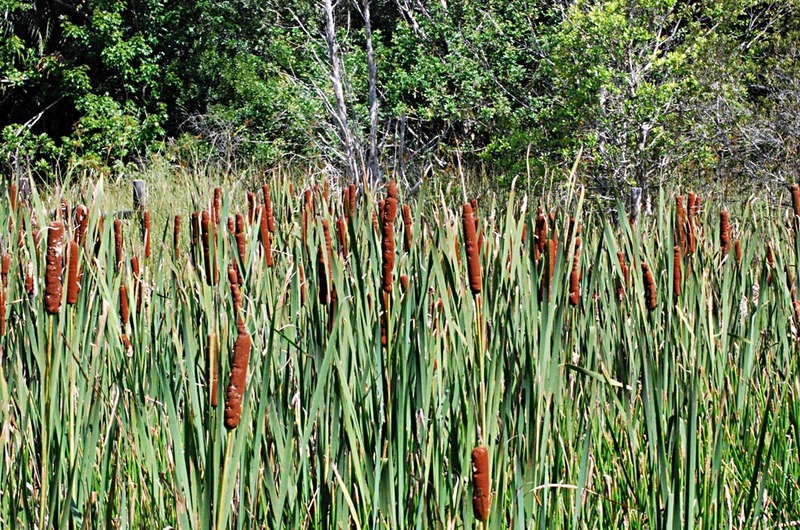 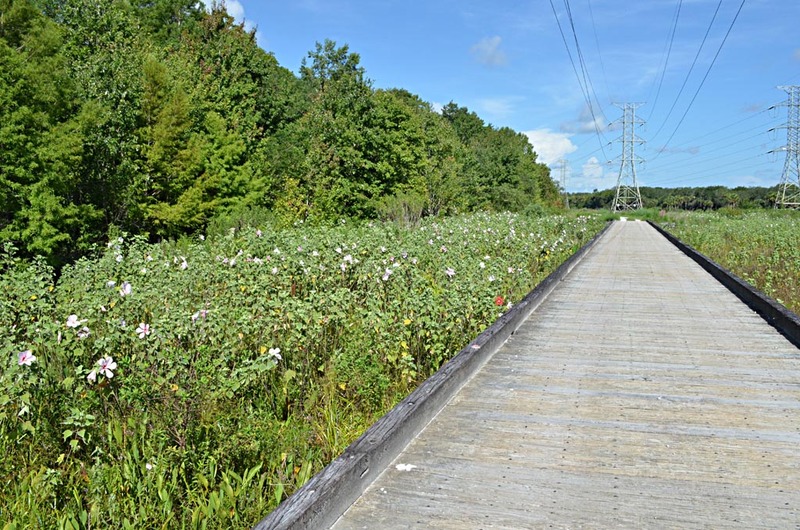 In Toso, they can be found near the east end of Power Line Rd, on either side of the two wooden bridges and further east into the near-treeless flood plain. 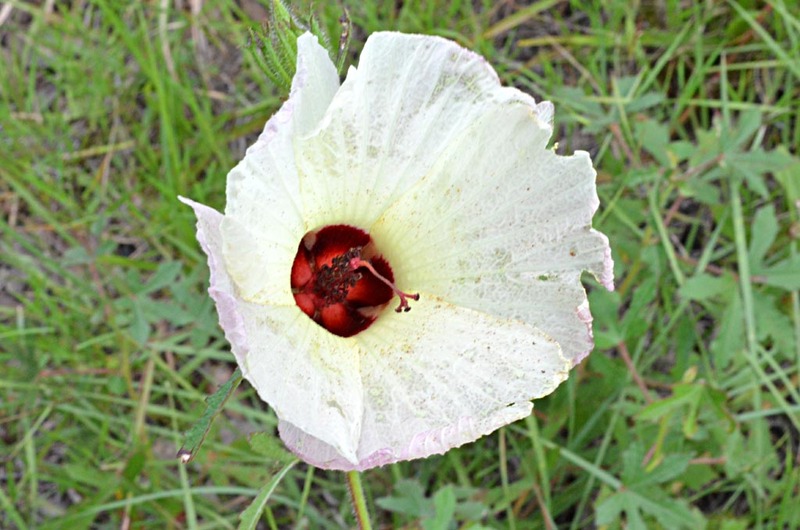 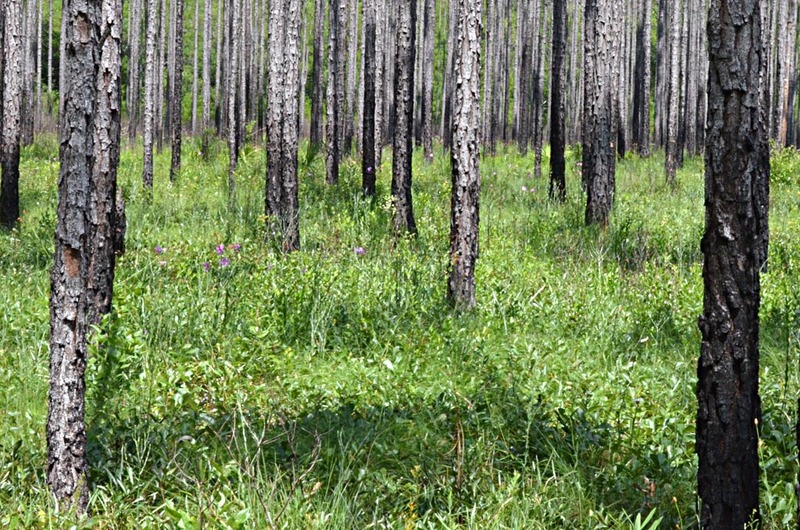 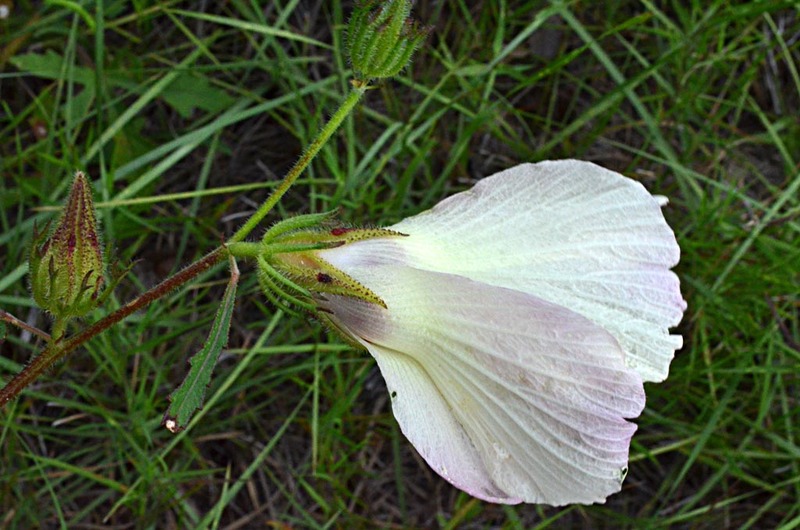 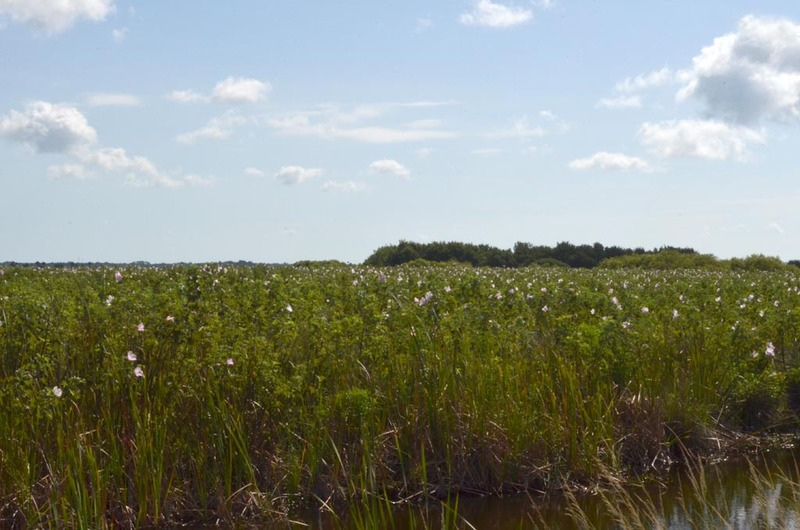 We saw thousands of rosemallows in bloom in the St. Johns Rivers marshes bordering I-95 south of SR-520. 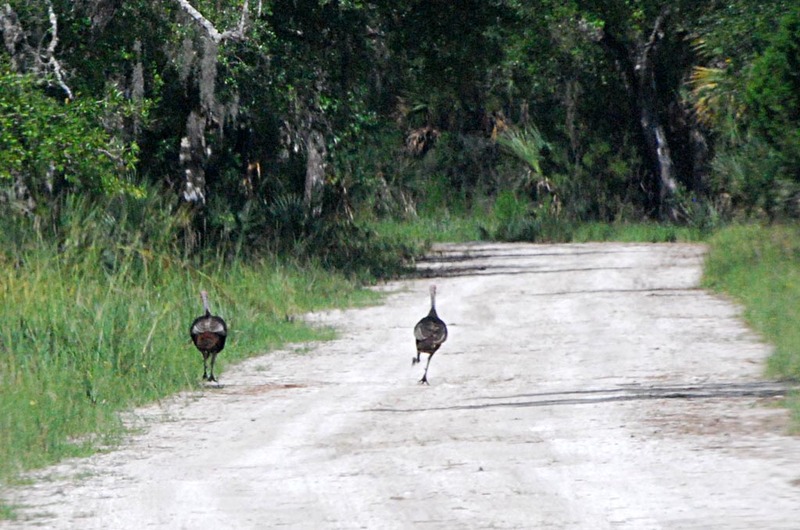 They could also be seen along SR-520 where it crosses the St. Johns River. 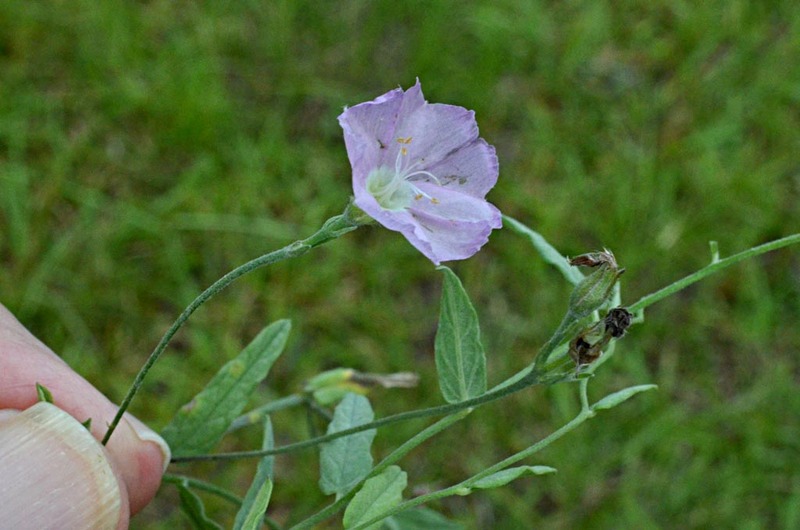 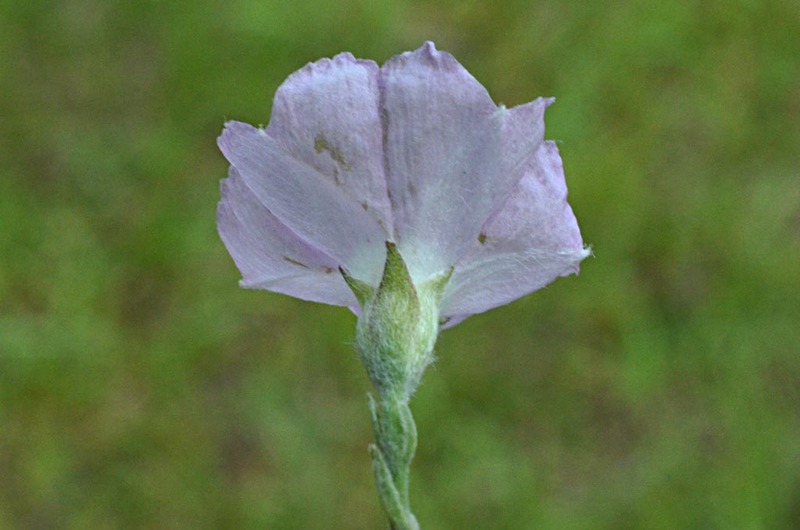 Lower photo shows blossom with interesting reddish notches on ends of petals. 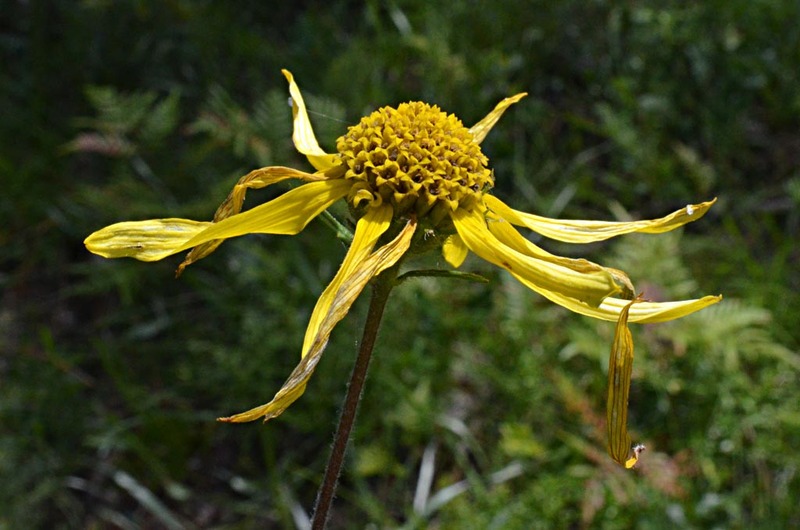 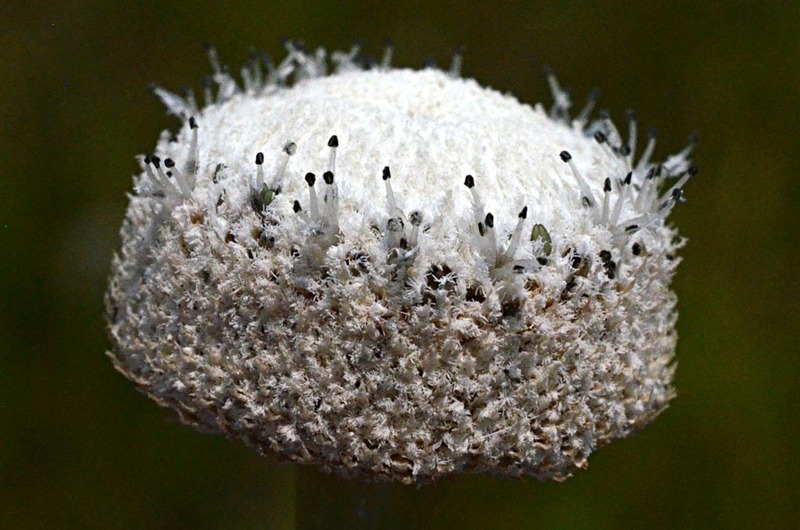 Perhaps this appearance was caused by some insect taking a bite out of the petals while still in bud stage. 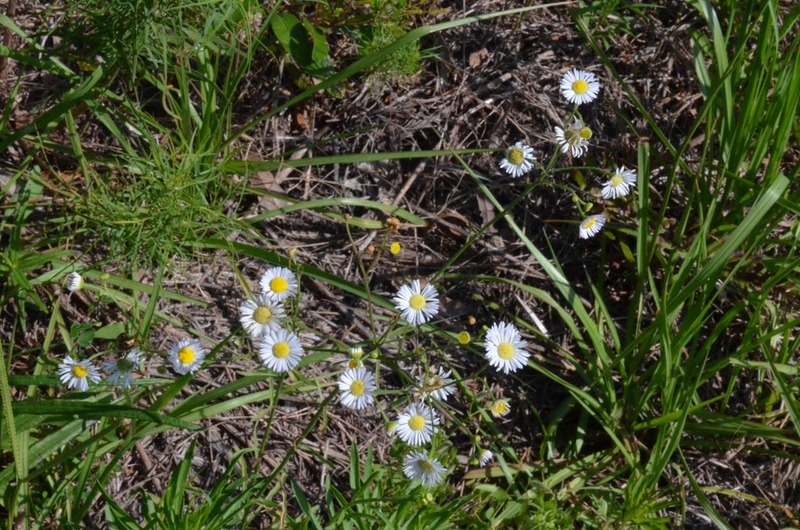 Photos taken along St. Nicholas Rd. 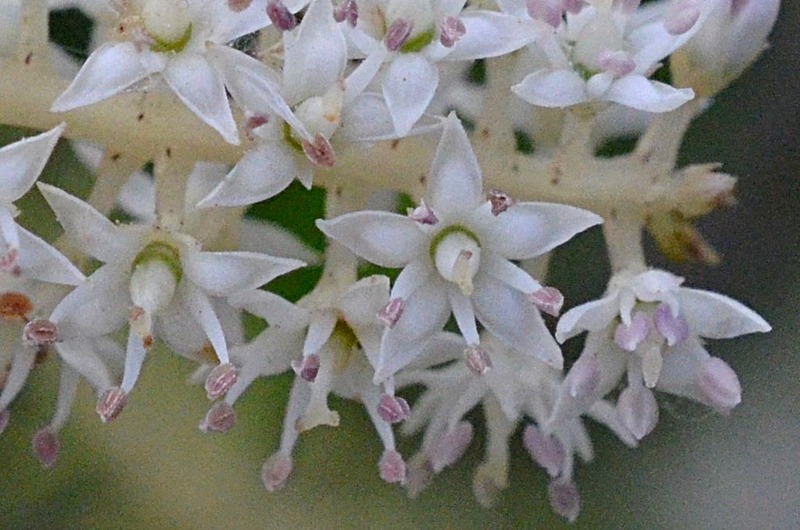 Upper-right photo shows a backlit blossom. 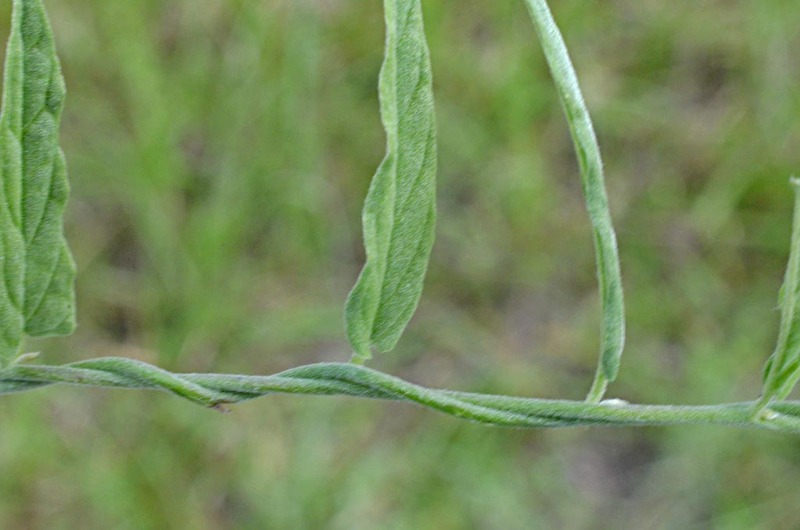 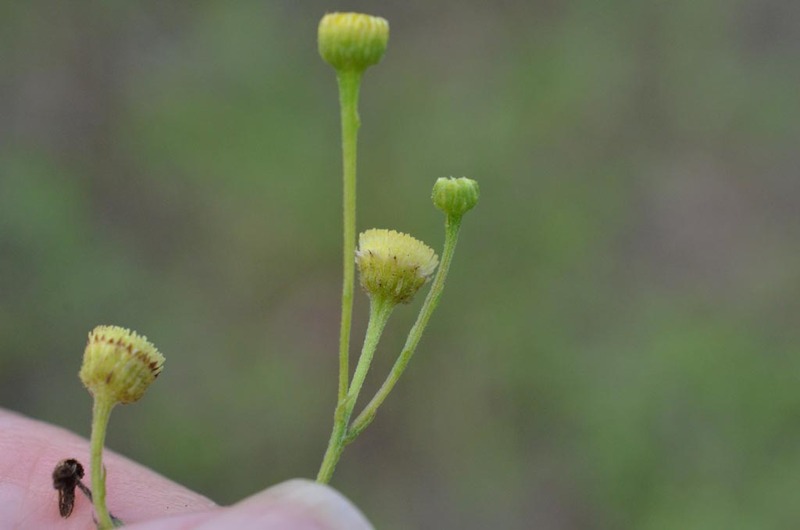 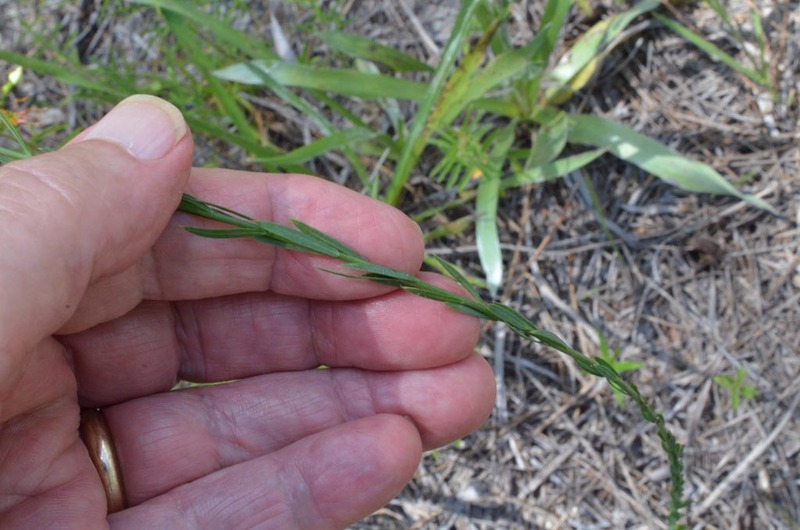 Lower photo shows spurs on anthers. 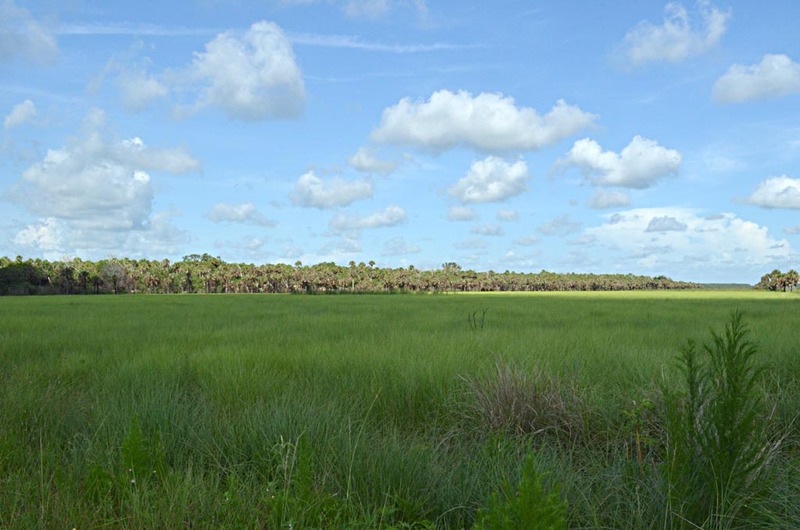 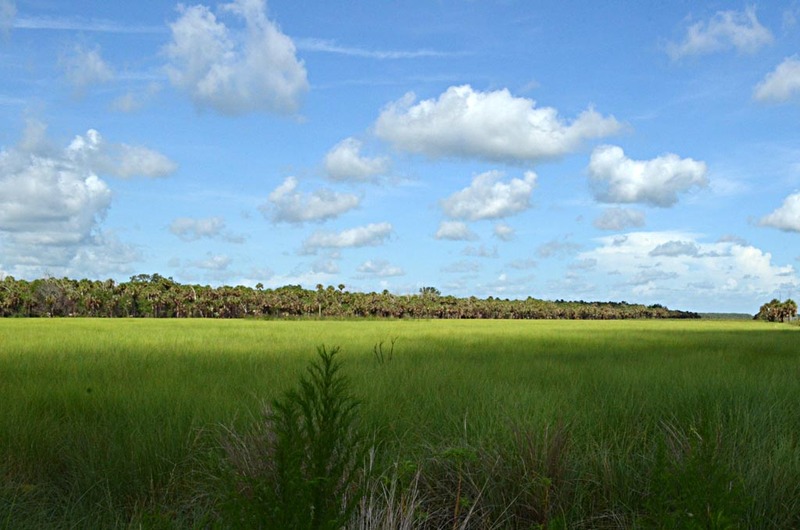 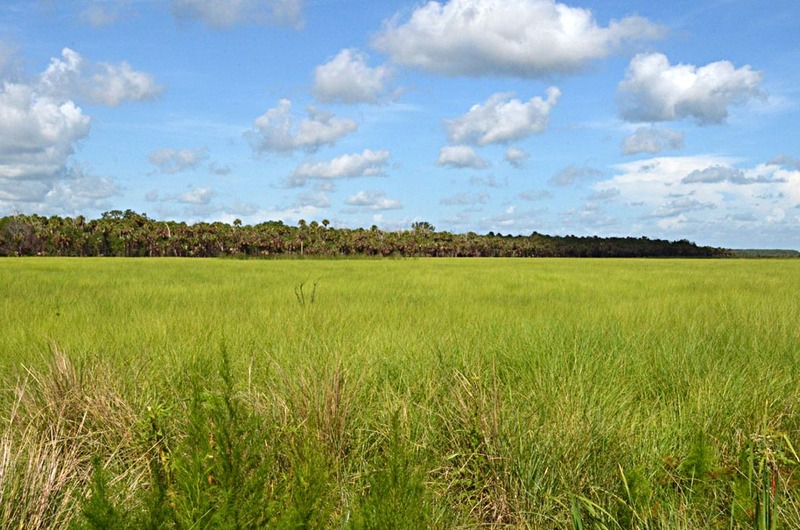 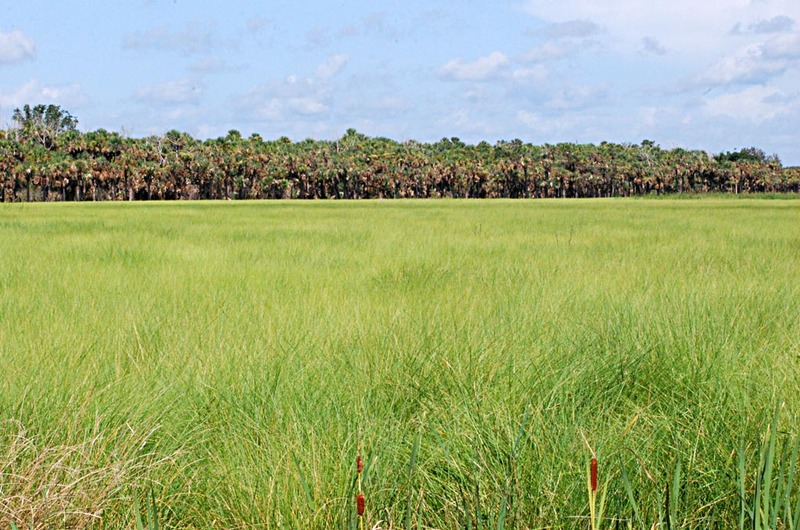 Others: Clouds moving across grassy marshland. 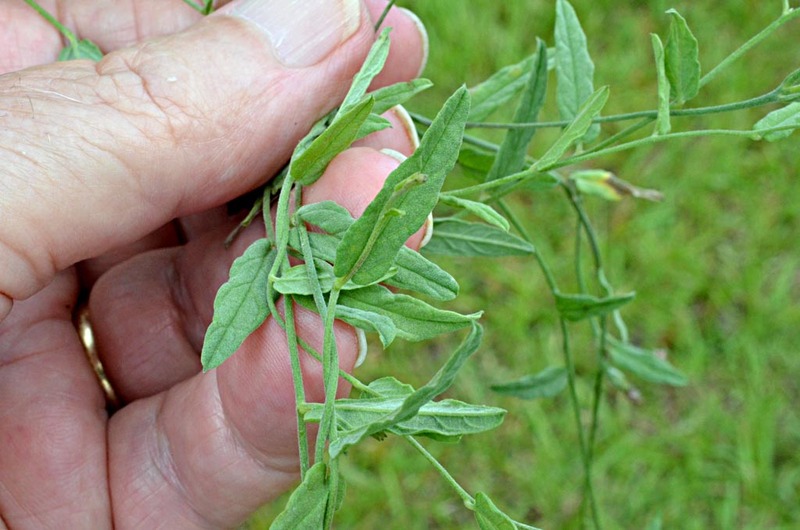 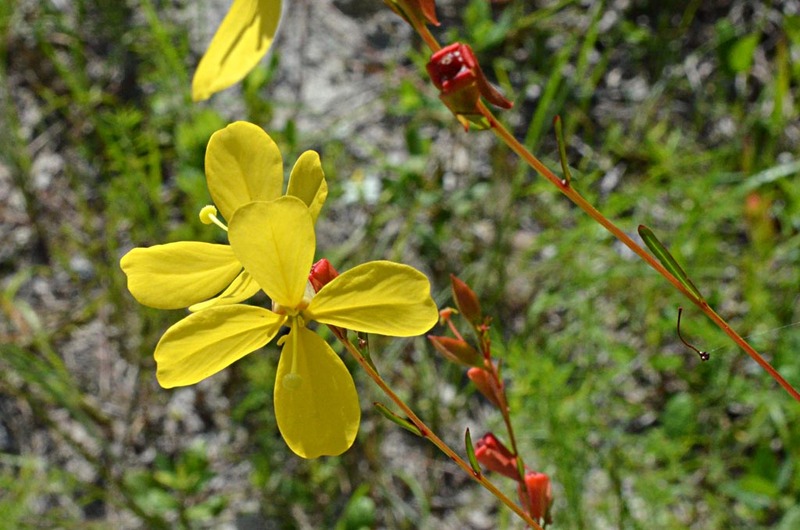 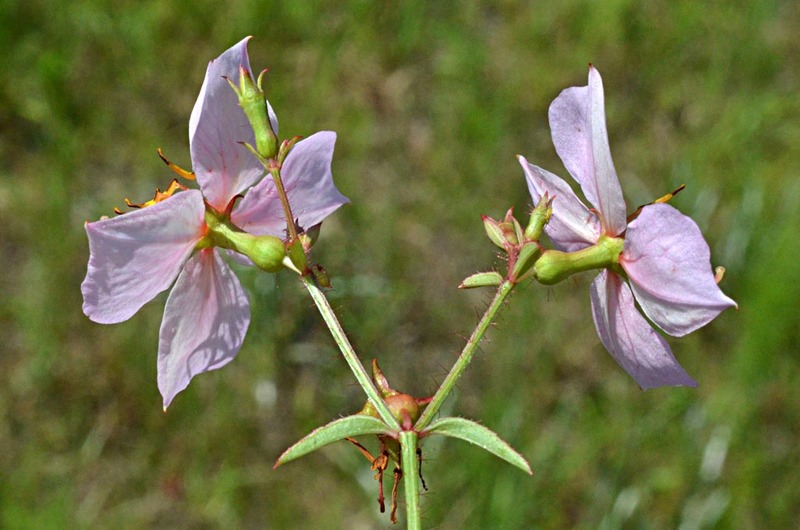 The petals of winged loosestrife appear wrinkled, as if they need ironing! 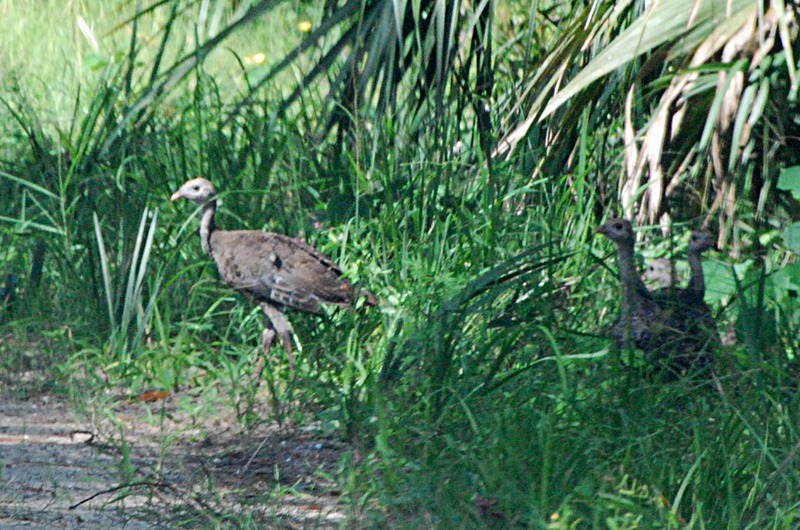 Found on Fish Hole Rd, a few hundred feet north of the SR-528 underpass. 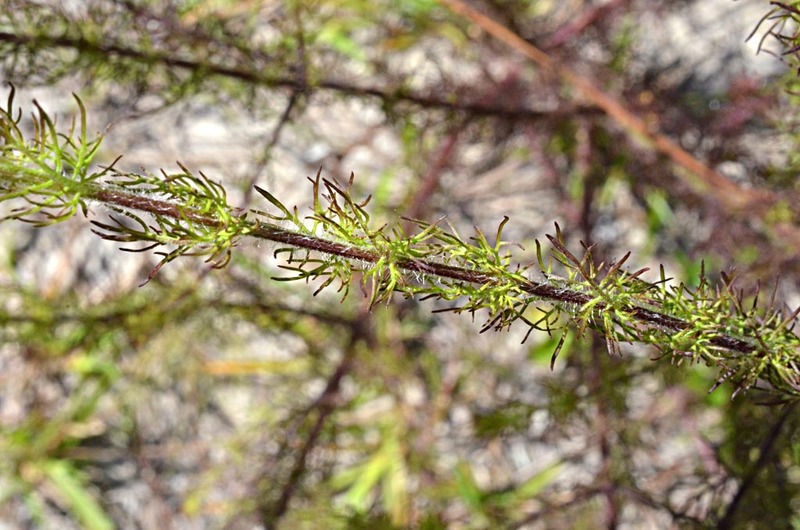 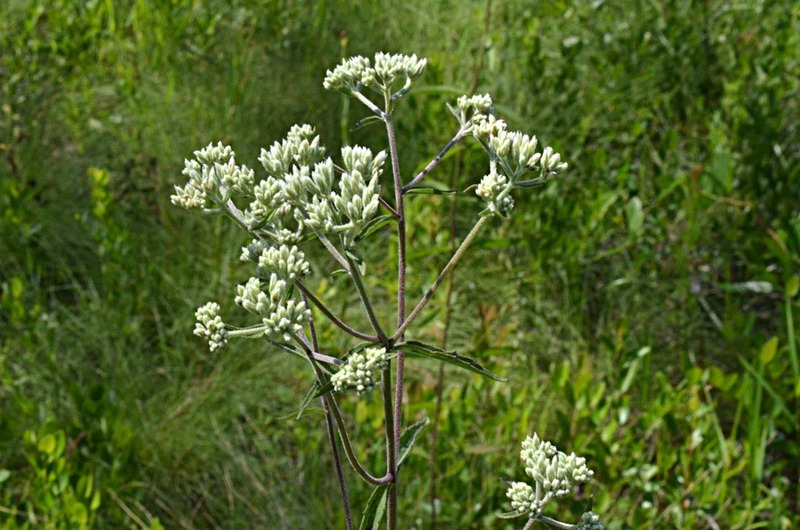 Flower heads borne along one side of the floral branches. 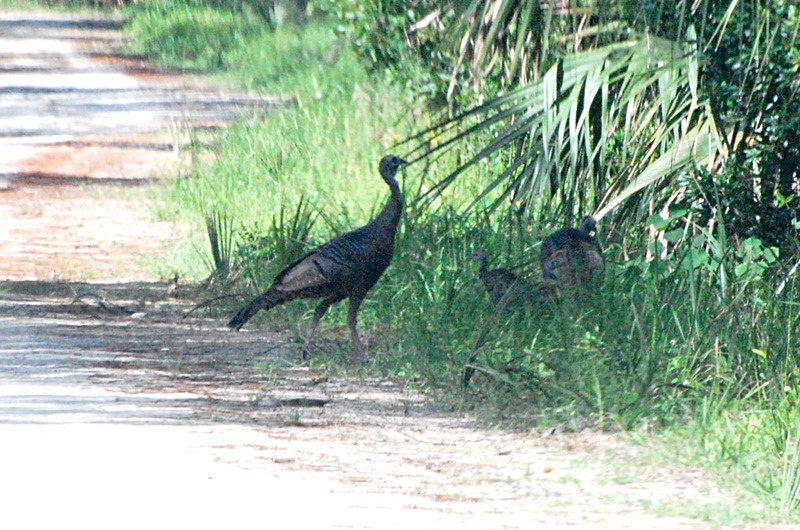 Several adults and a bunch of young ones were browsing in the tall grass along Long Bluff Rd. 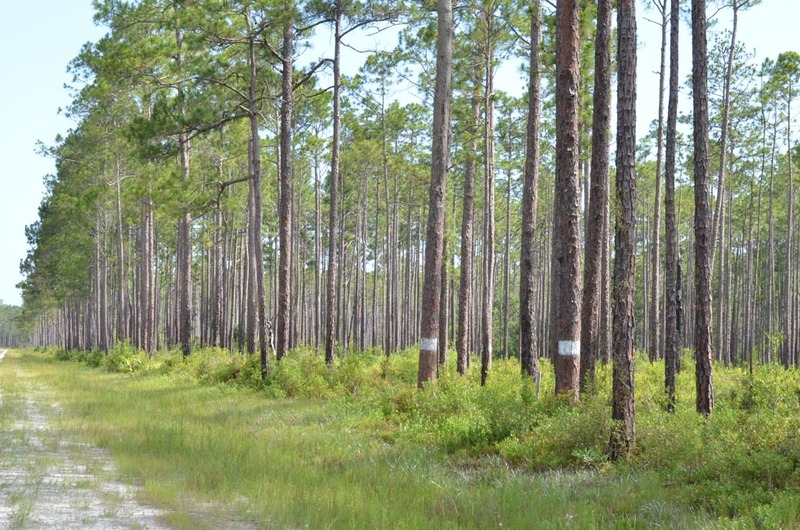 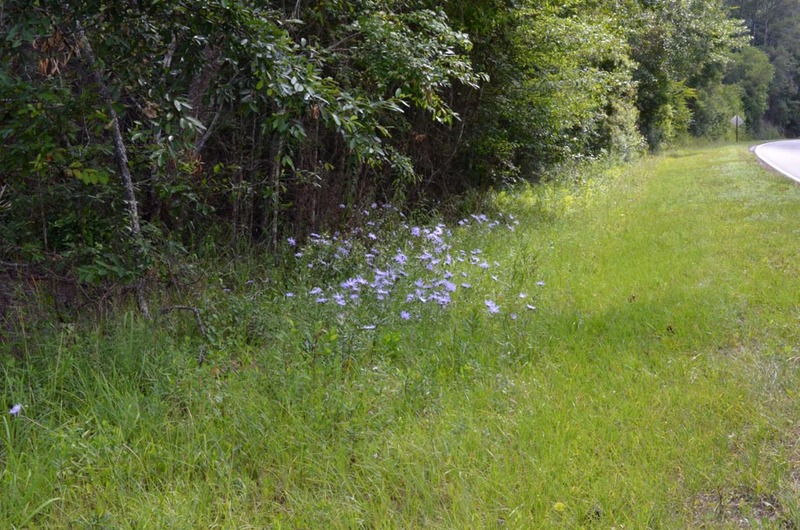 On our first day, Tuesday, June 16, we followed a route suggested by Roger Hammer: from Crawfordville, east on Arran Rd, which turns into unpaved FH-13. 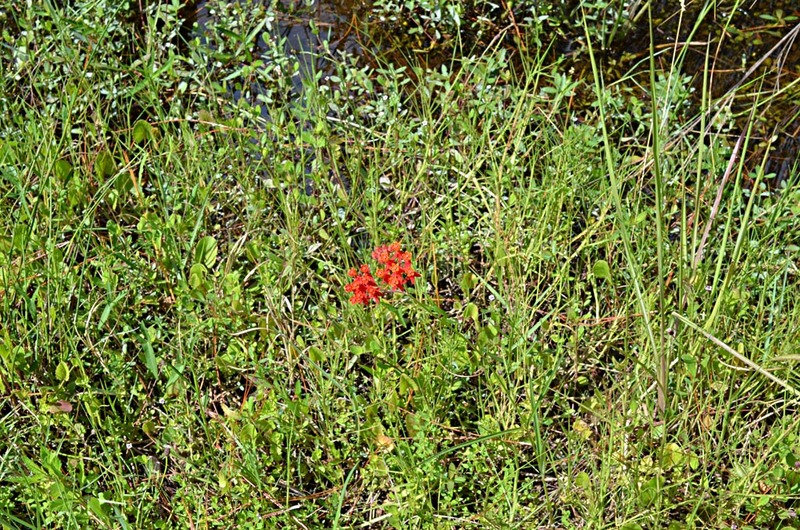 We made several stops along FH-13, with FR-314 being the main stop recommended by Roger. 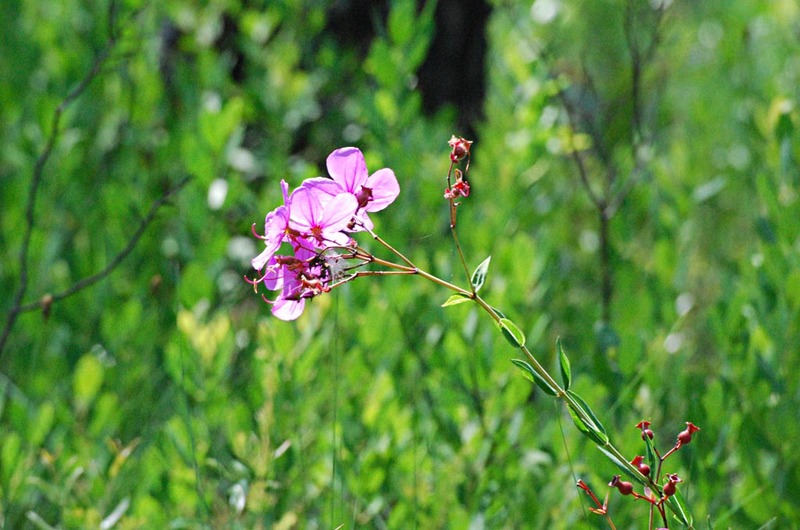 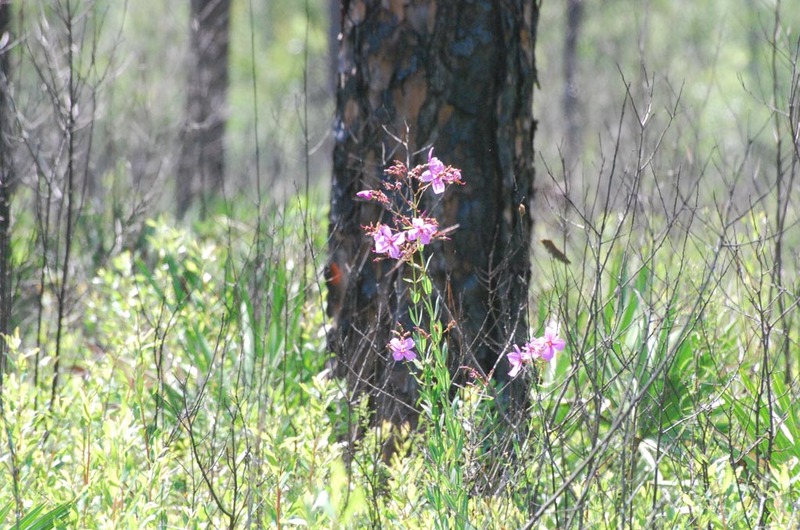 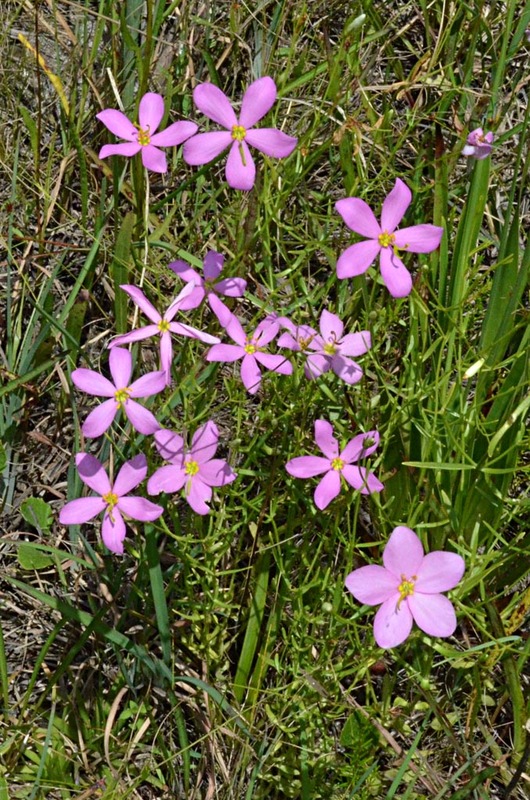 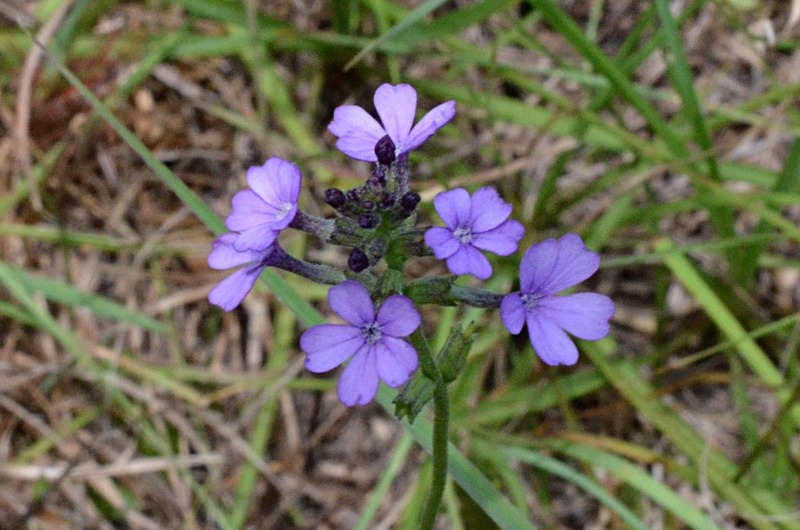 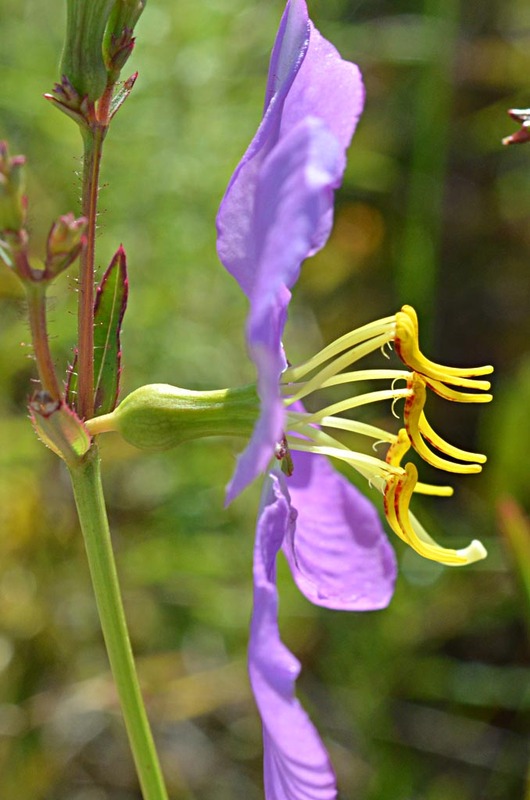 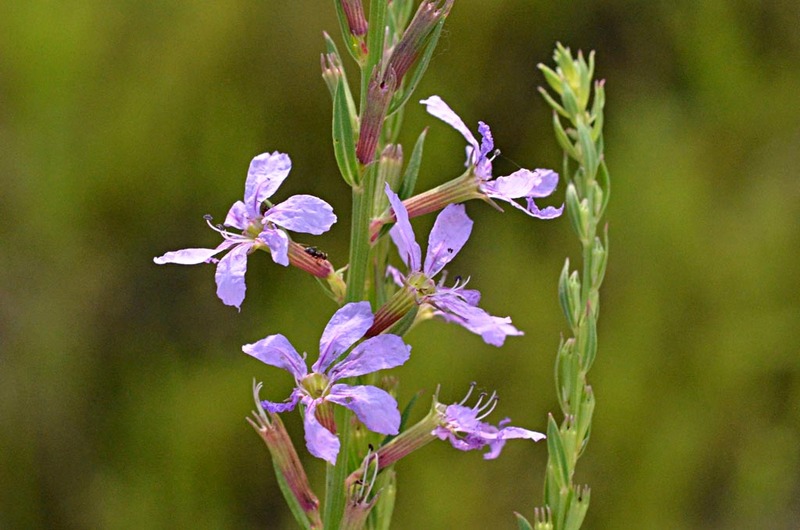 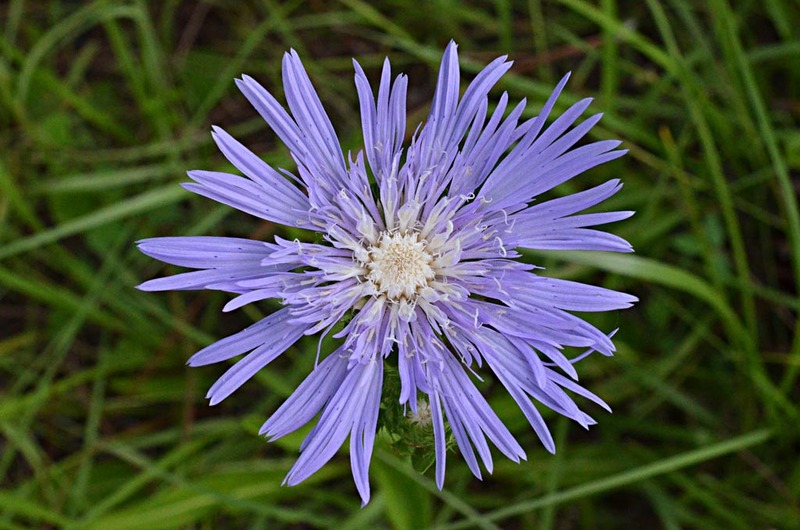 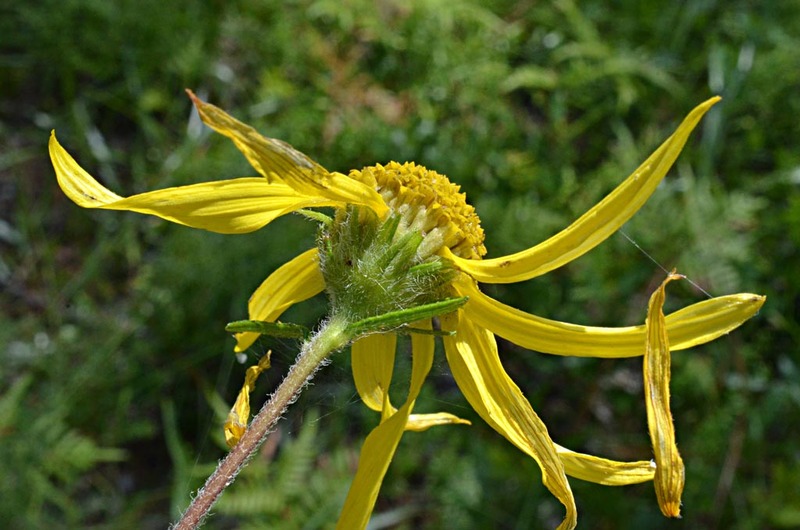 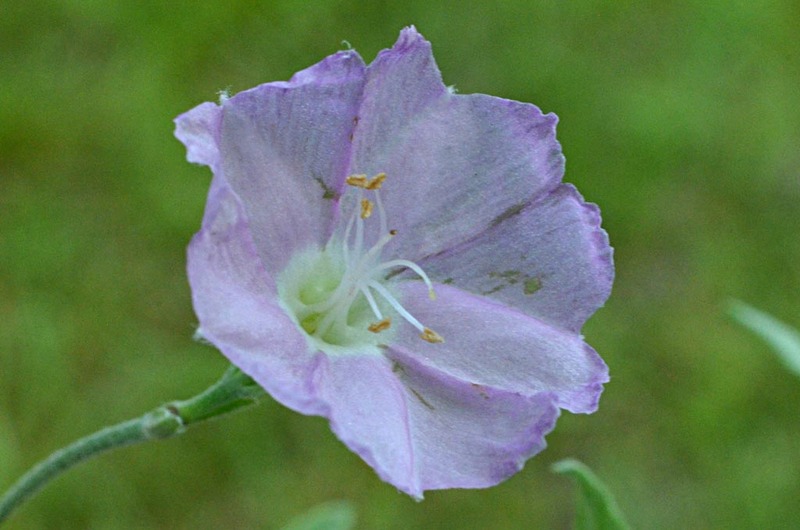 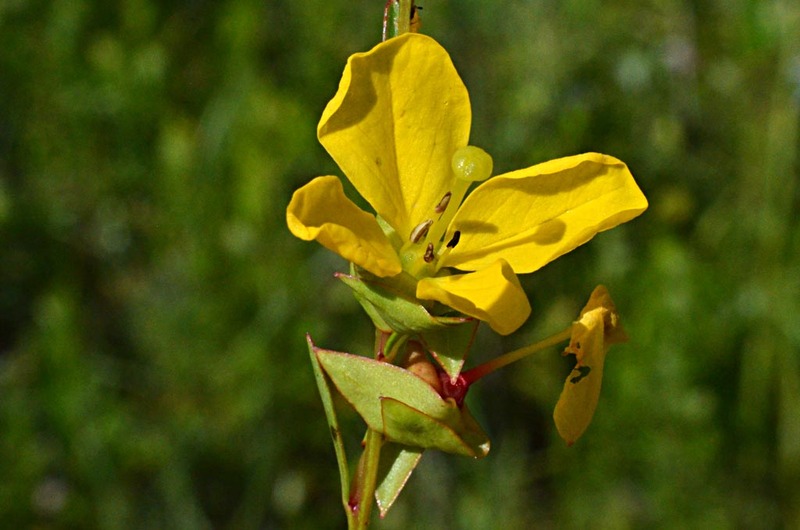 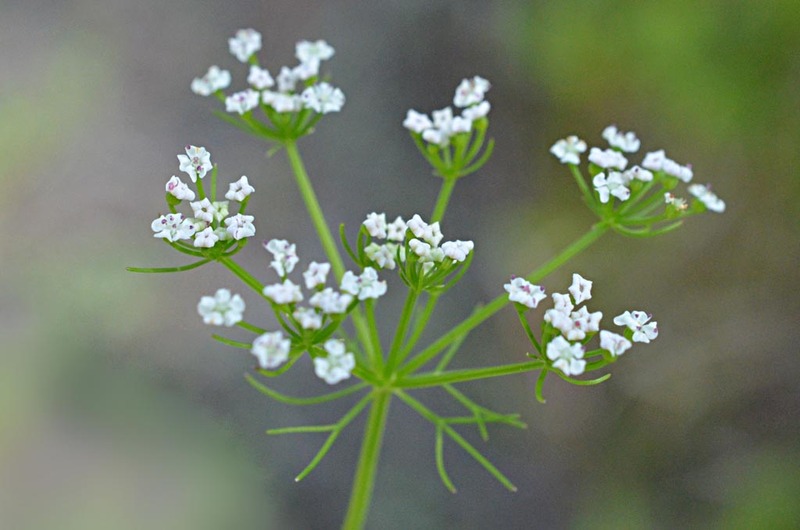 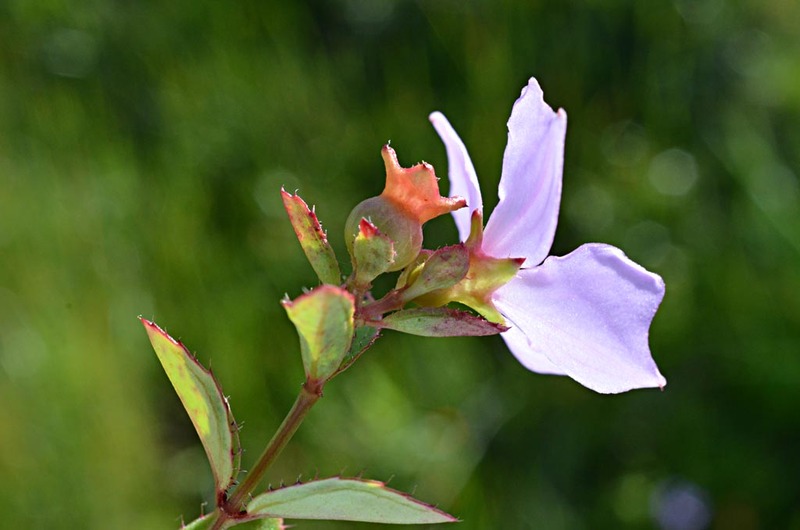 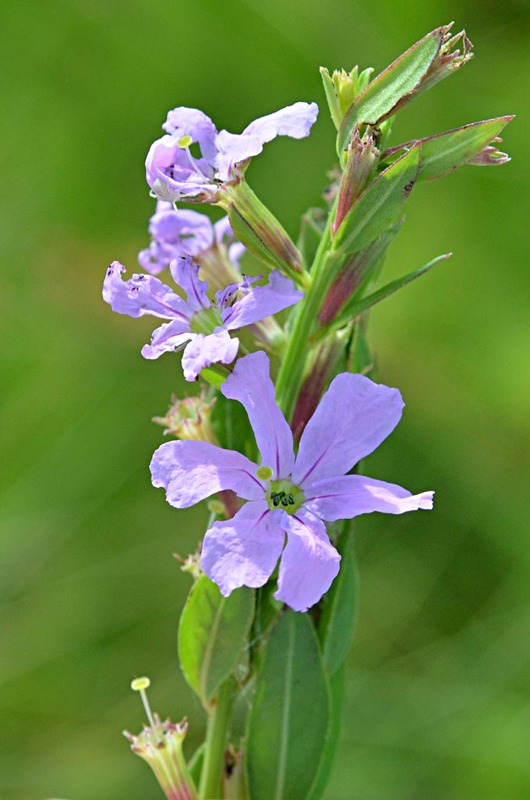 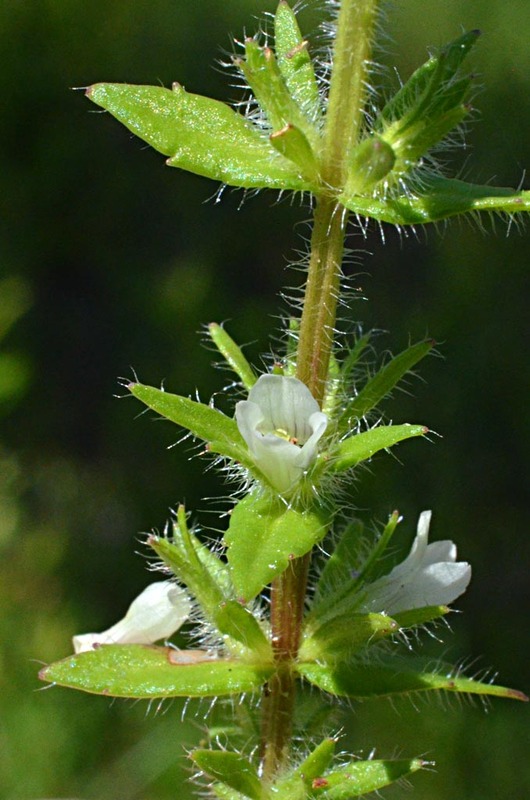 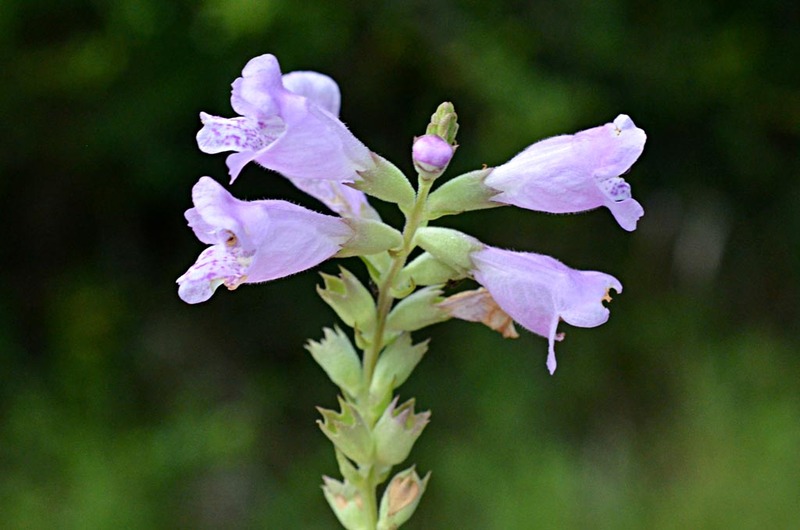 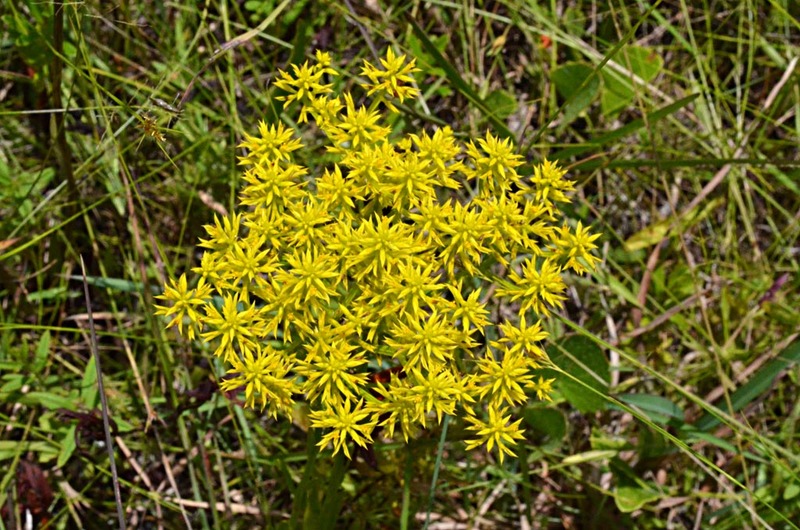 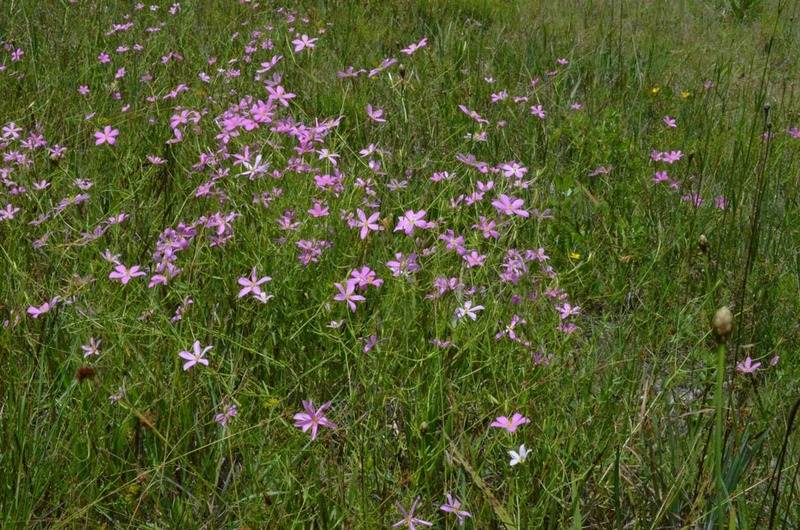 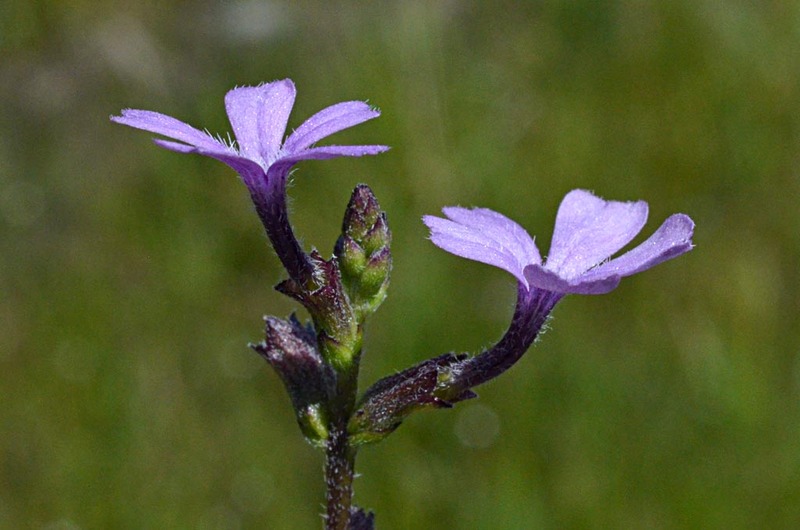 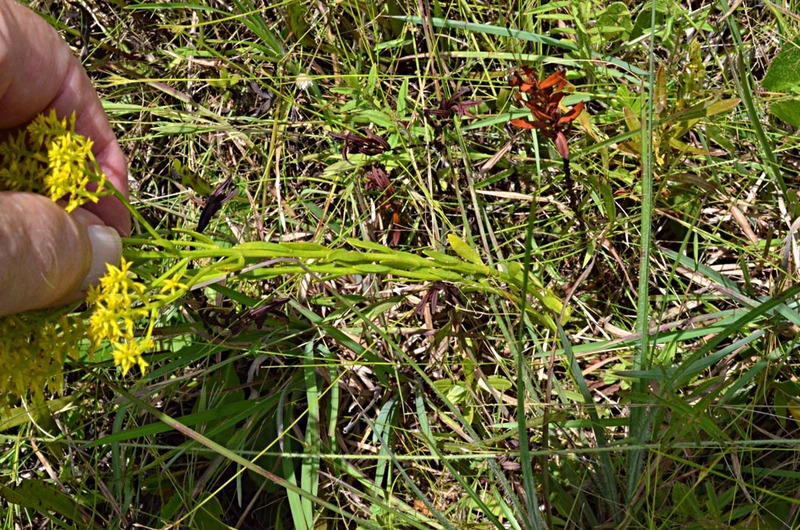 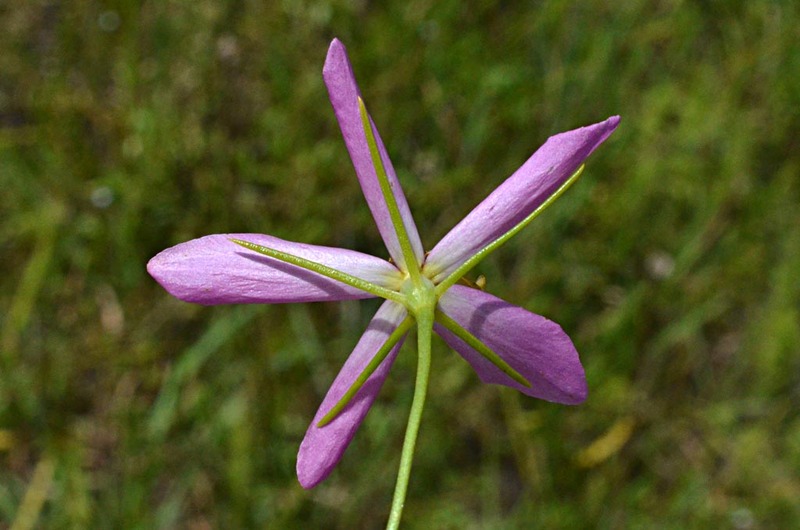 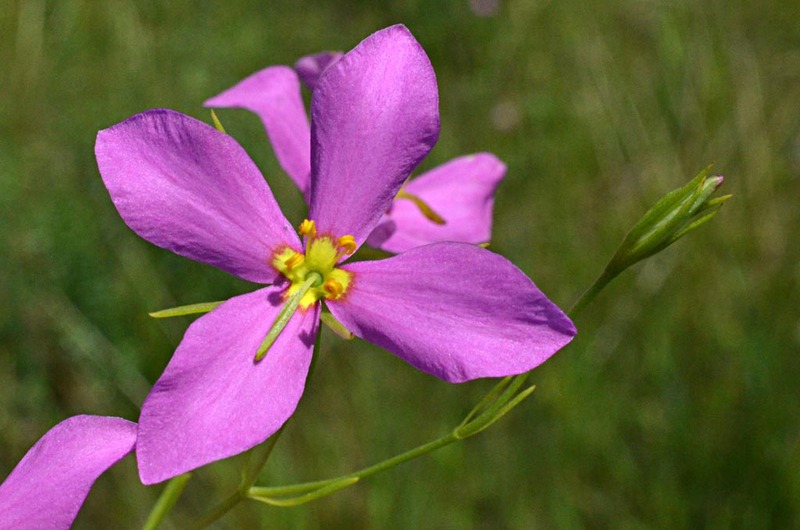 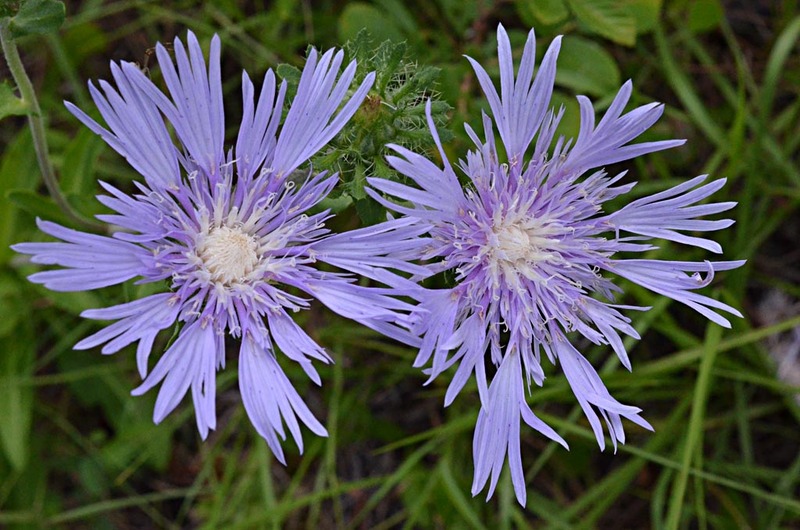 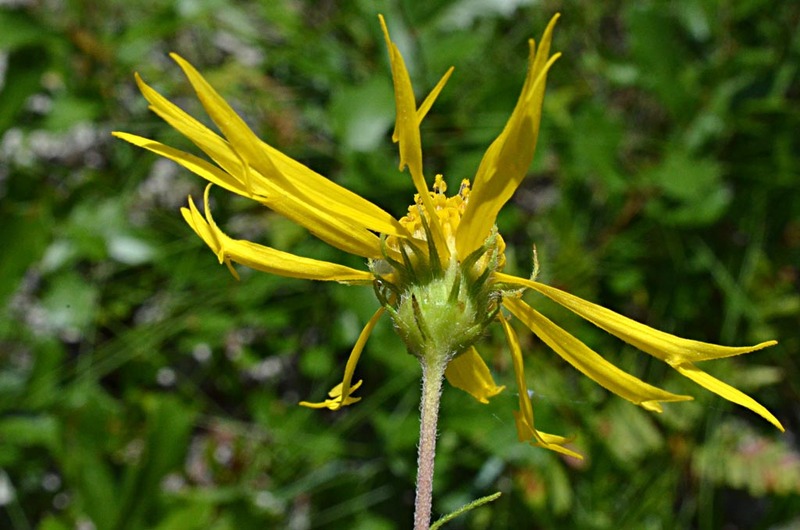 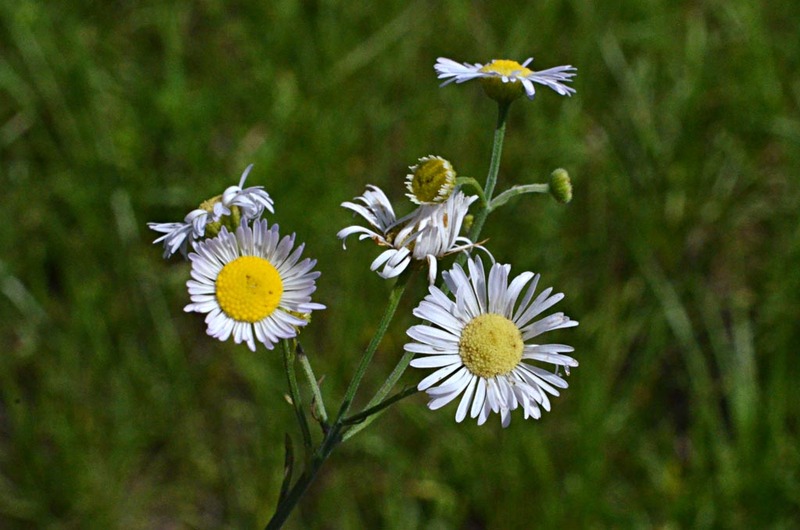 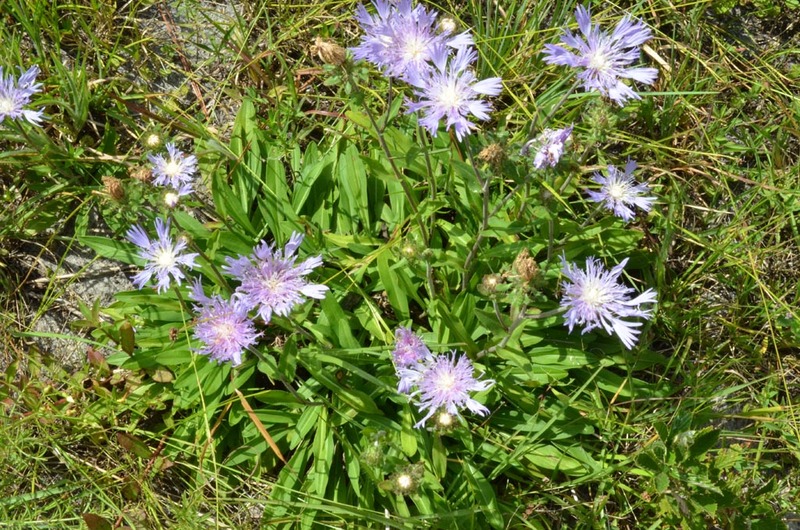 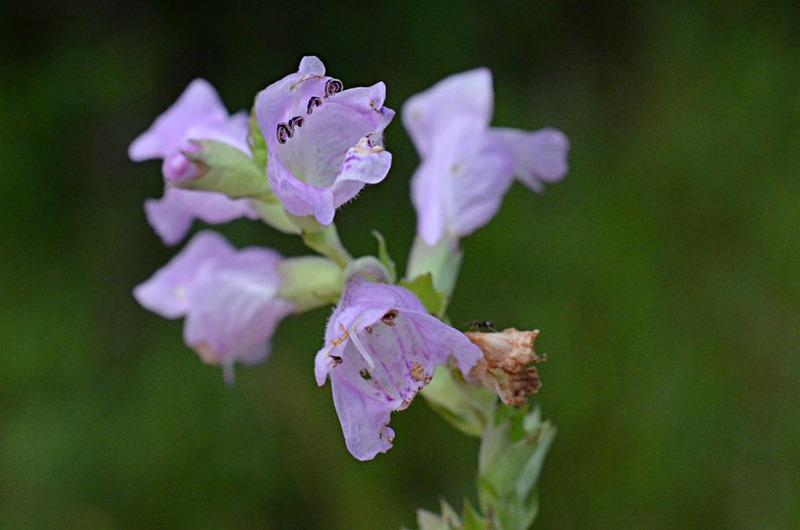 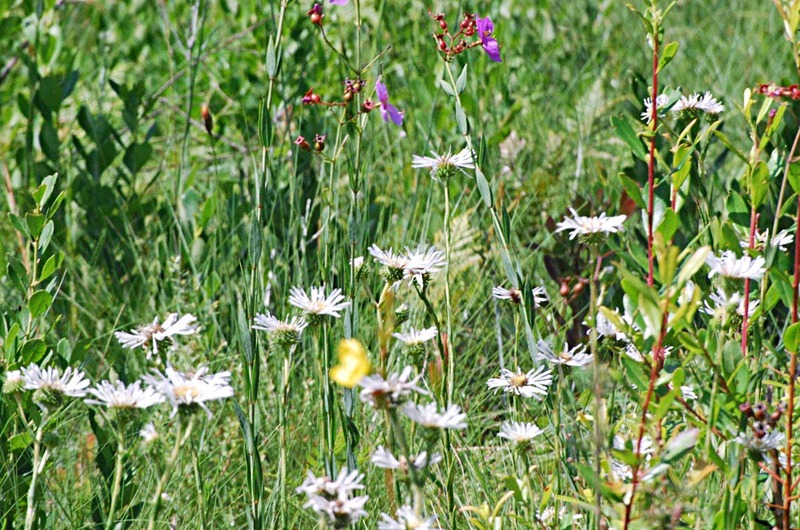 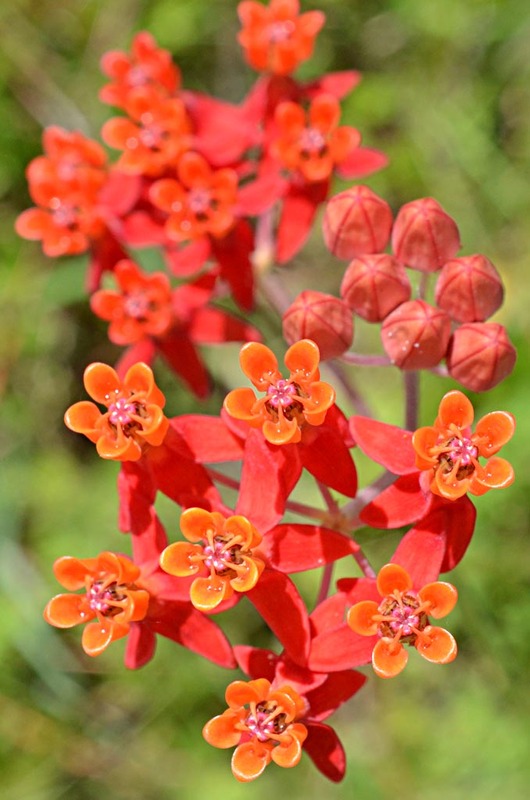 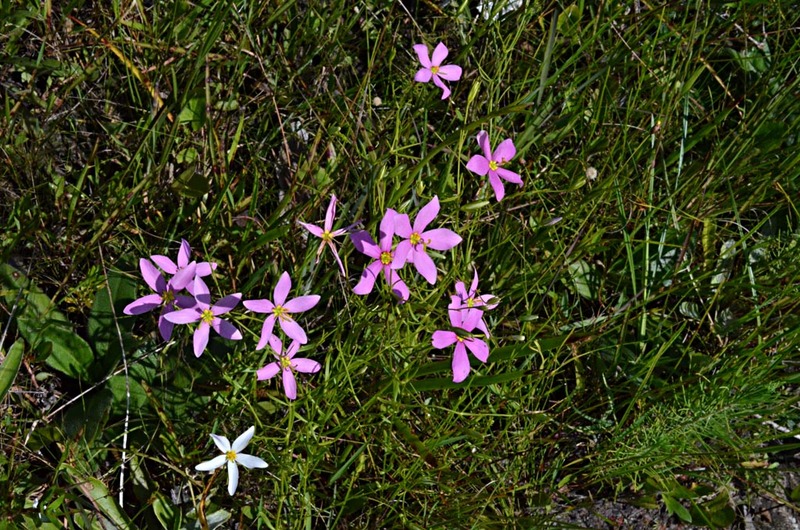 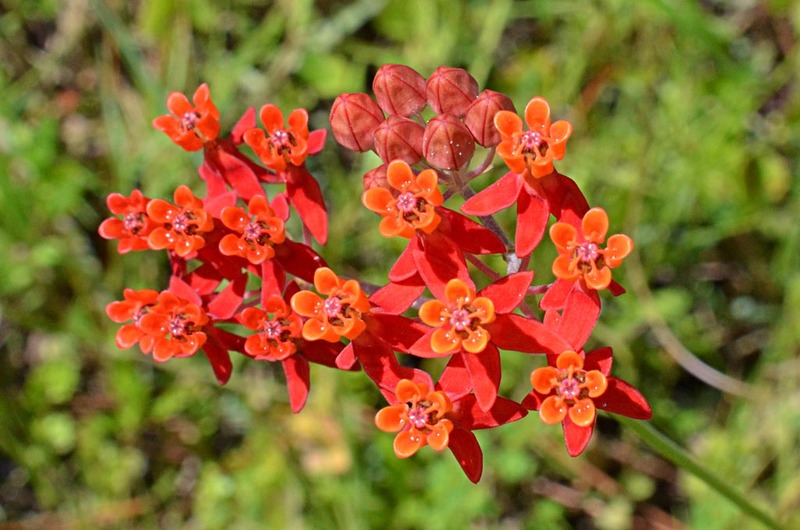 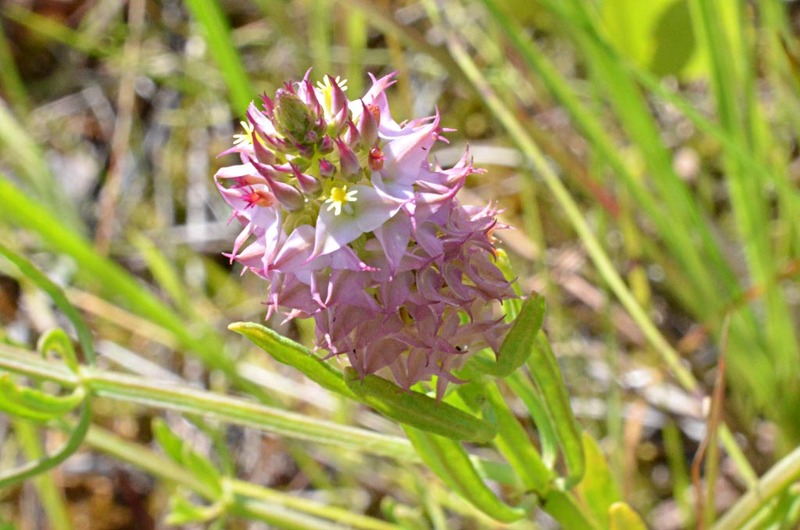 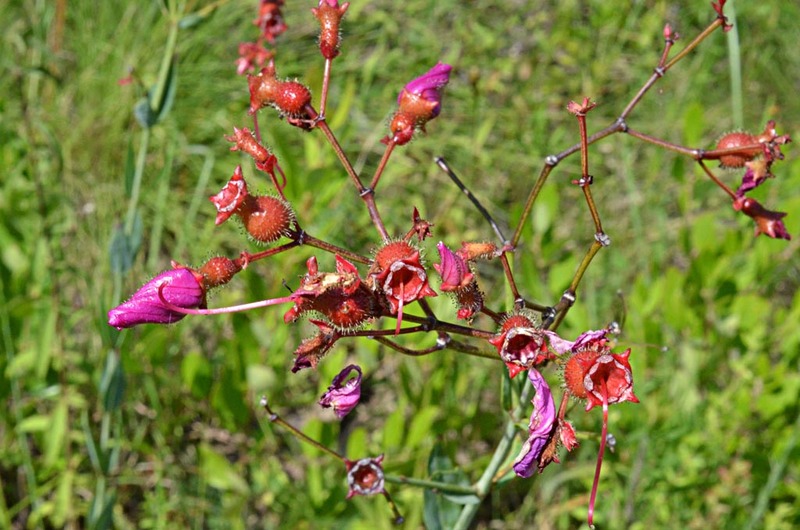 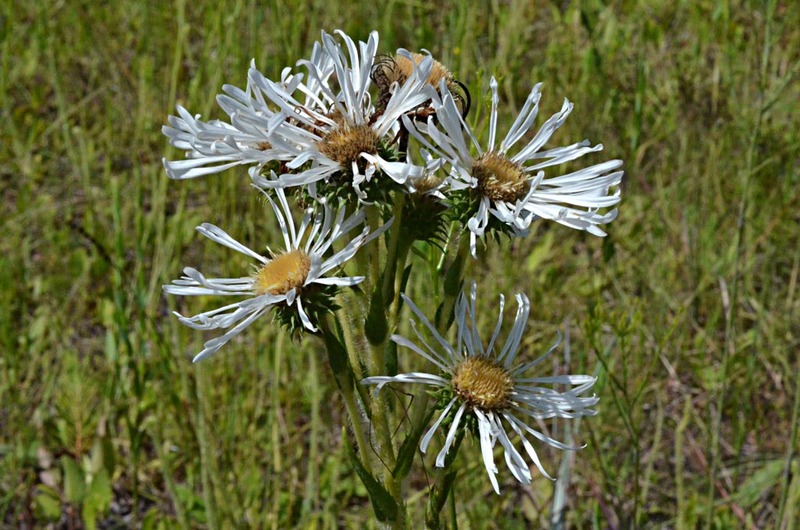 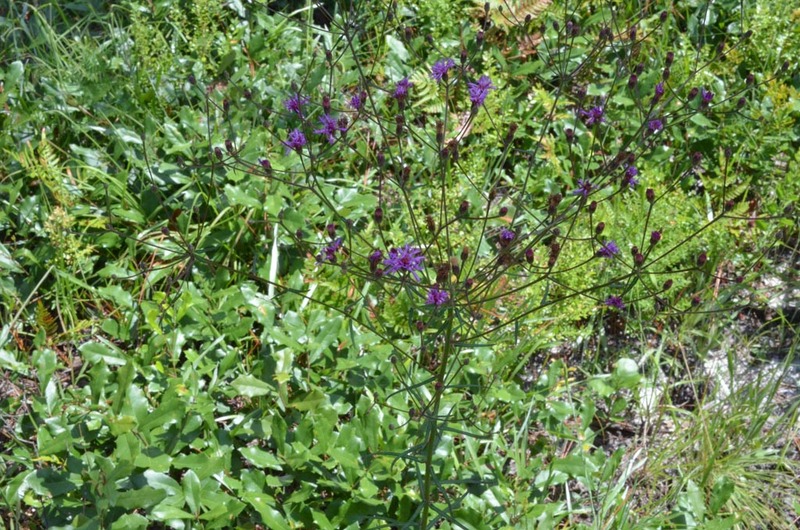 On the second day, Wednesday, June 17, we photographed wildflowers south of Hosford, along SR-65, our main objective. 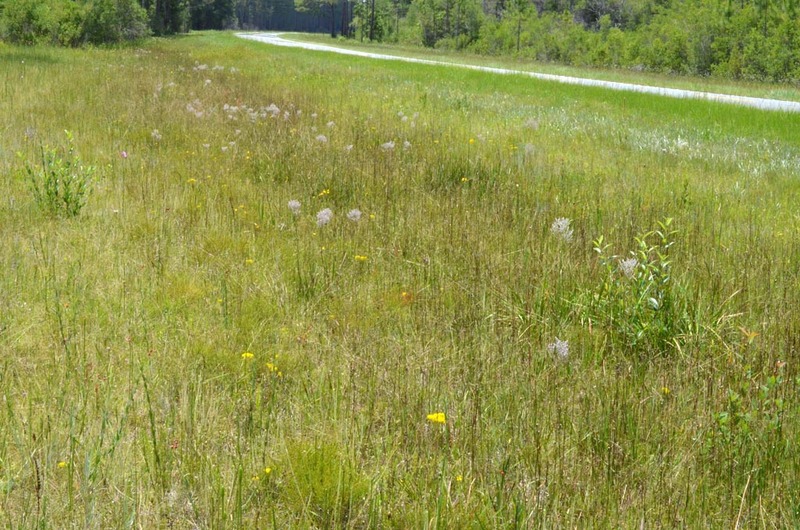 We turned back north on SR-12 to Bristol. 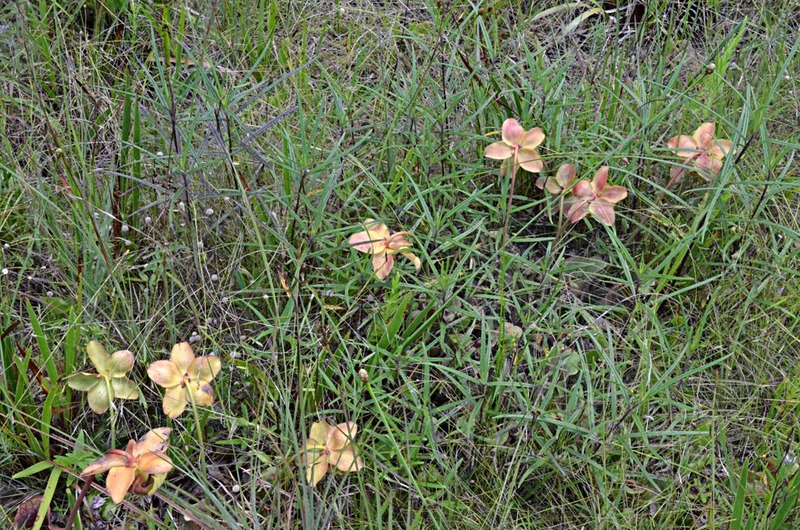 We found a couple of interesting plants in the swales along SR-12. 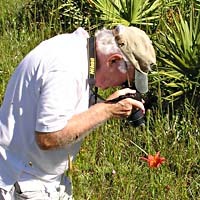 A total of 53 species were photographed. 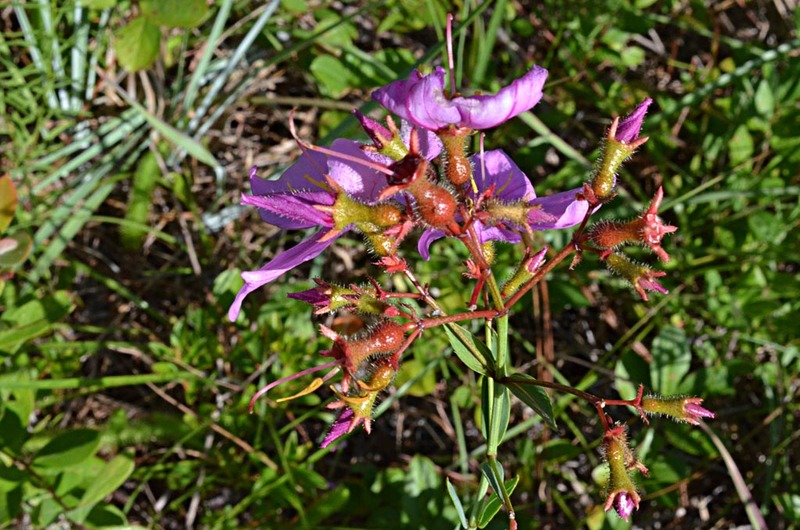 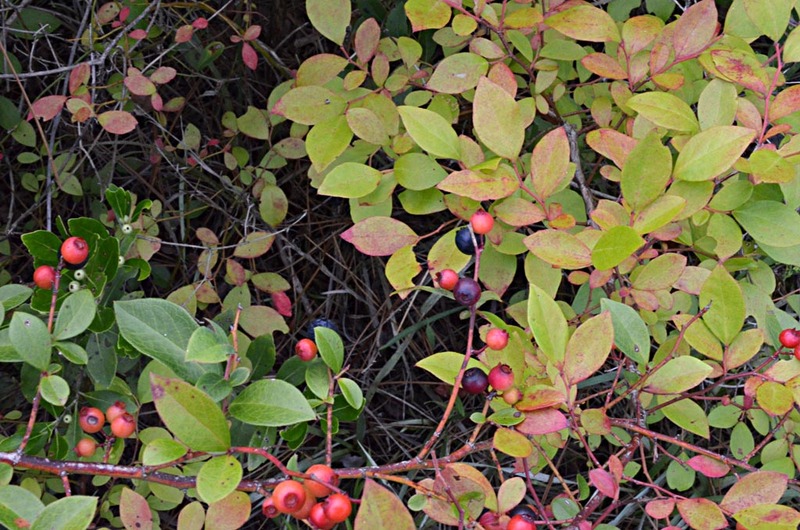 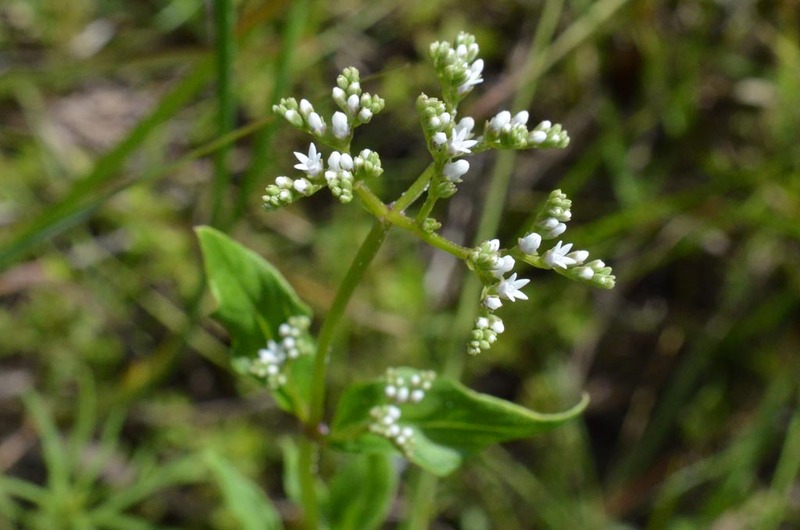 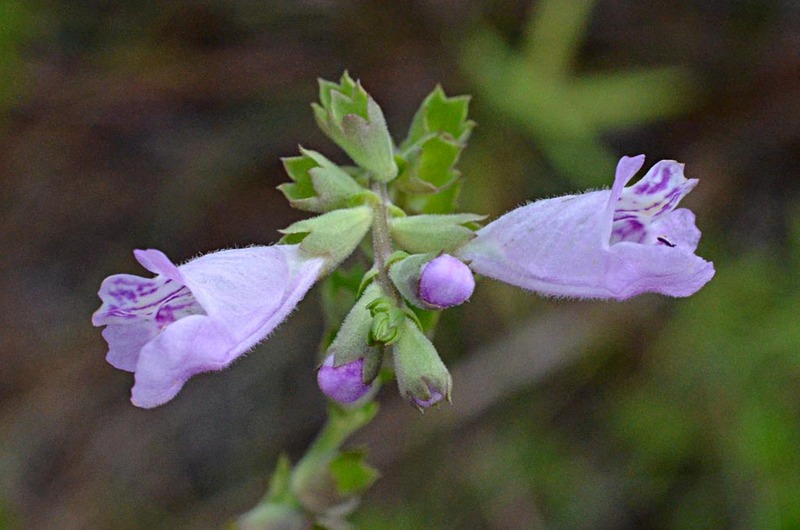 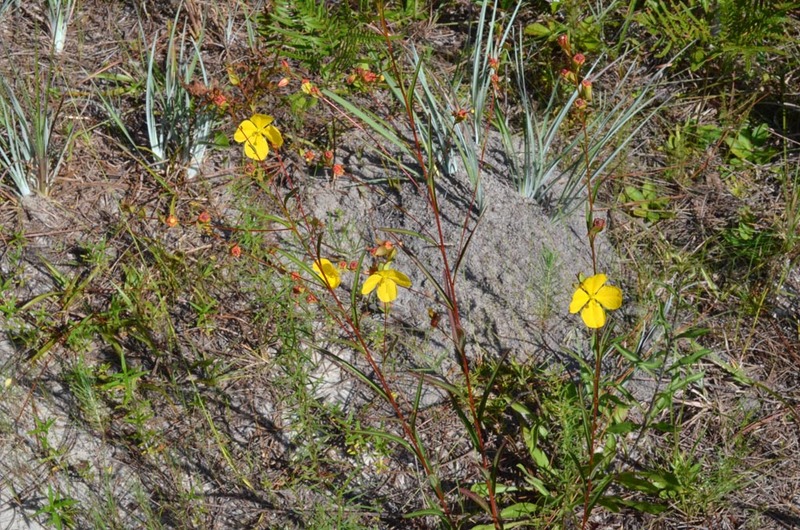 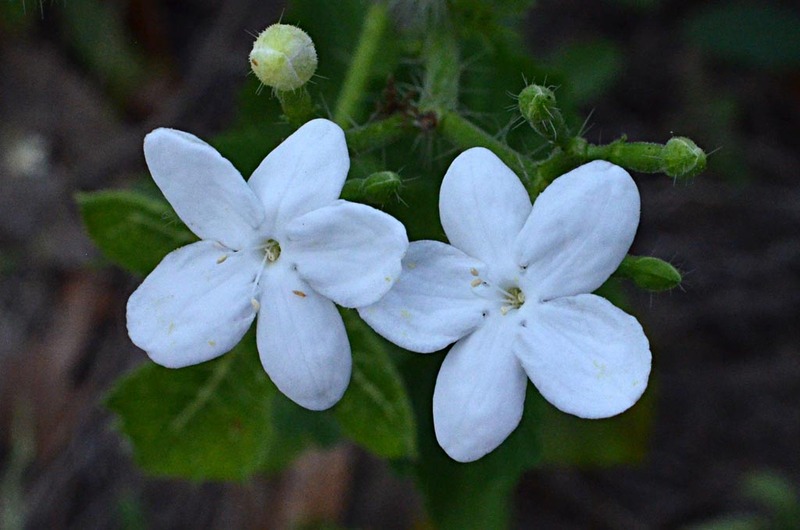 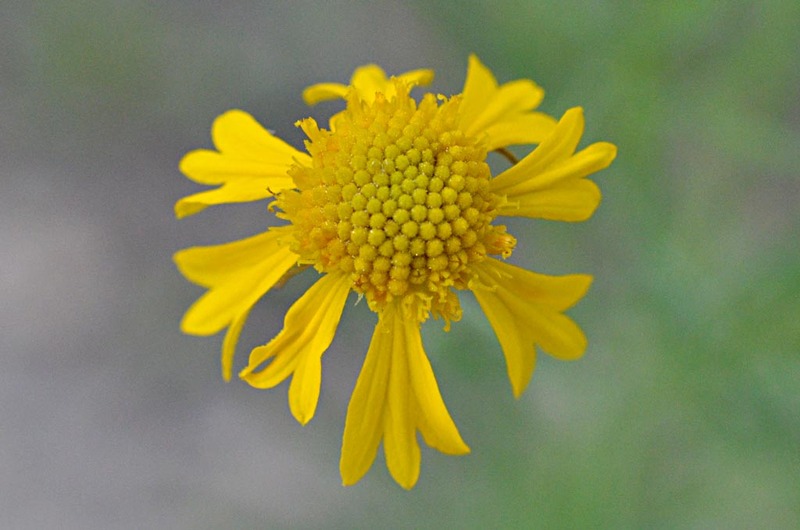 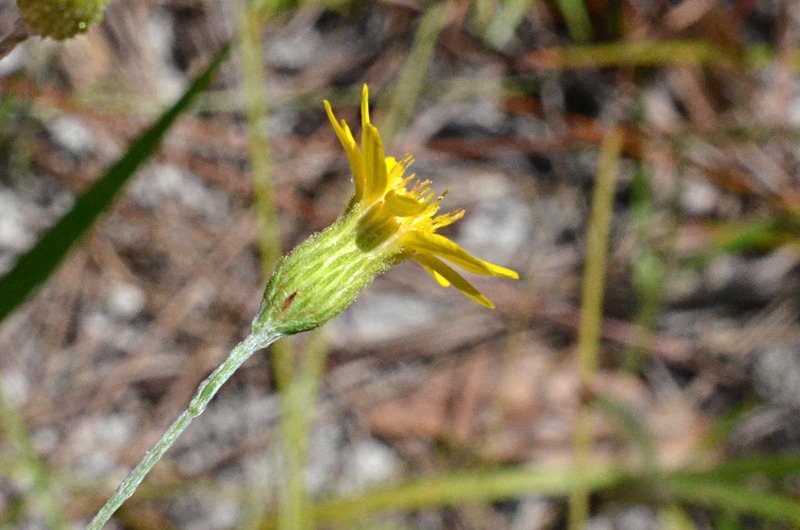 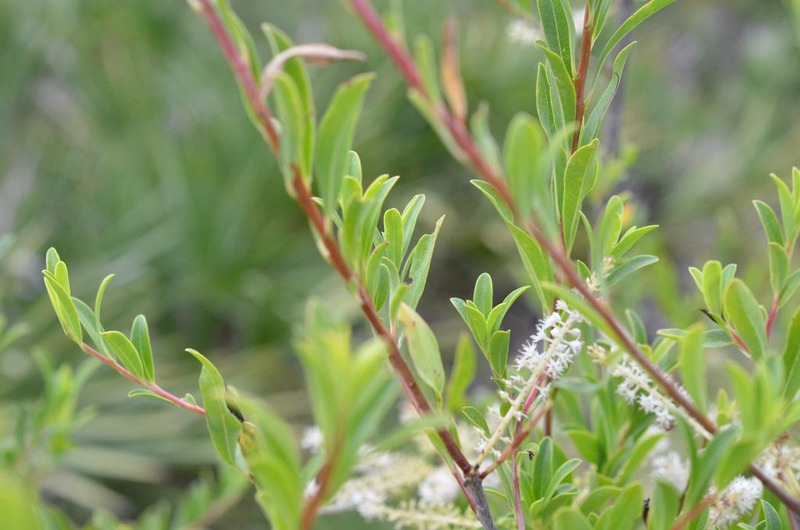 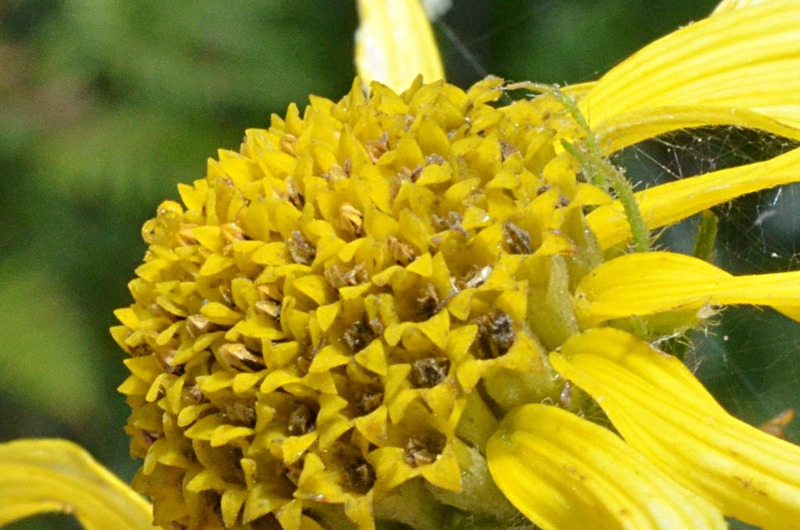 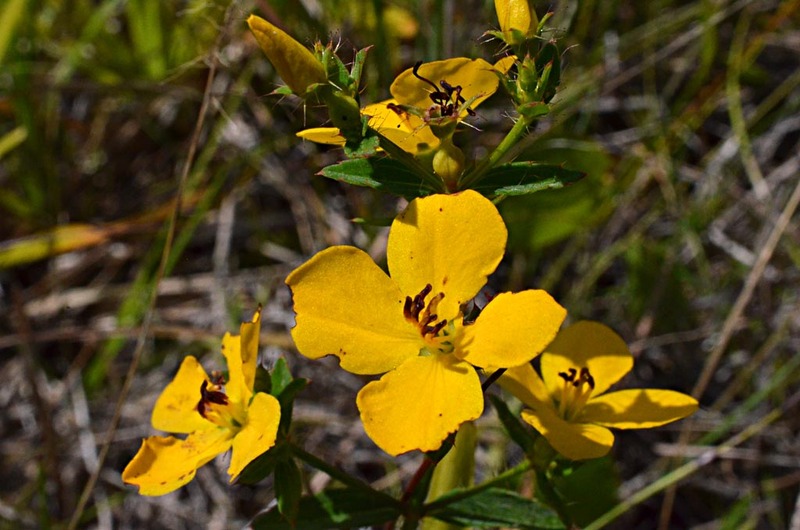 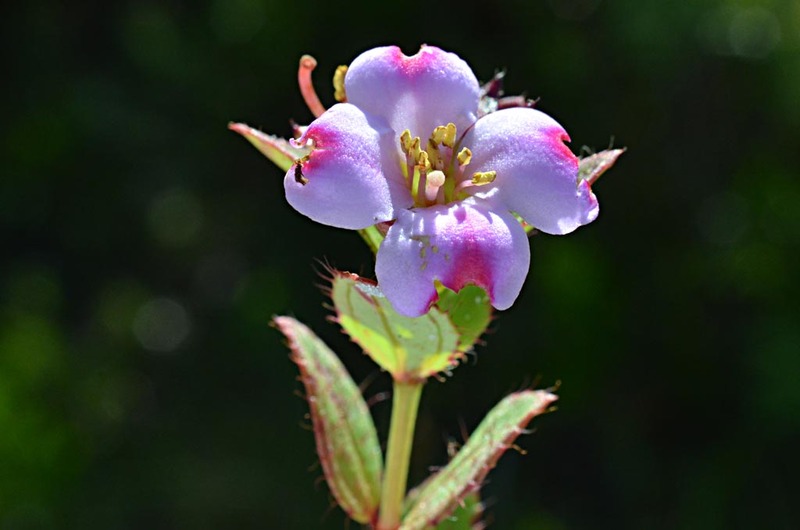 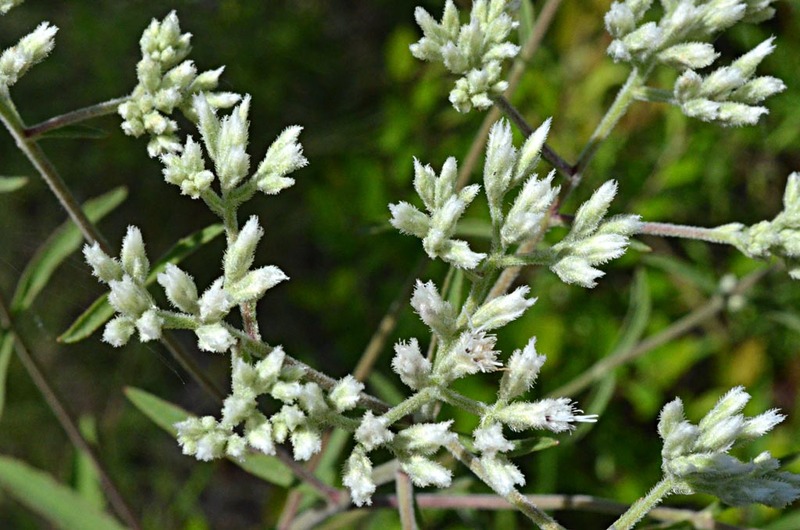 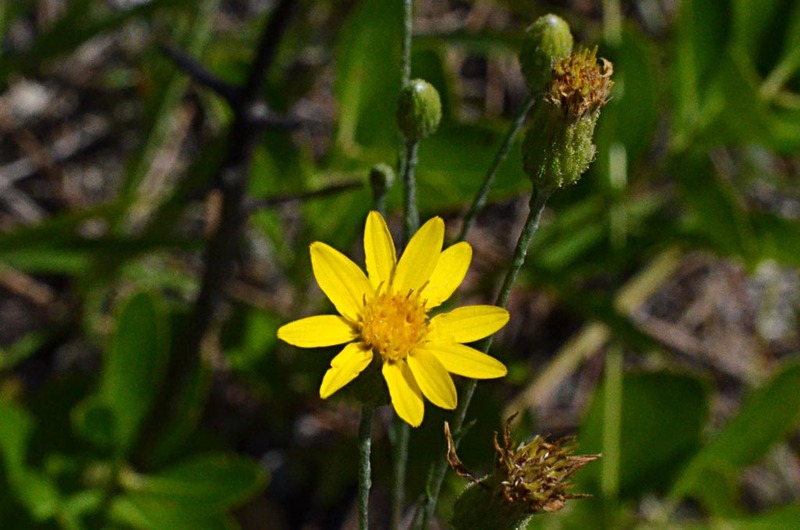 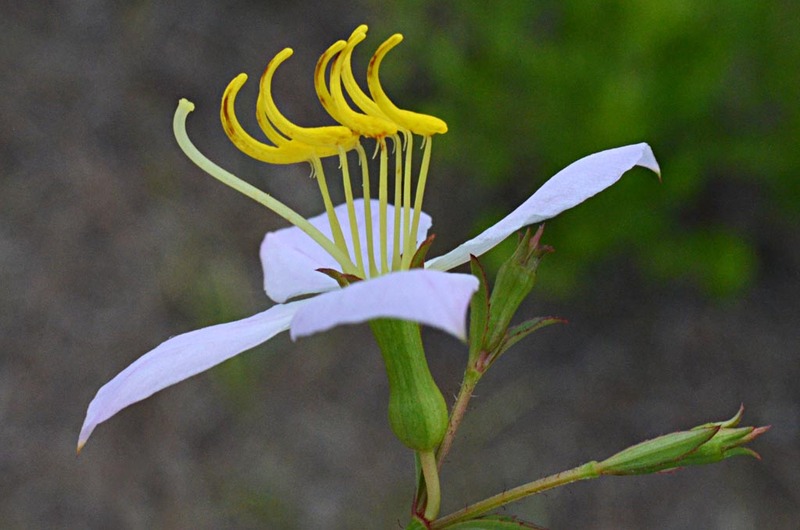 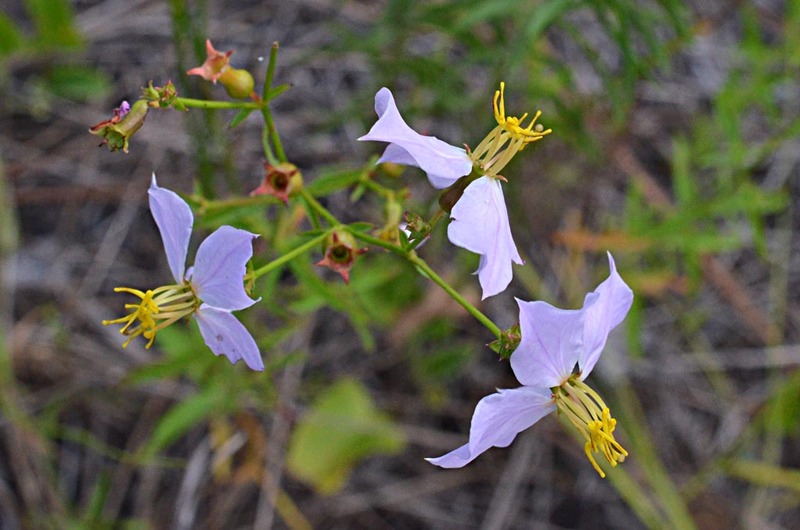 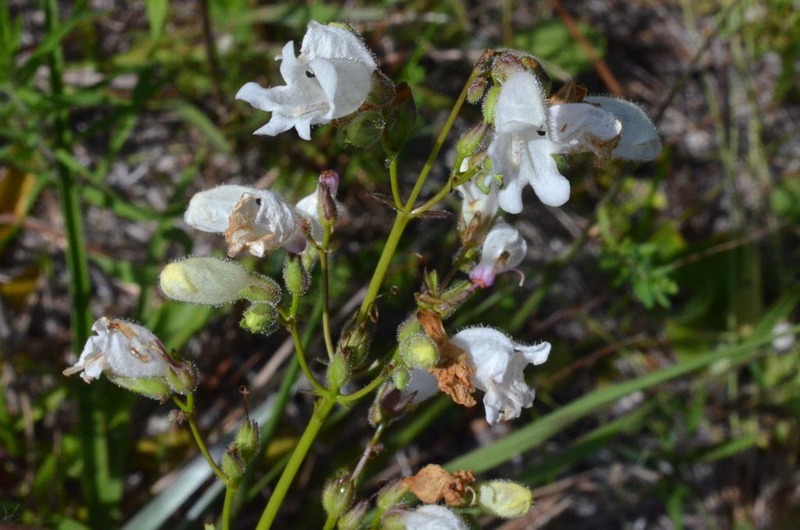 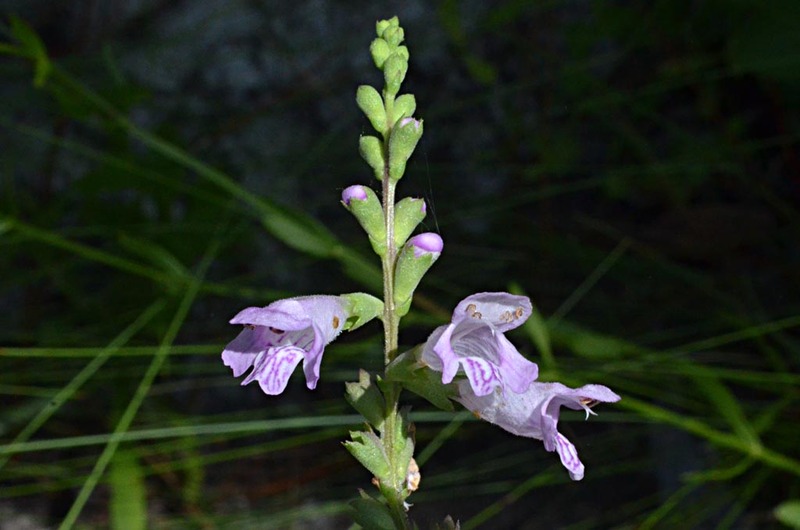 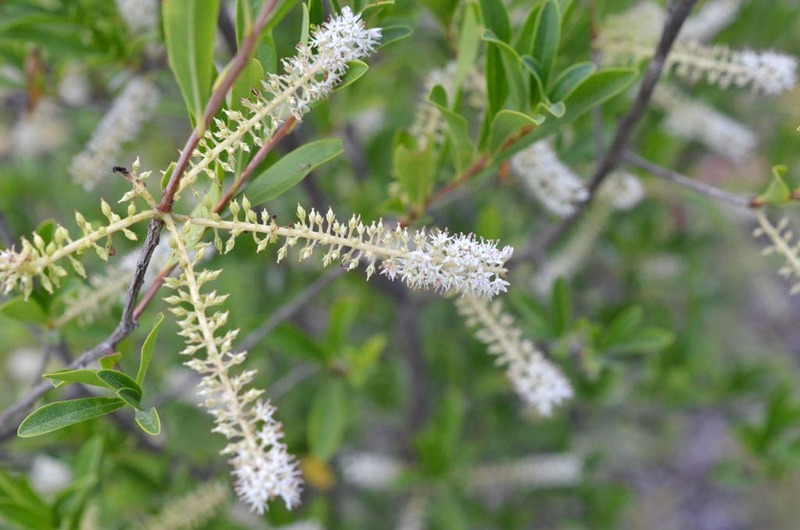 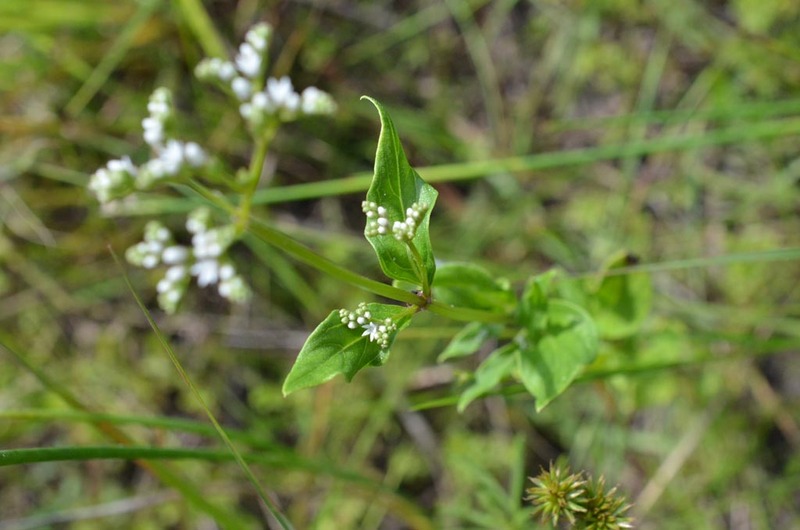 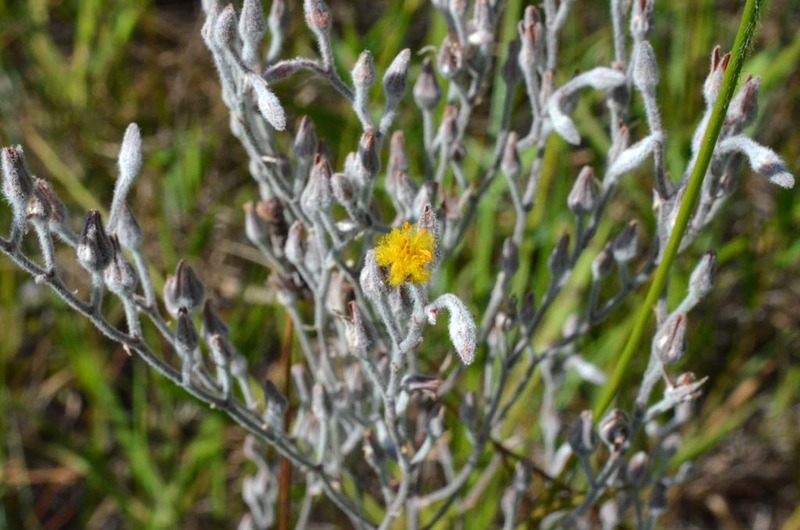 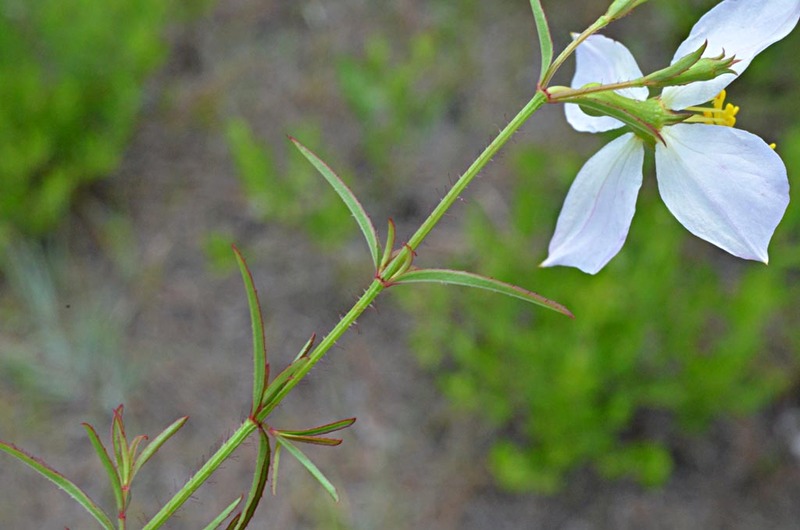 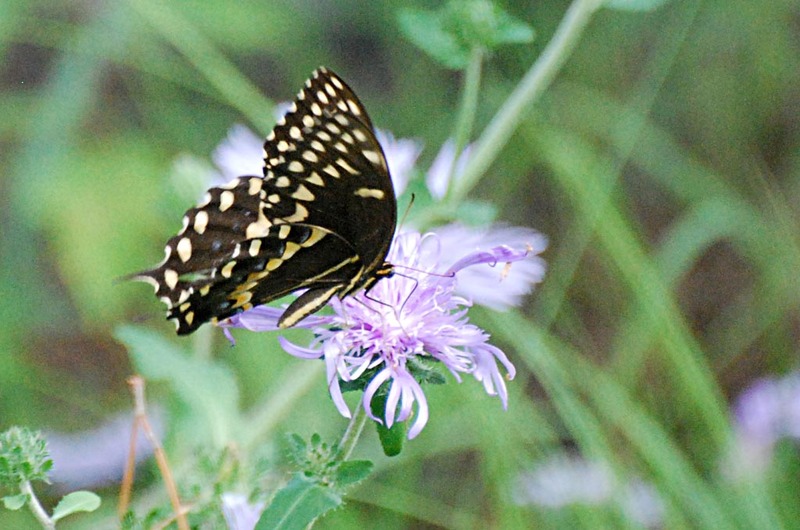 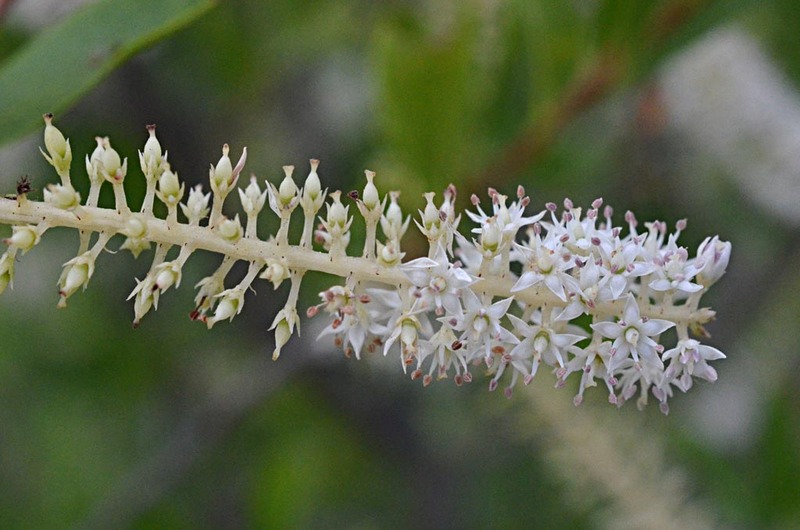 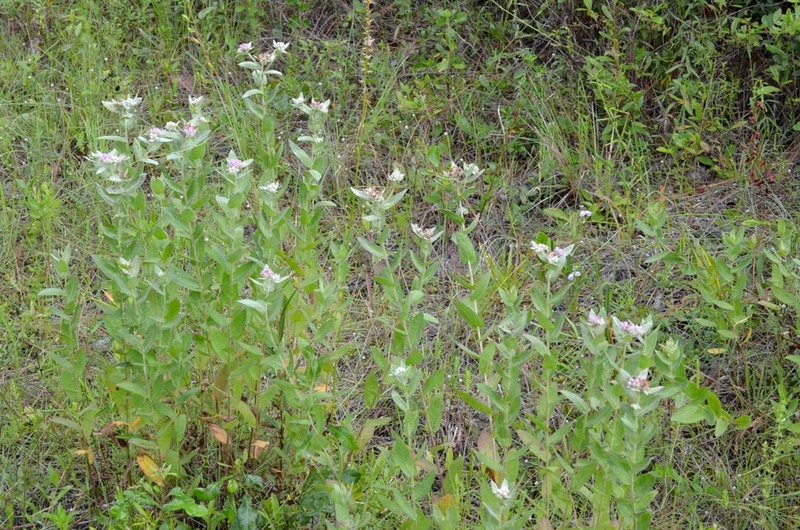 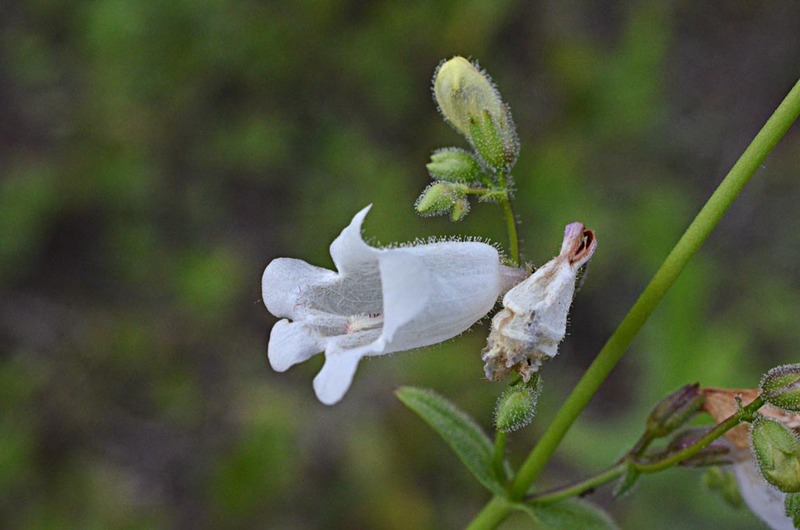 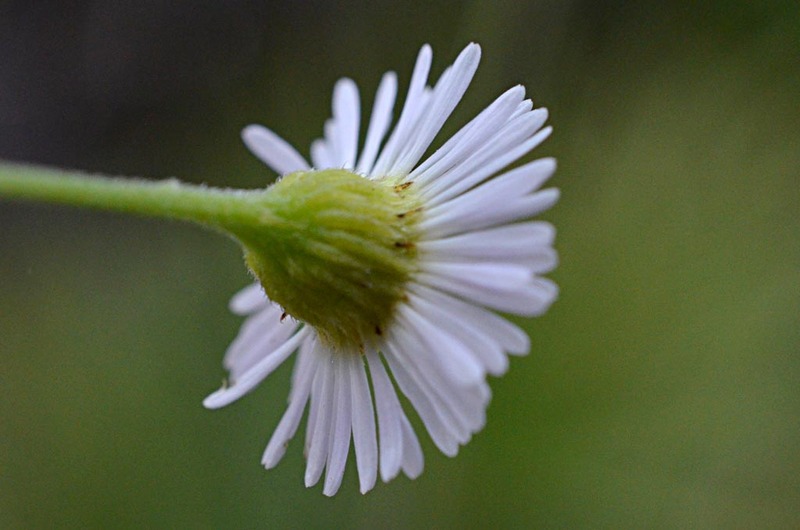 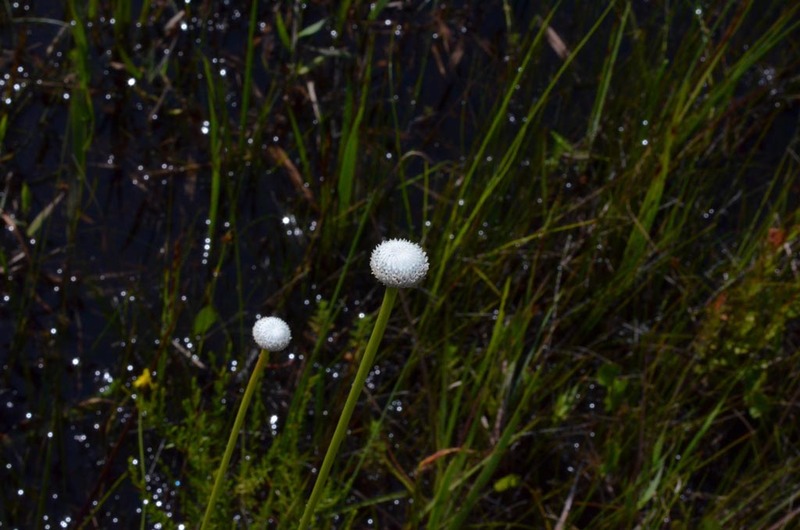 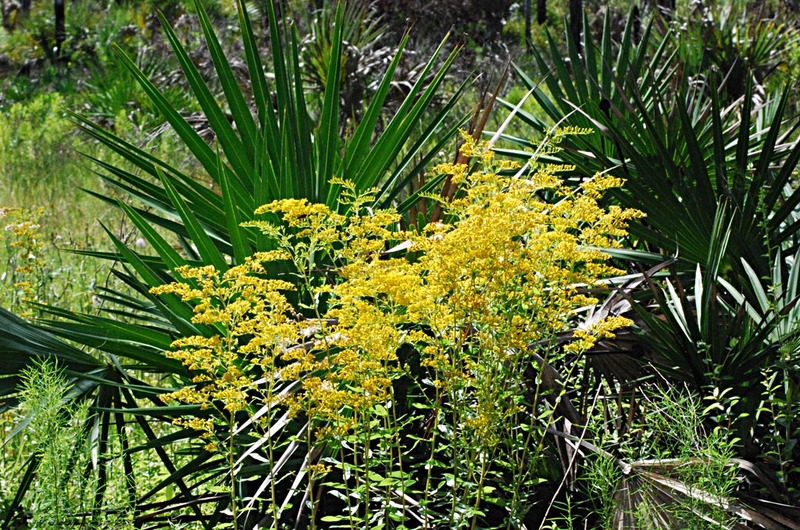 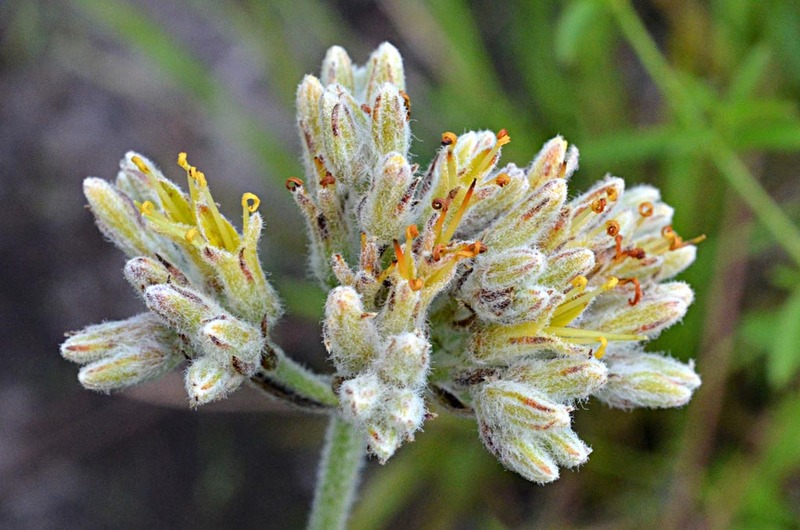 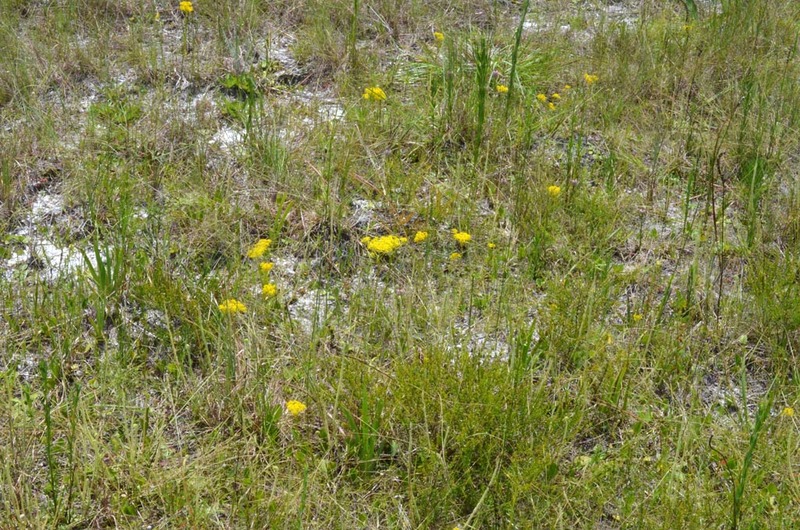 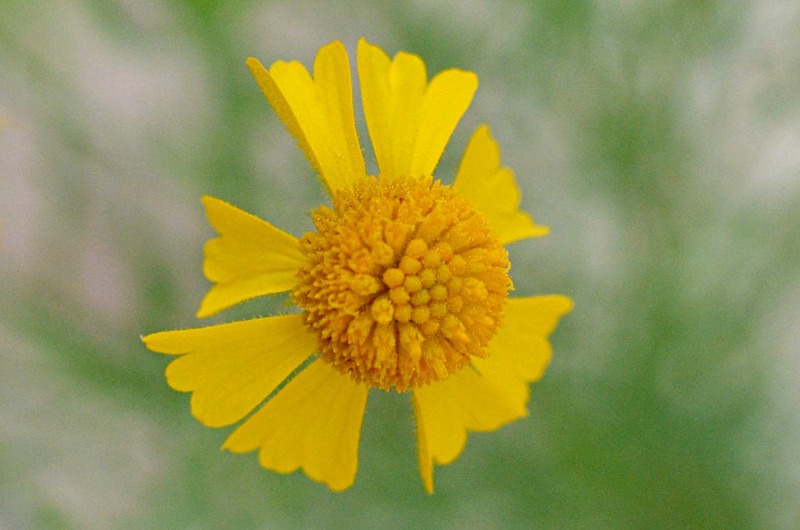 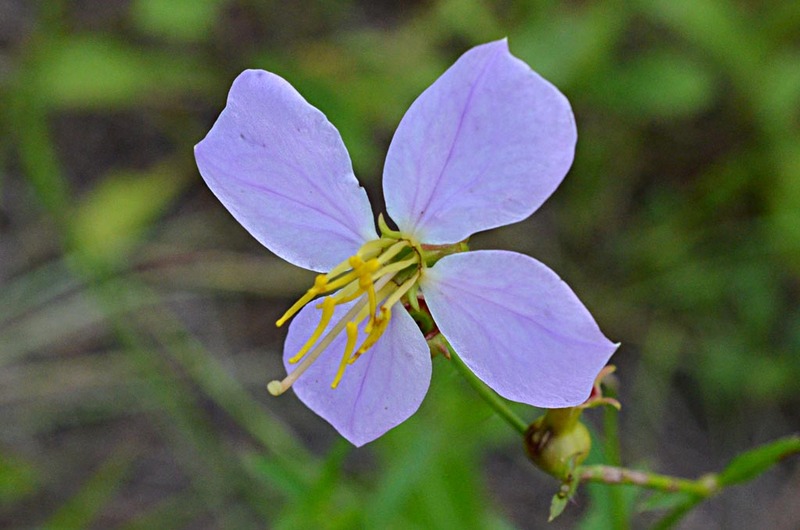 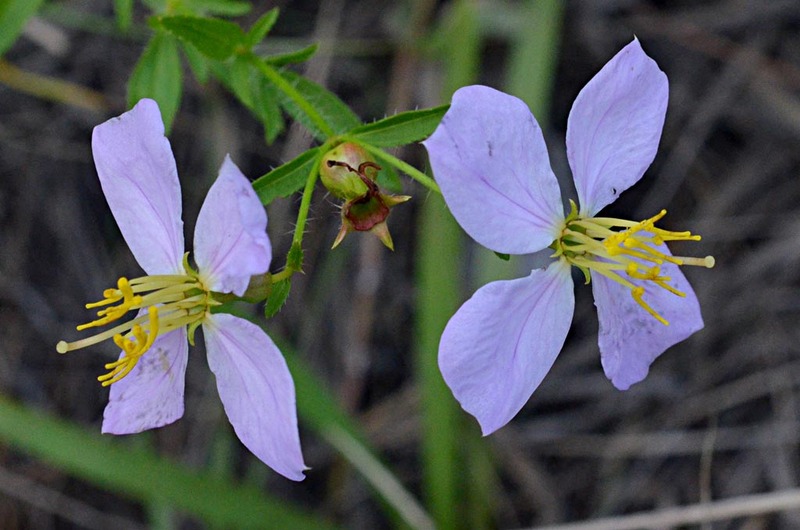 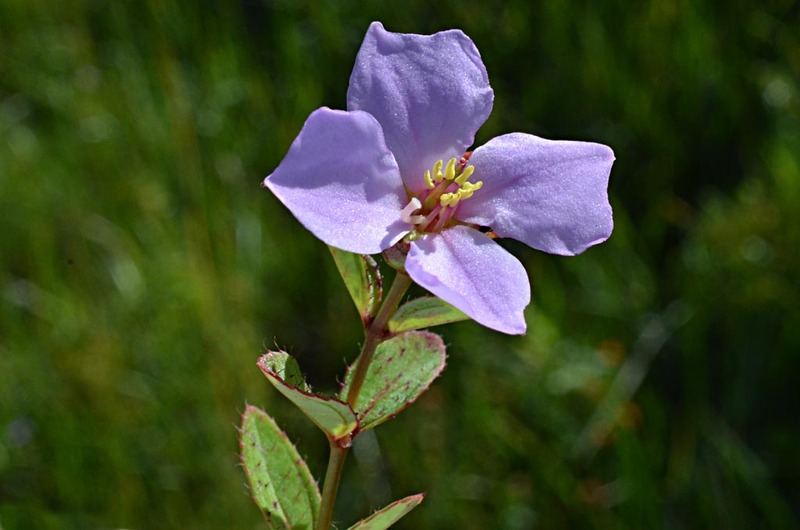 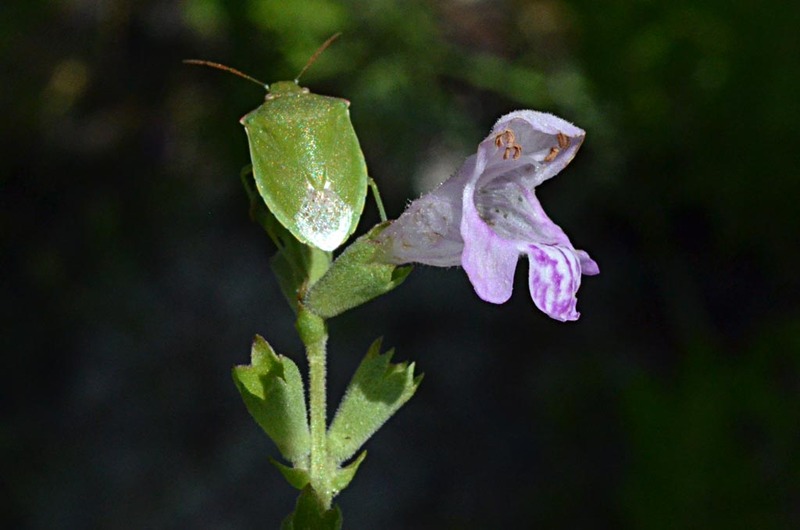 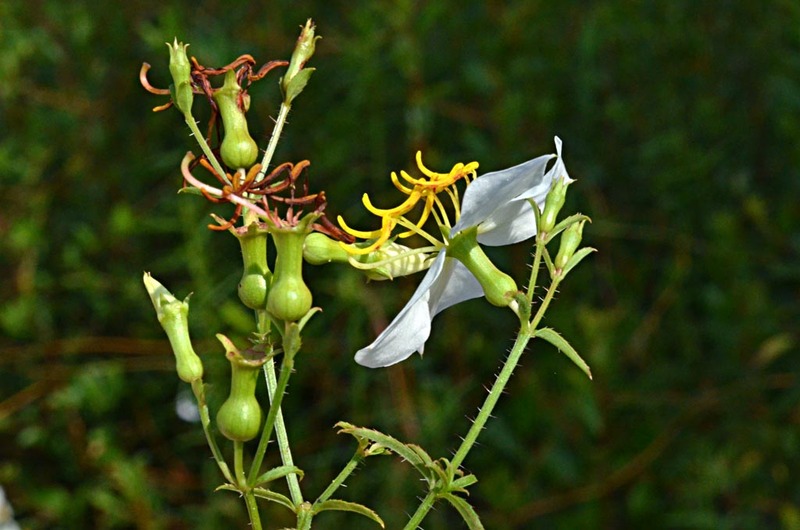 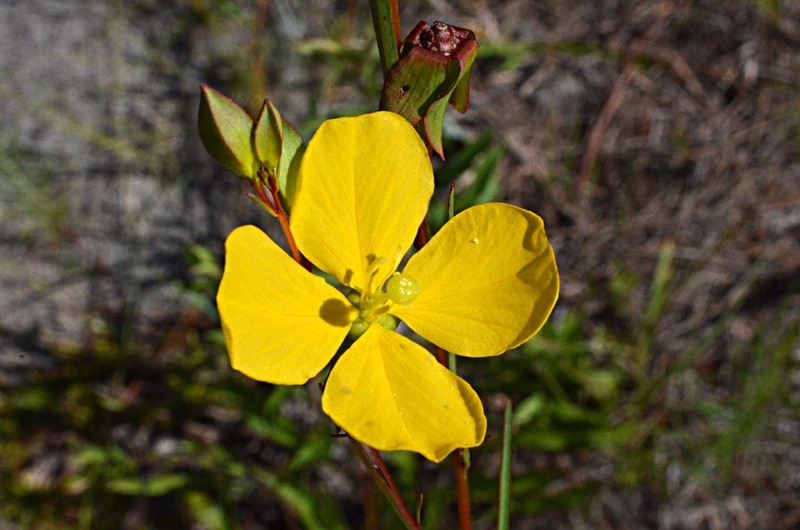 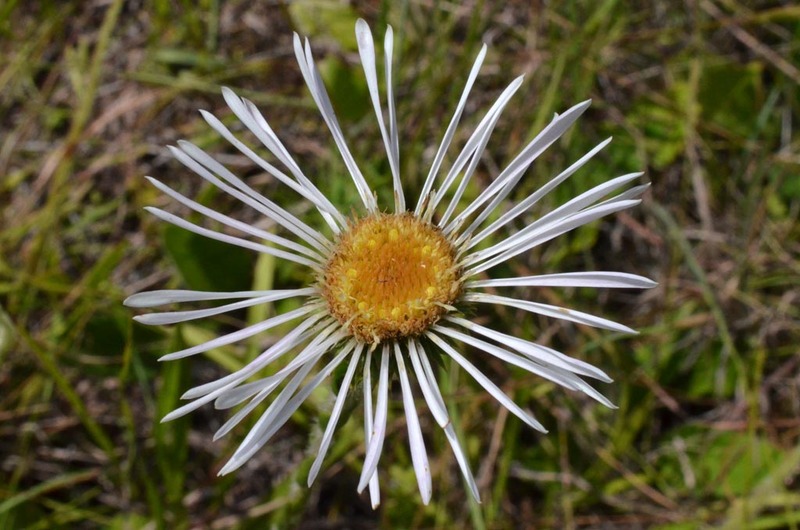 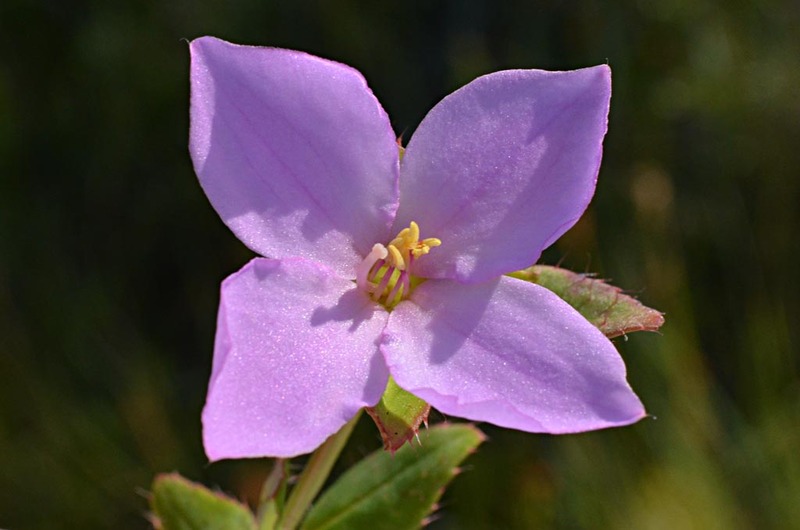 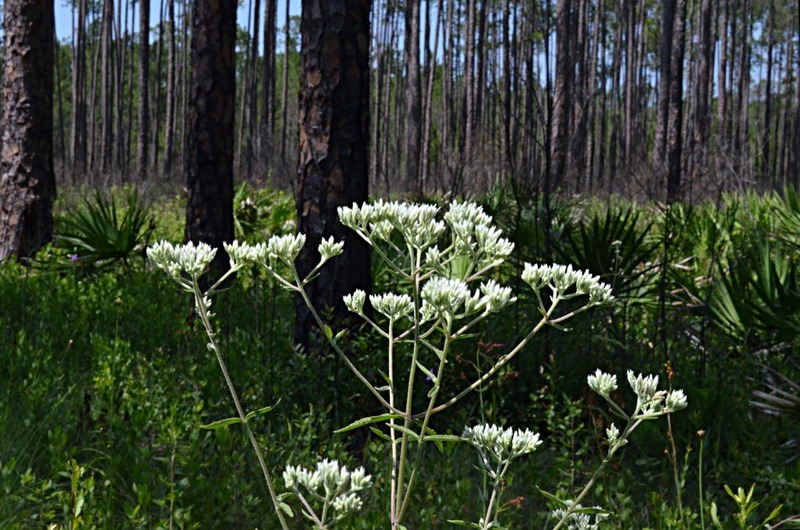 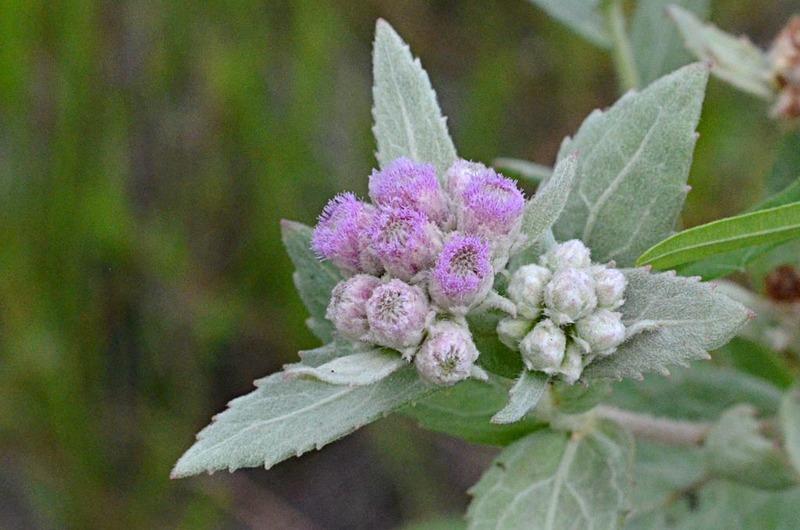 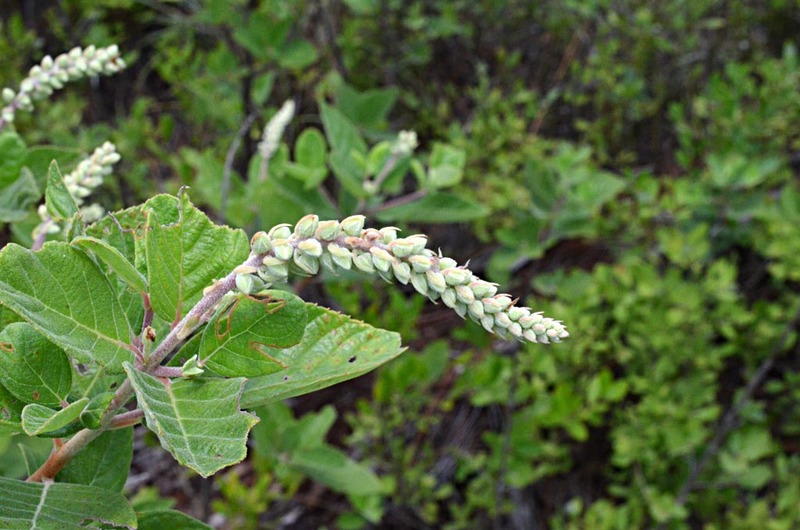 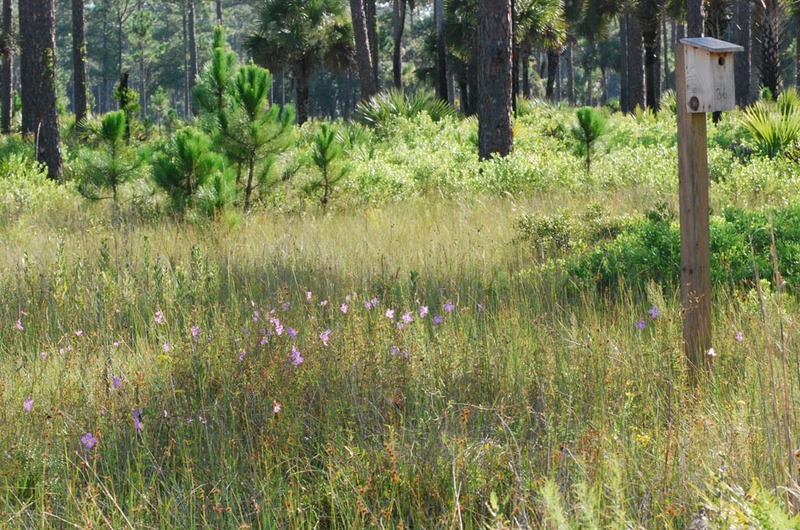 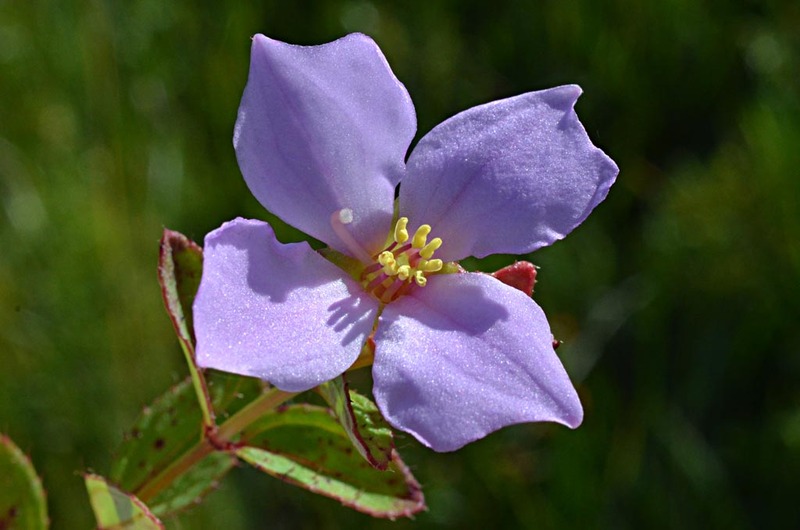 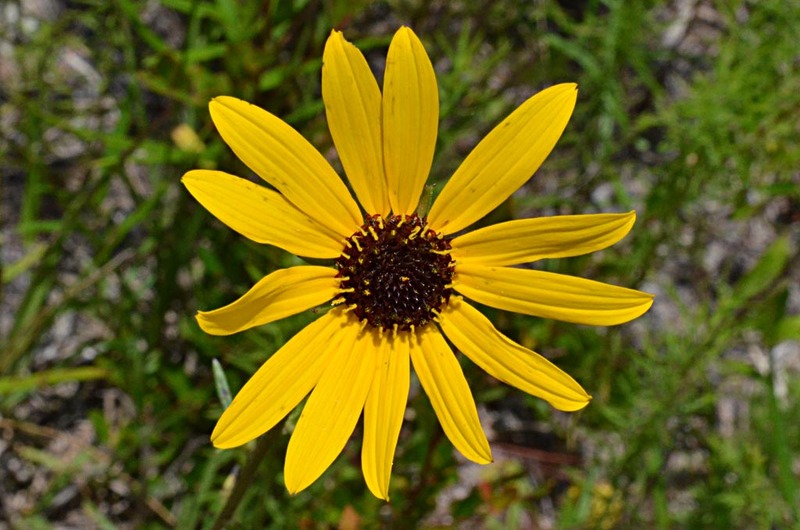 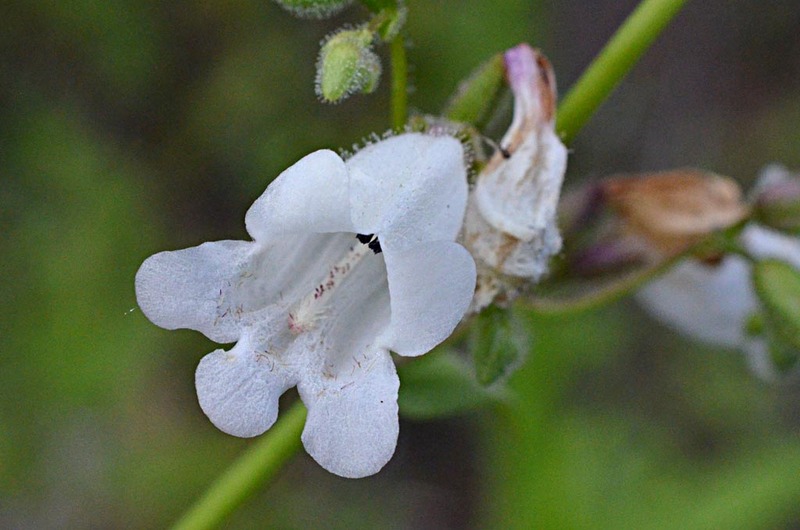 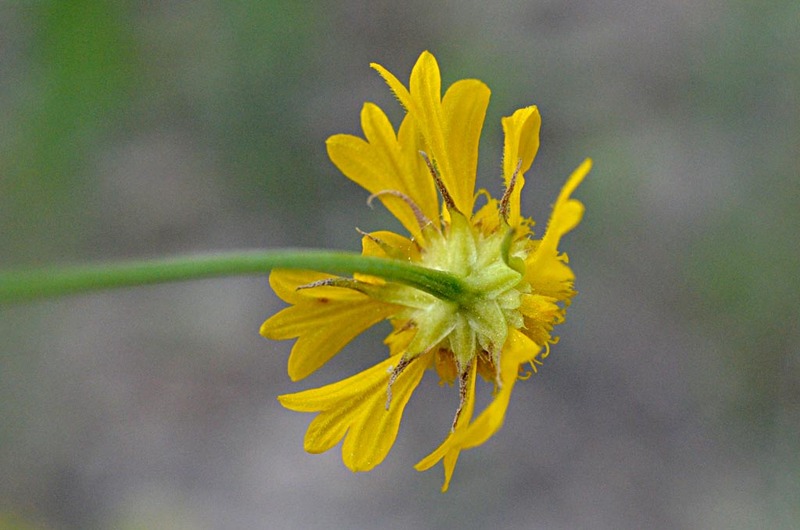 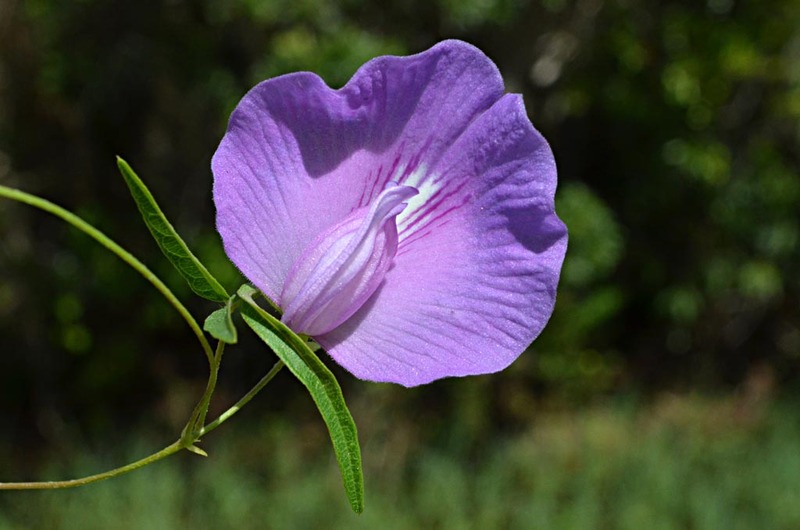 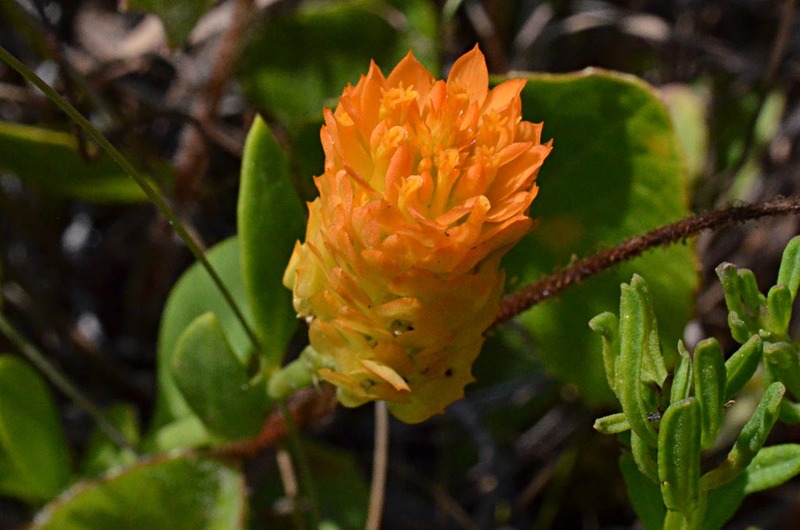 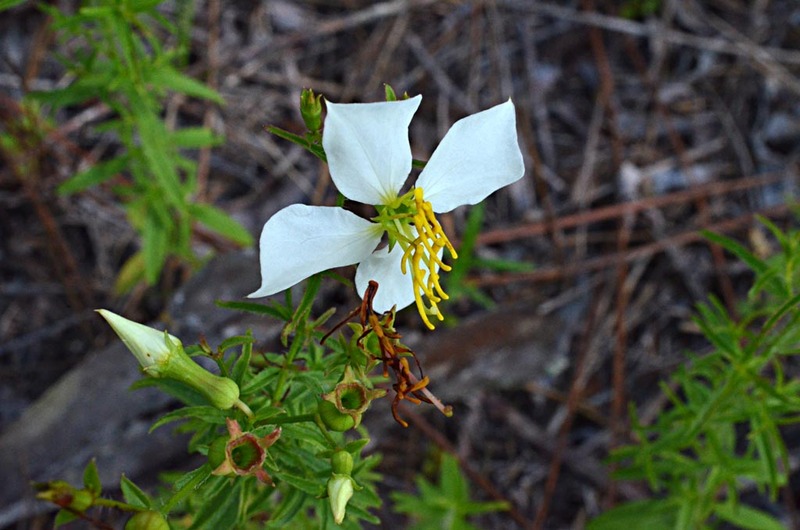 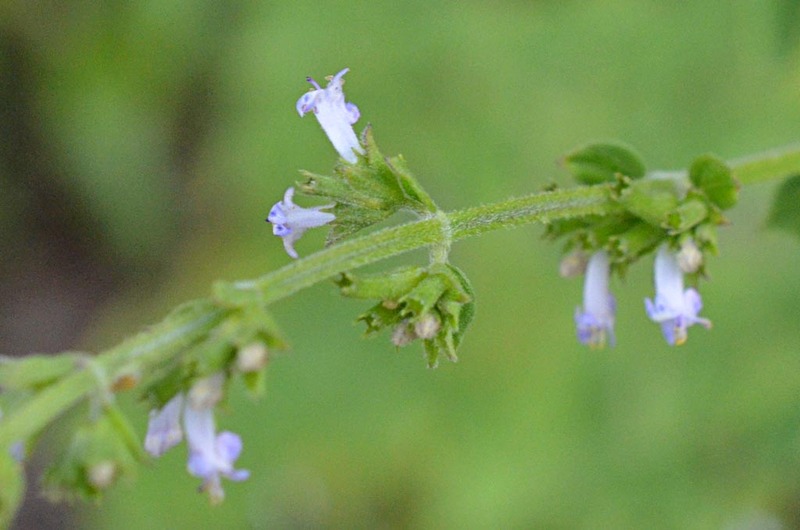 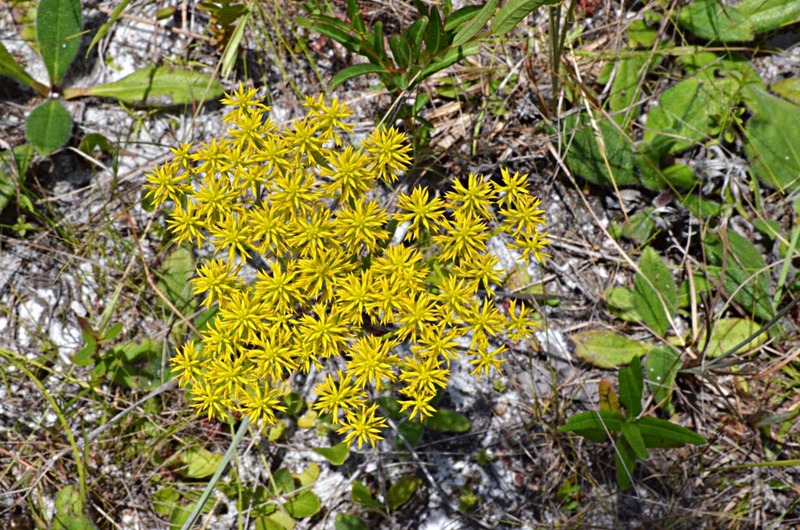 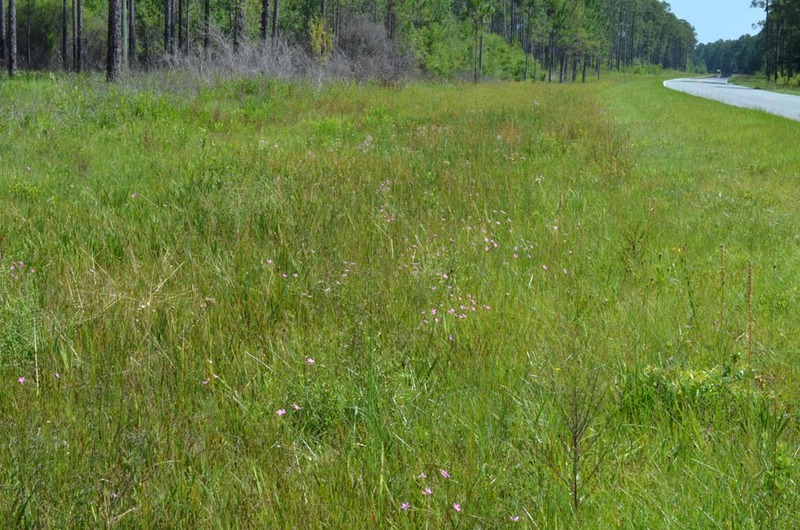 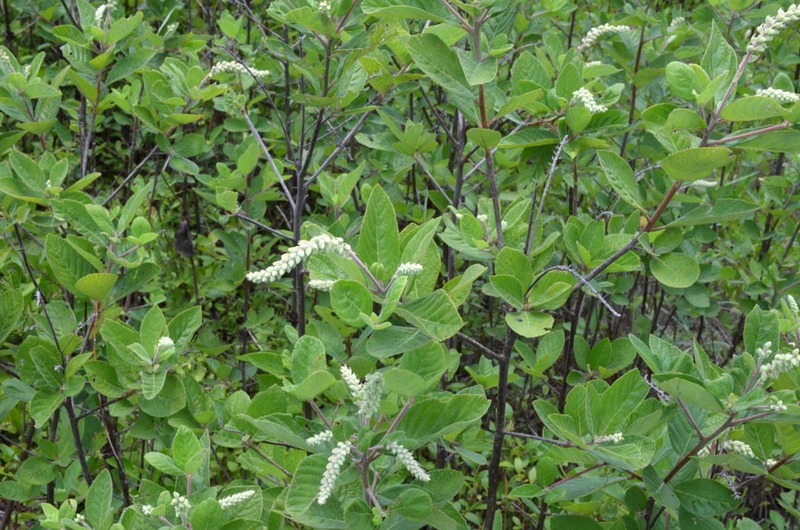 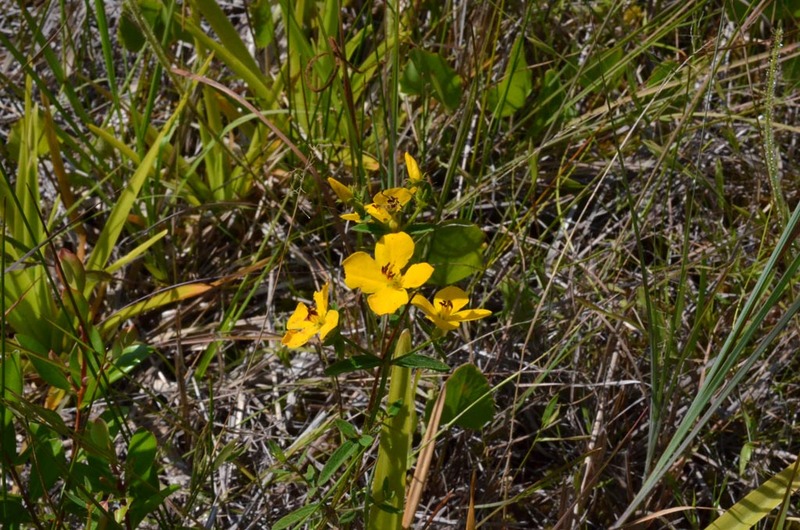 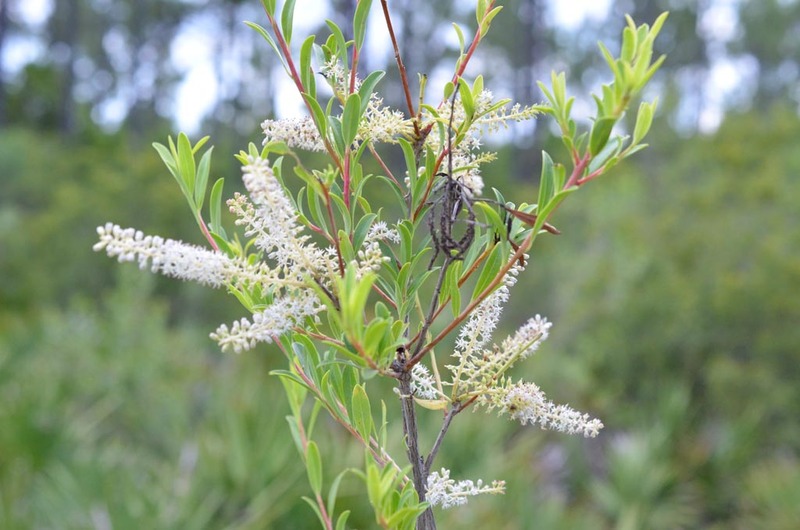 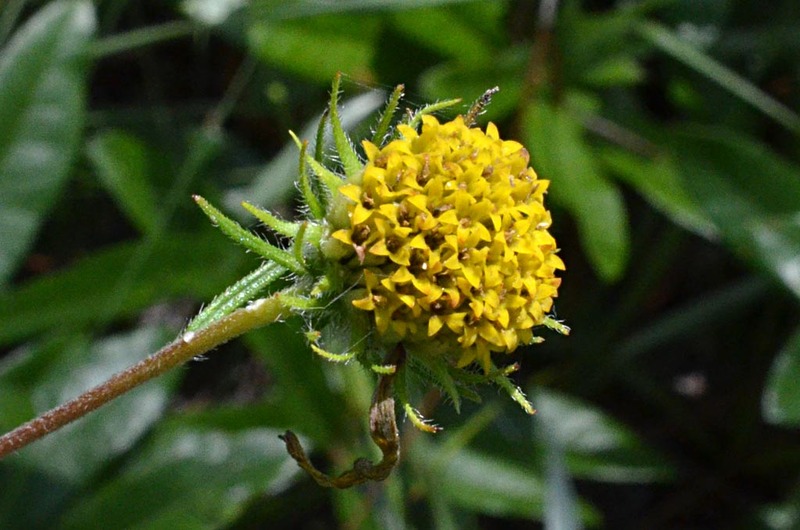 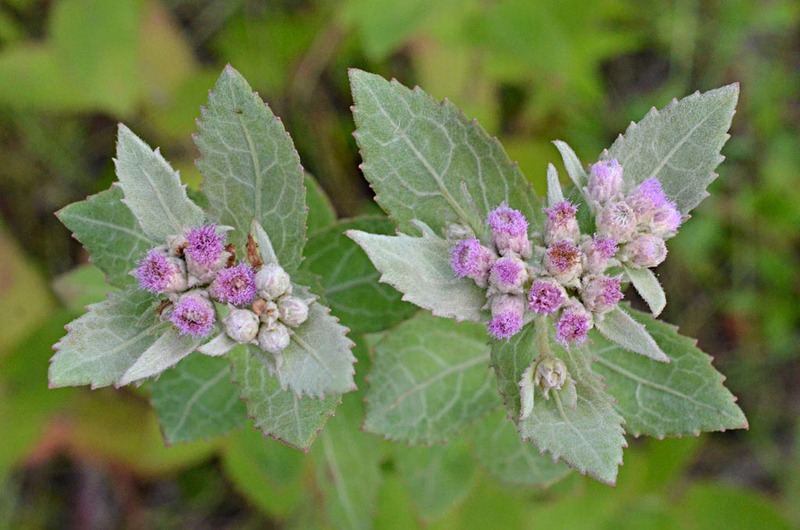 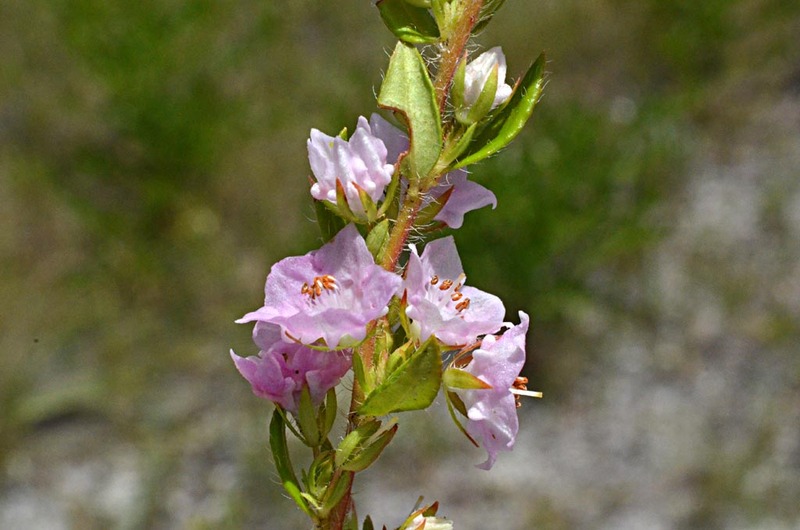 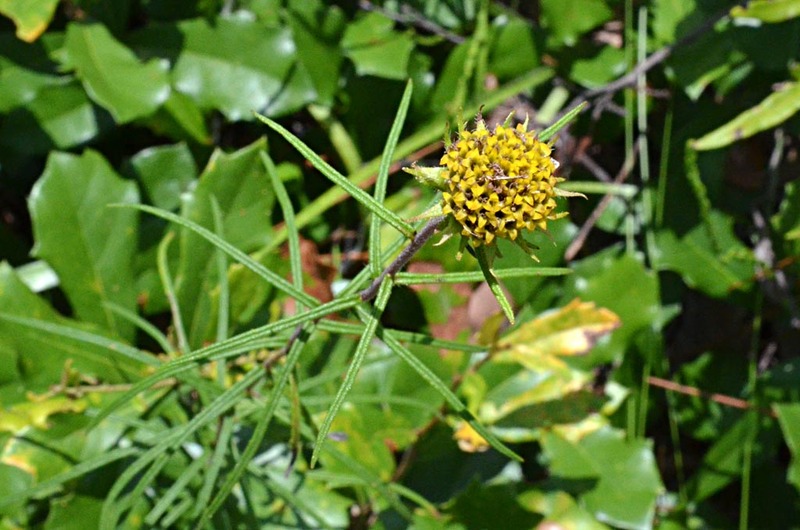 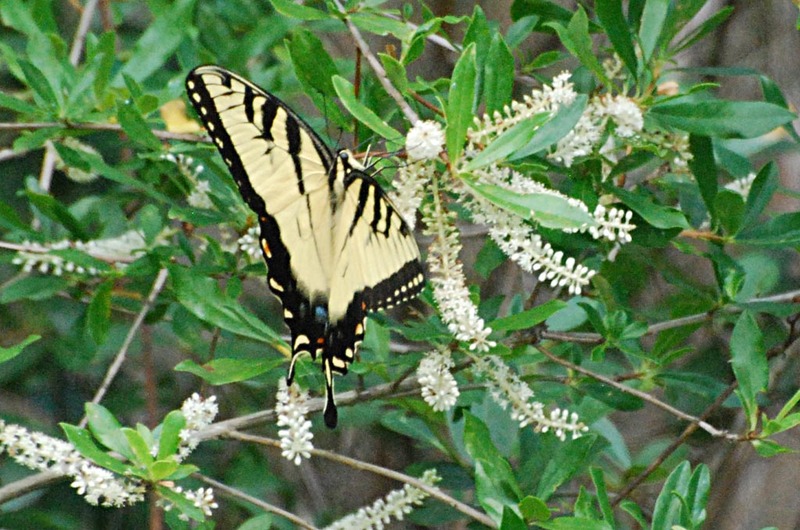 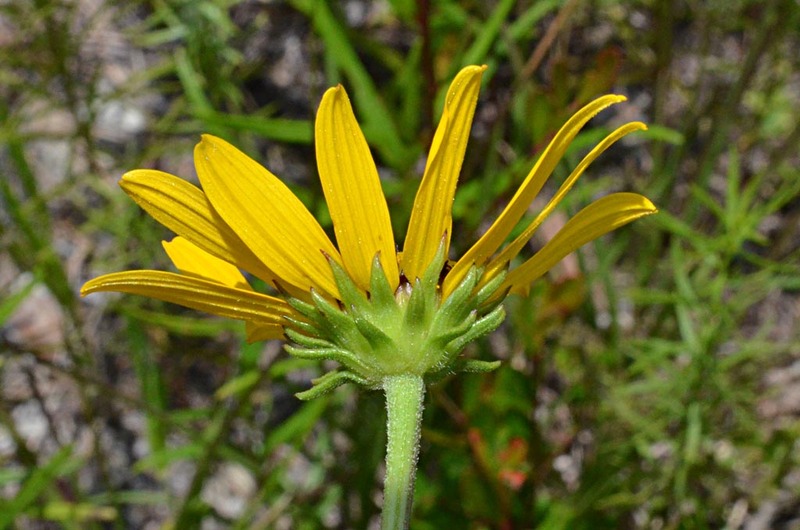 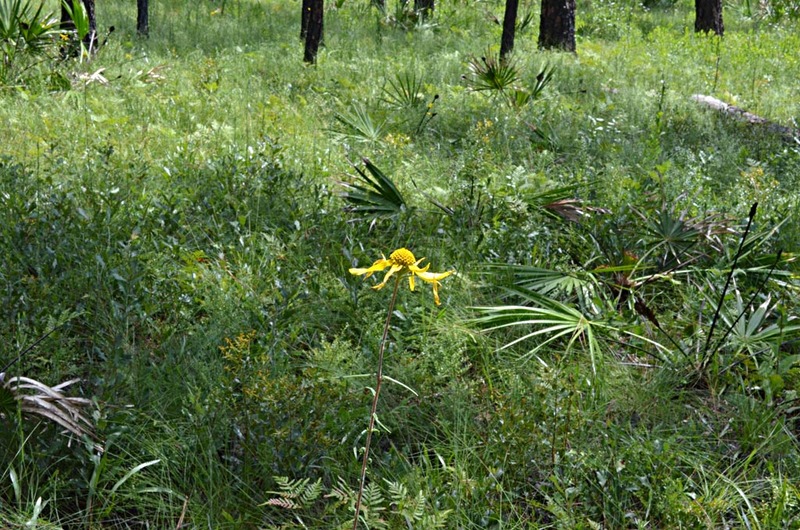 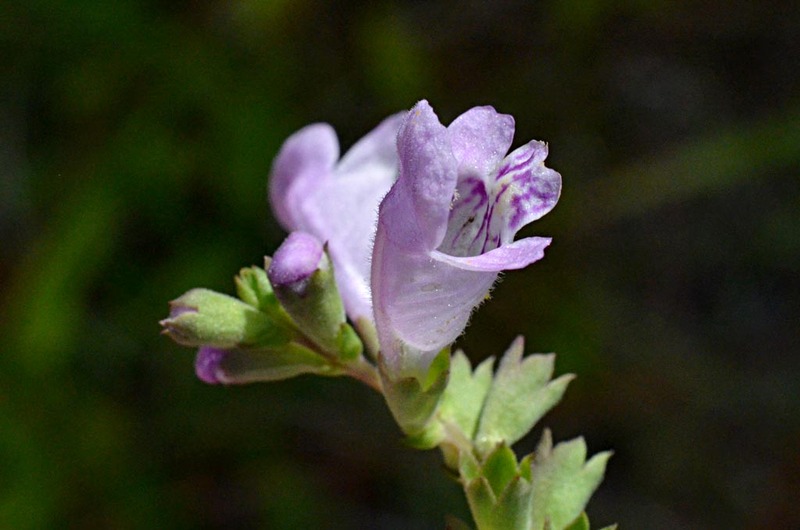 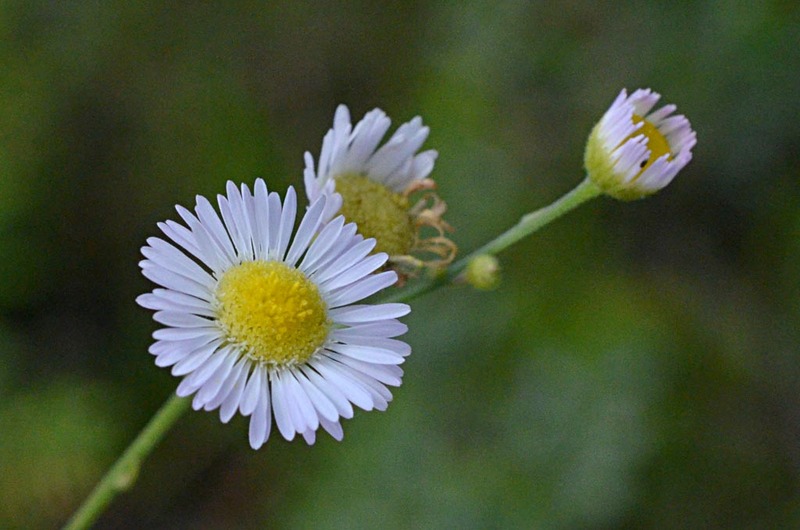 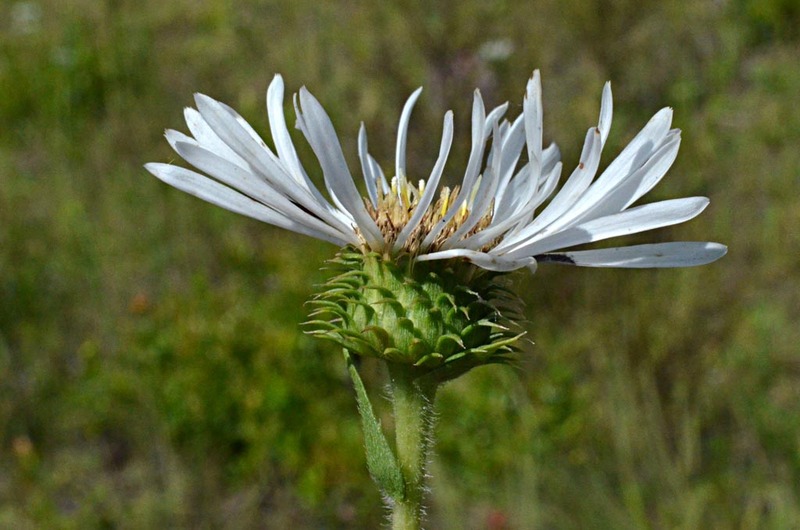 Eight species are new to this blog: Barbara's buttons, Water dawnflower, Tall ironweed, Low pinebarren milkwort, Pineland false sunflower, Coastal sweetpepperbush, White meadowbeauty/Apalachicola meadowbeauty, and Yellow meadowbeauty. 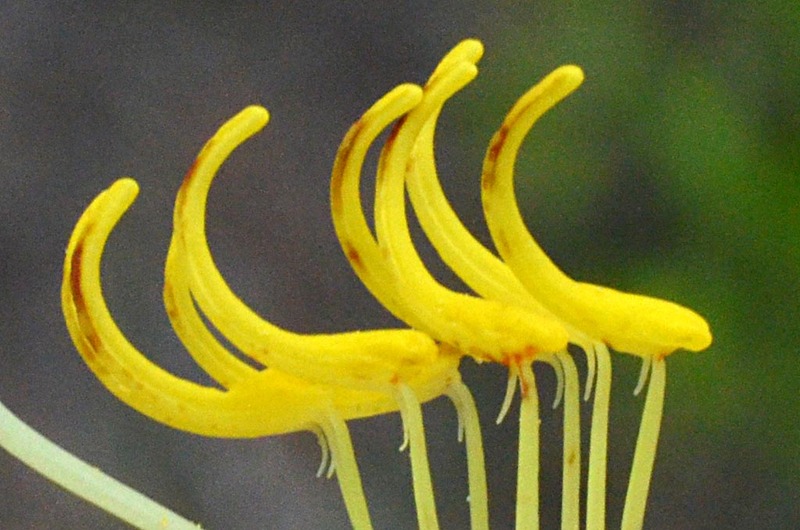 Four remain unidentified. 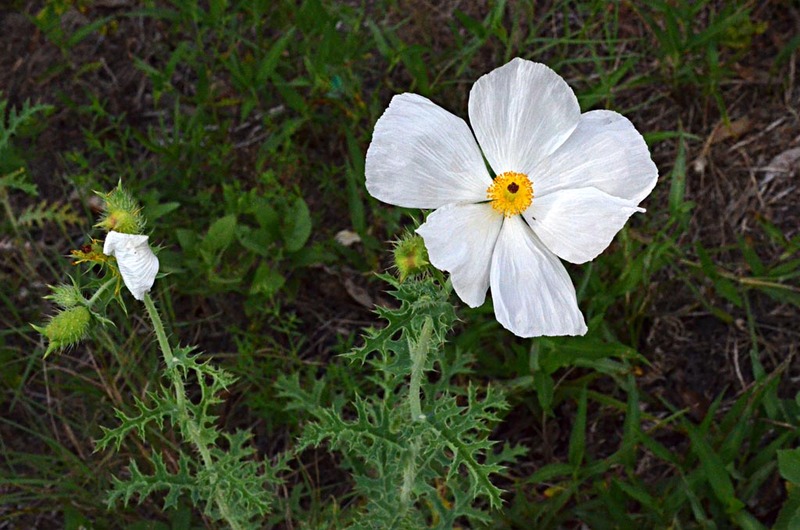 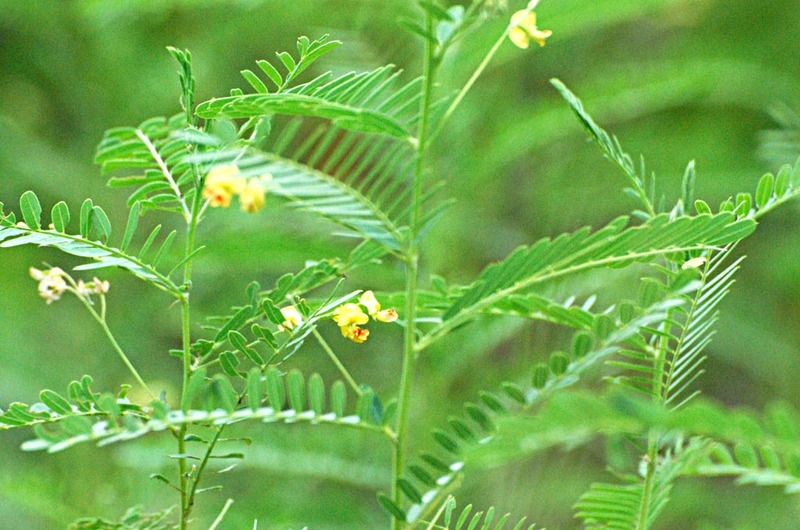 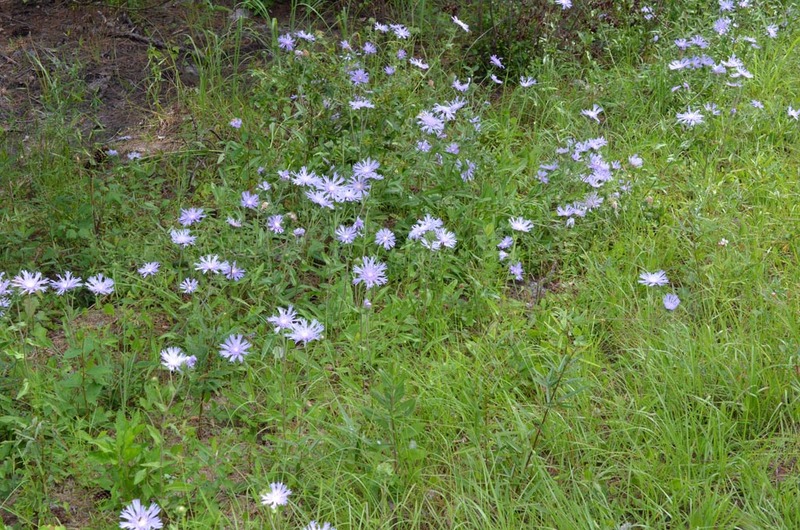 All plants shown below are native, unless otherwise specified. 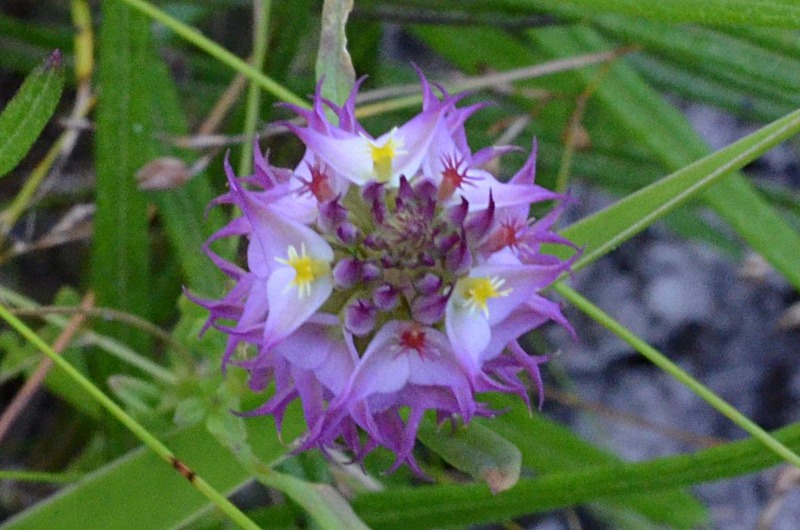 Found a few miles west of Sopchoppy in a swale on SR-375, near FR-339. 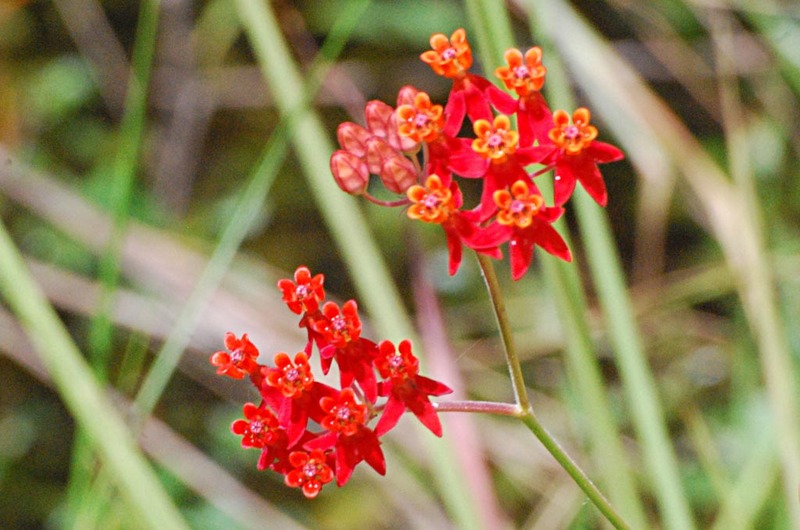 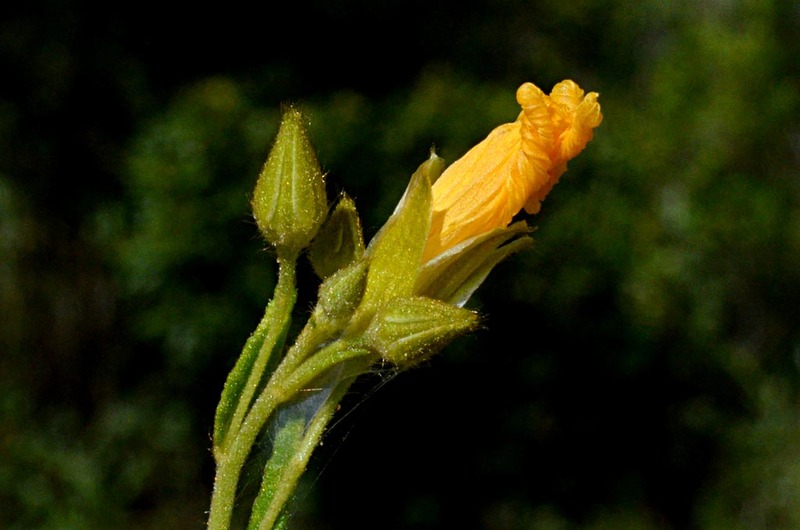 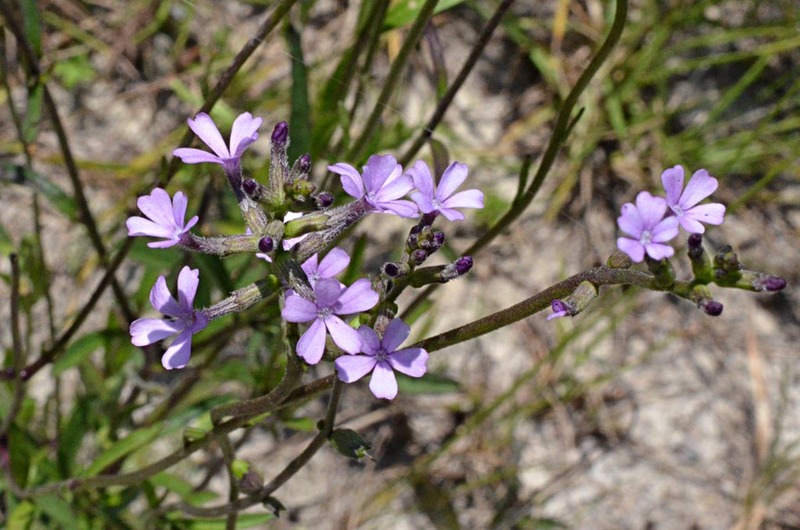 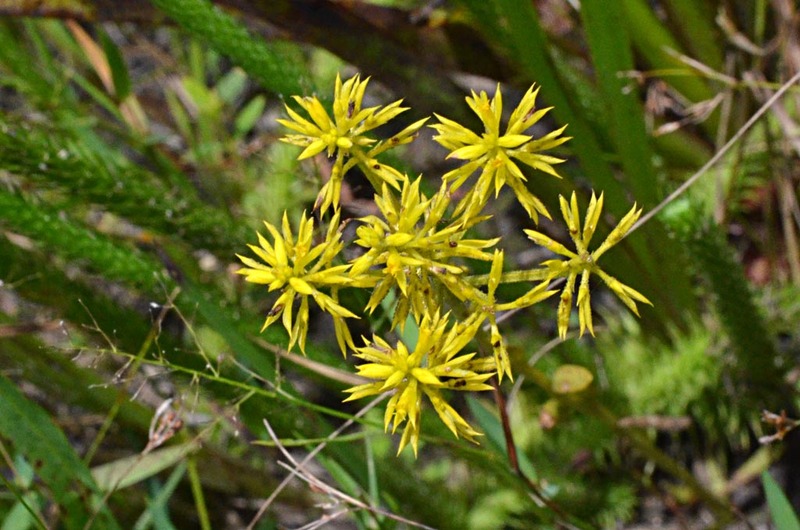 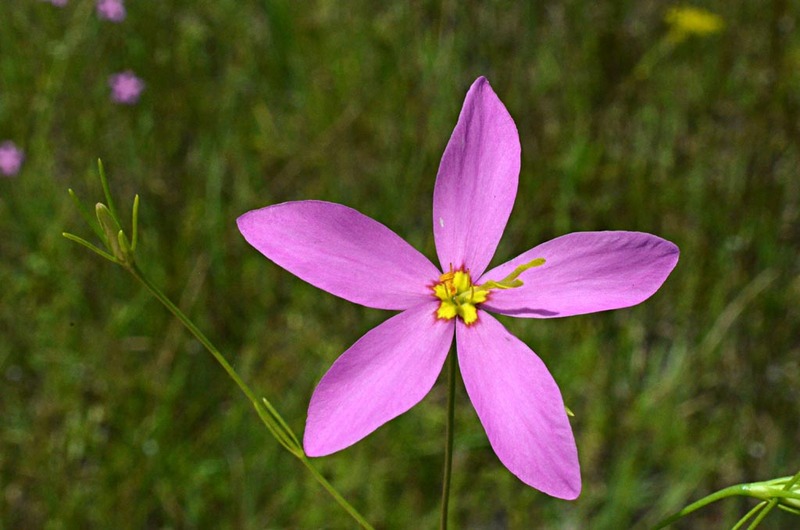 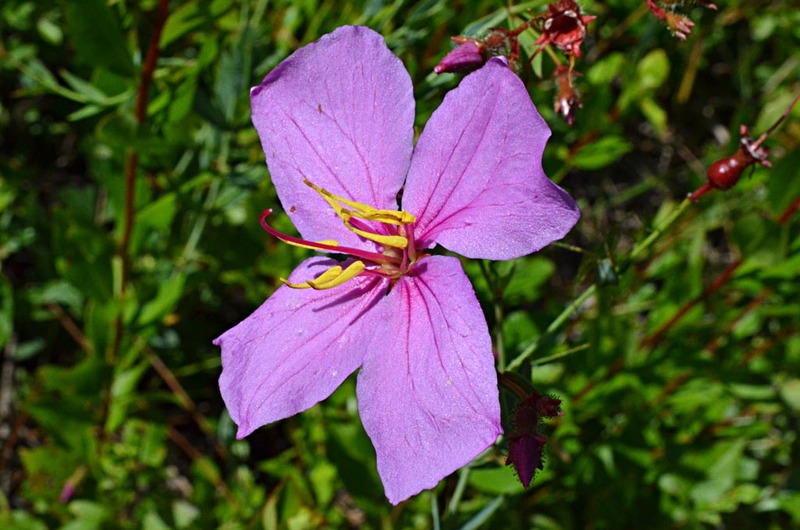 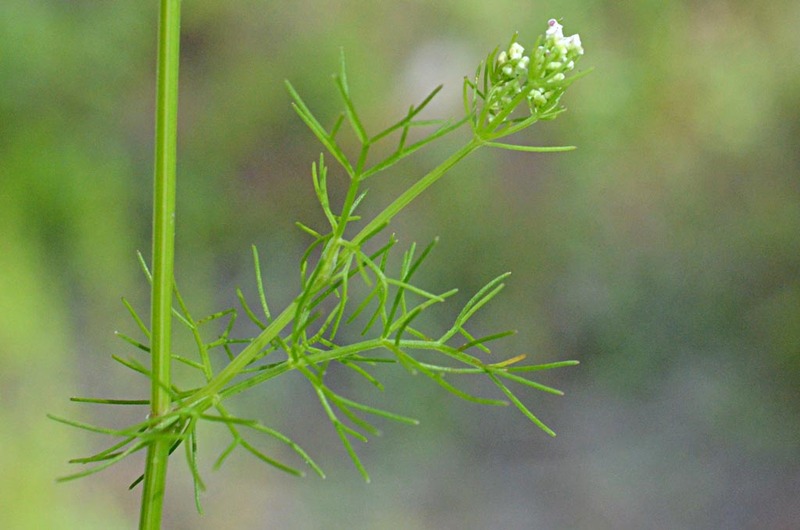 This flower does not match any Marshallia in the Plant Atlas. 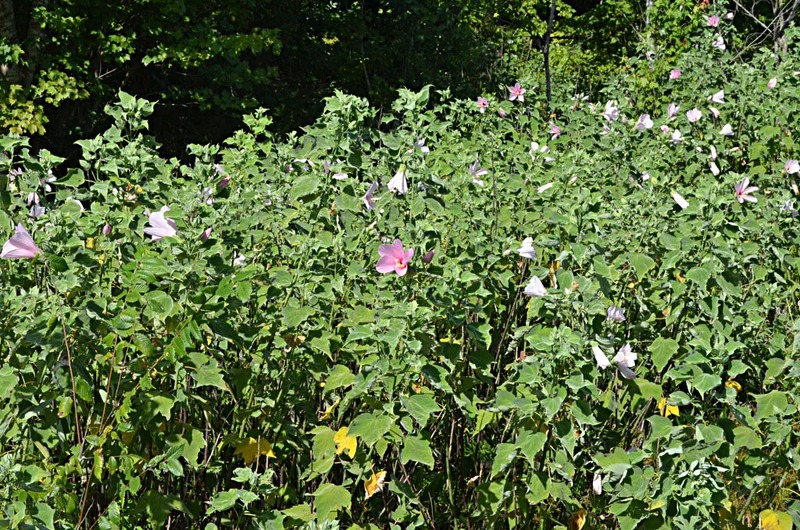 It might be an escape from someone's garden. 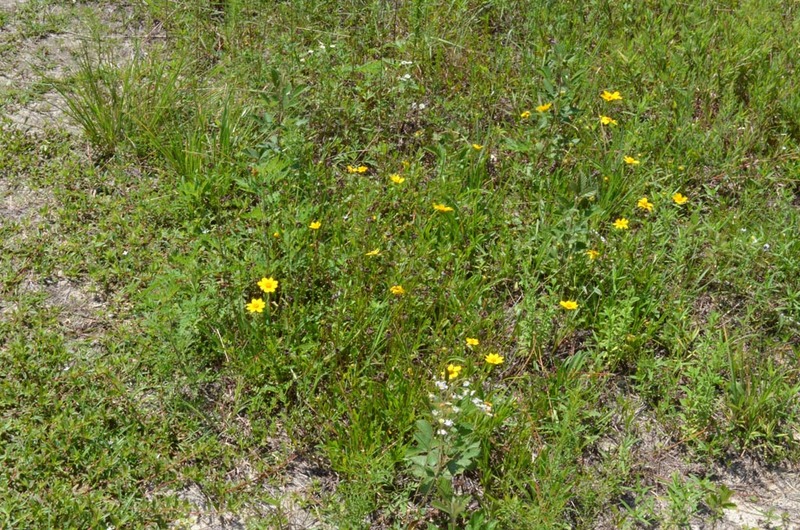 Several homes were nearby. 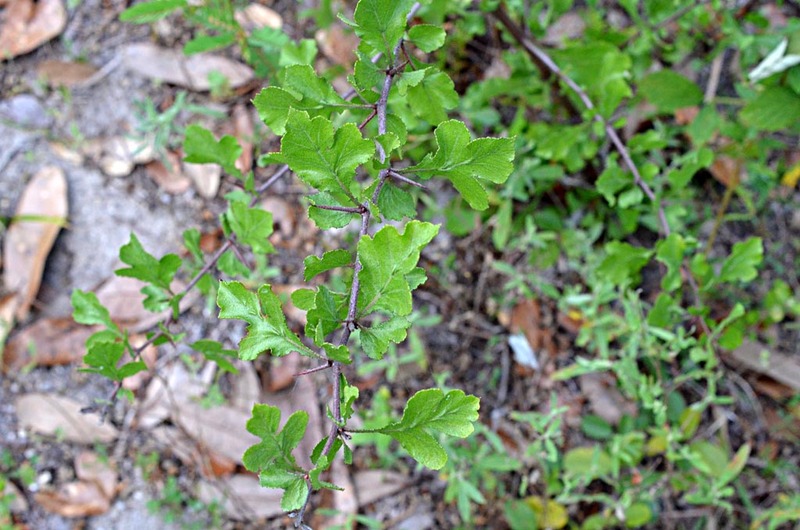 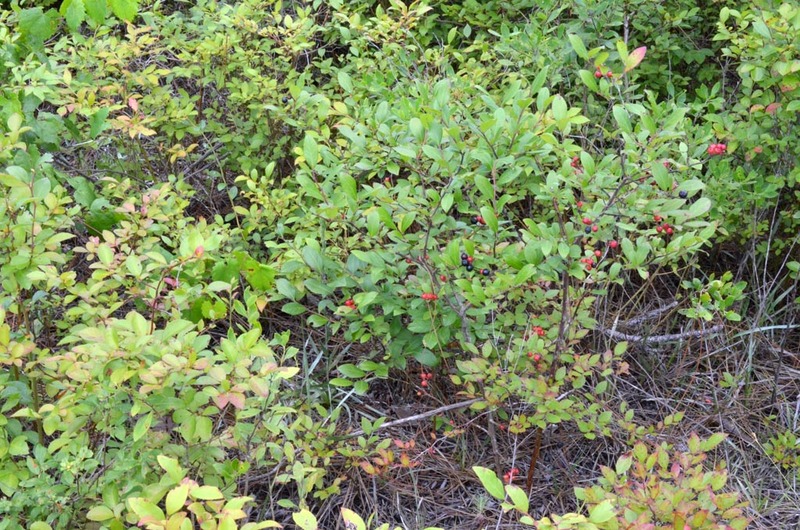 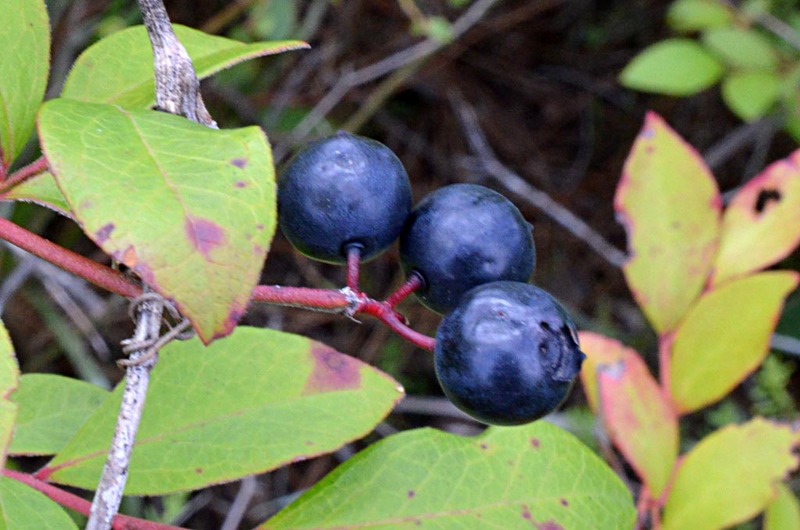 A small, low hawthorn found in a vacant field next to the Best Western motel south of Crawfordville on US-98. 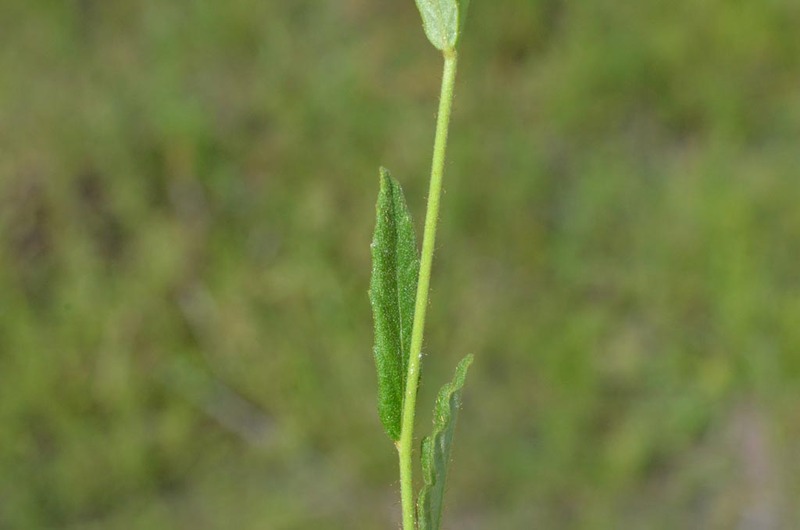 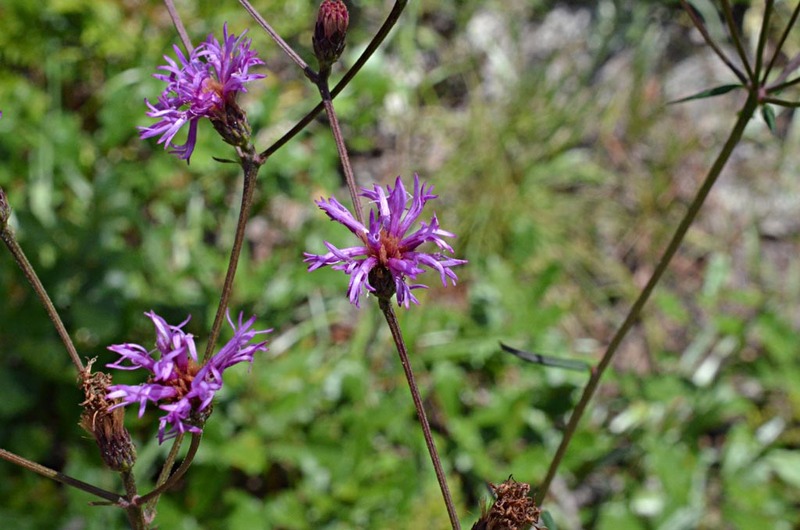 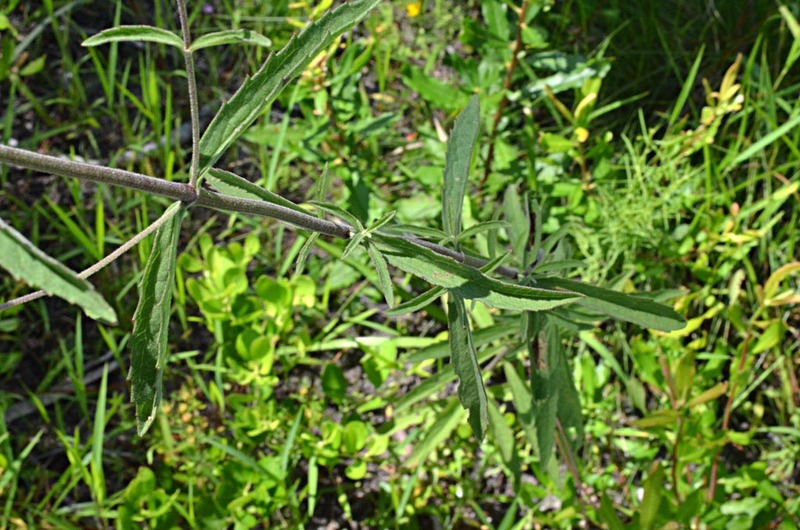 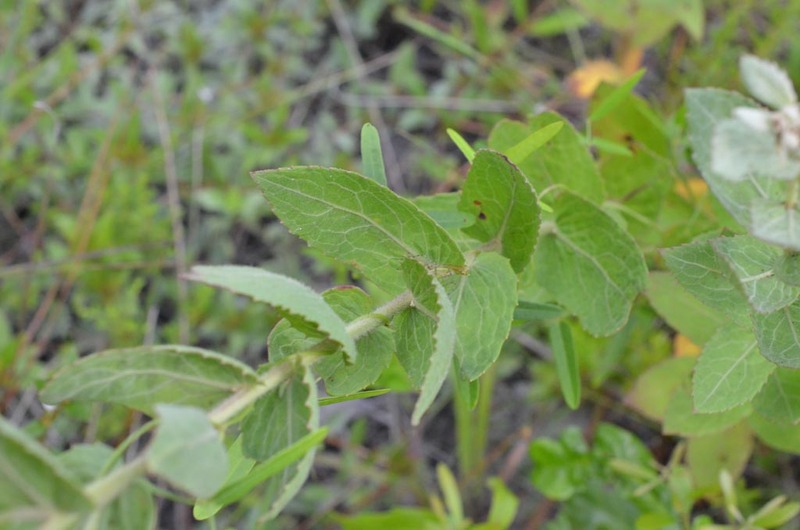 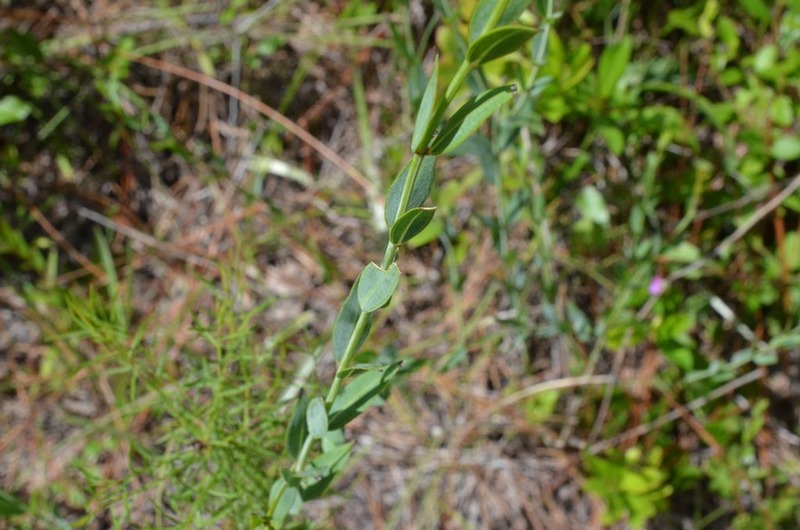 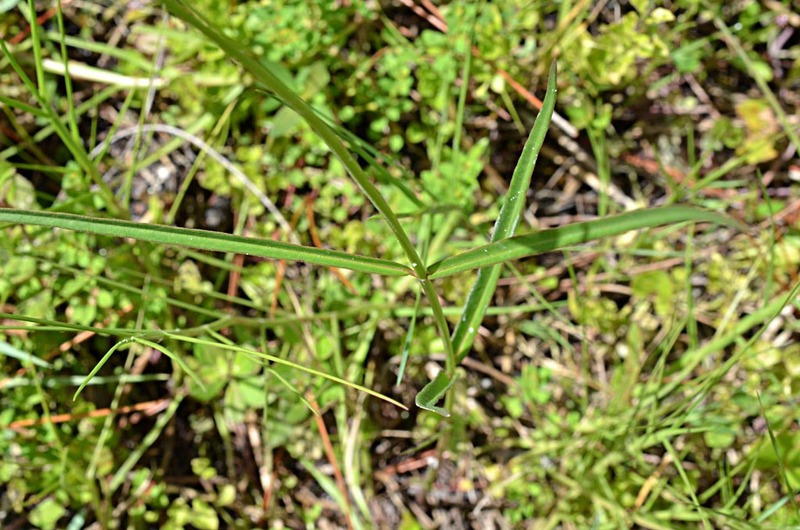 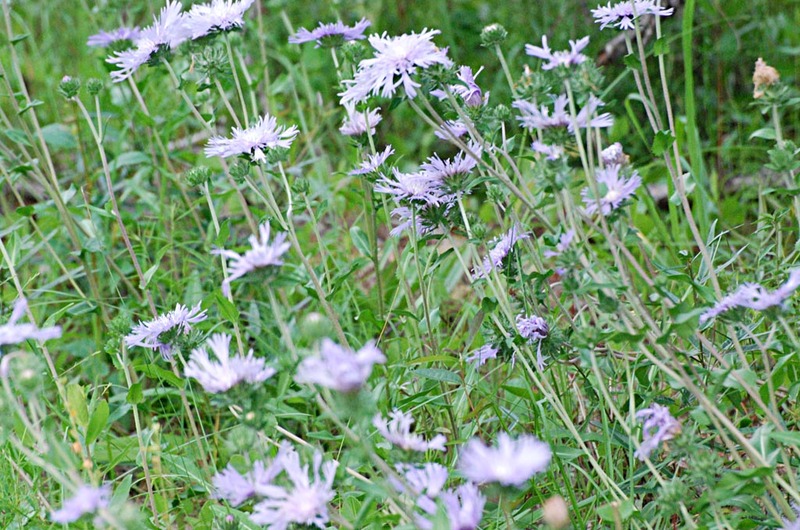 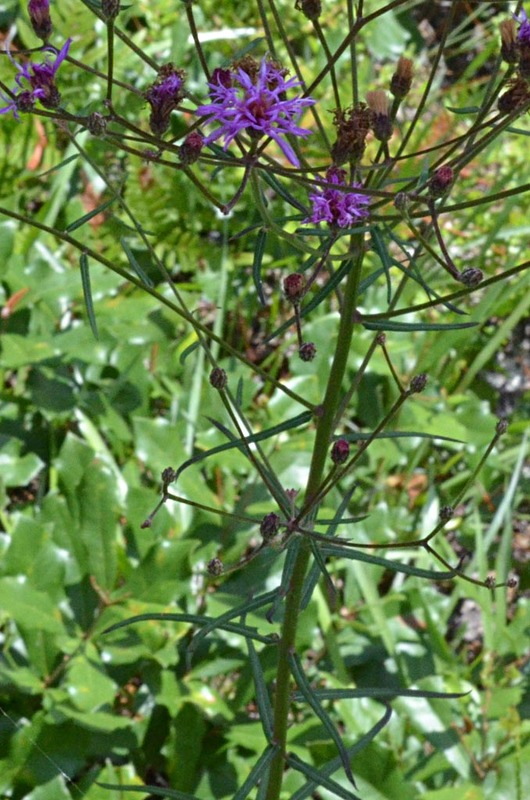 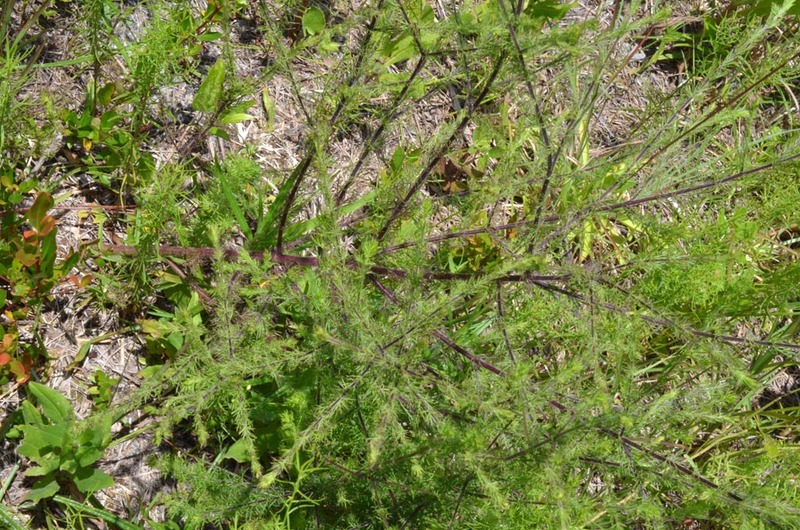 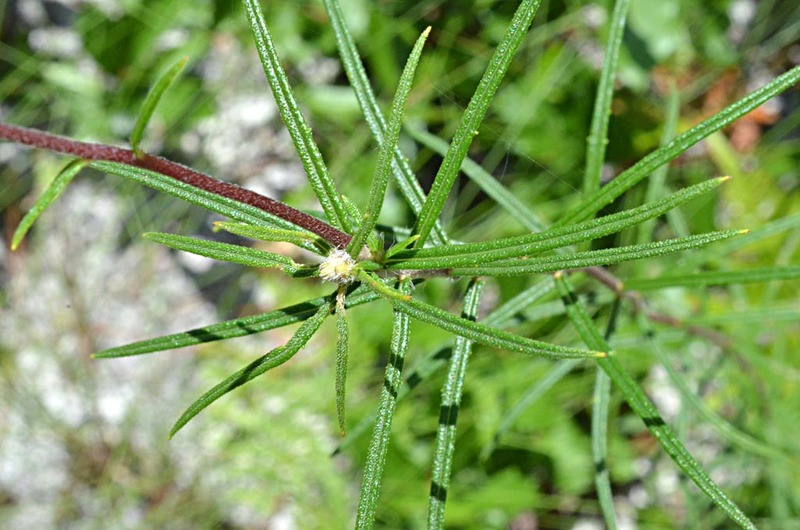 The narrow leaves indicate that this is Vernonia angustifolia. 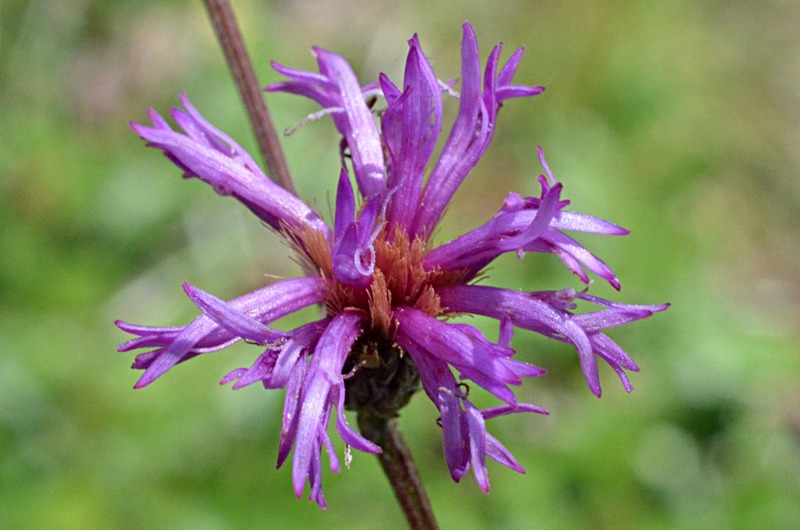 Giant ironweed, Vernonia gigantea, has broad leaves. 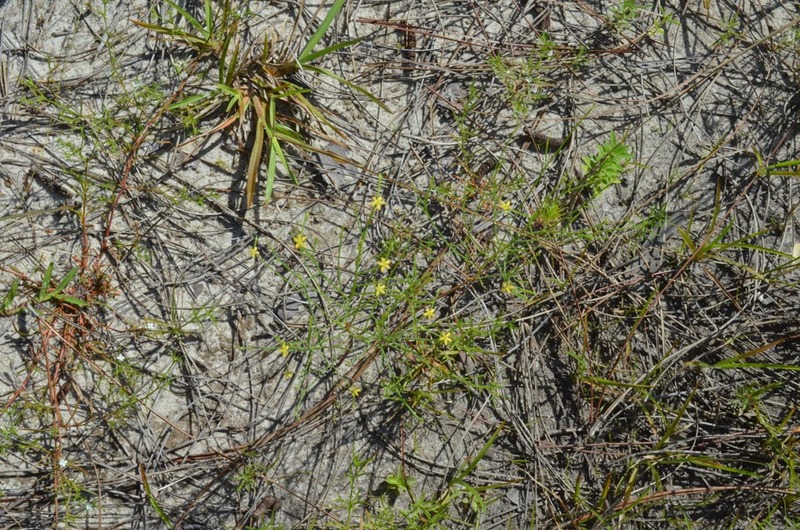 Plants were under 1-ft tall. 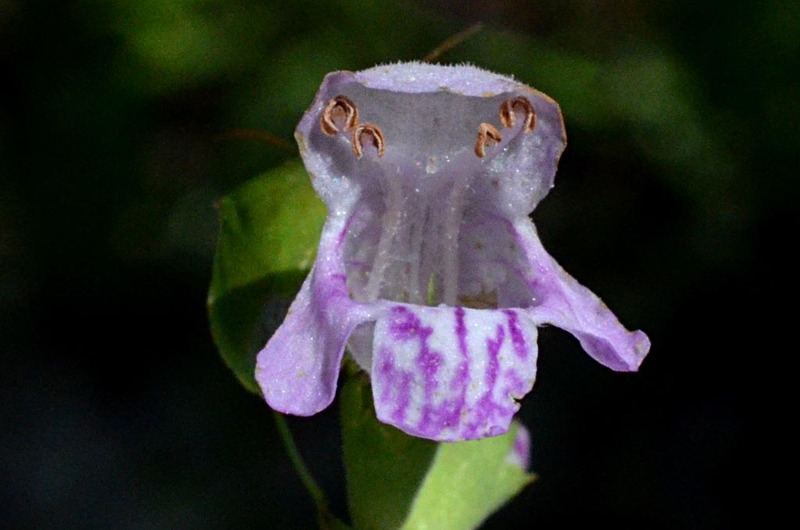 Wunderline designates this species as "Rare." 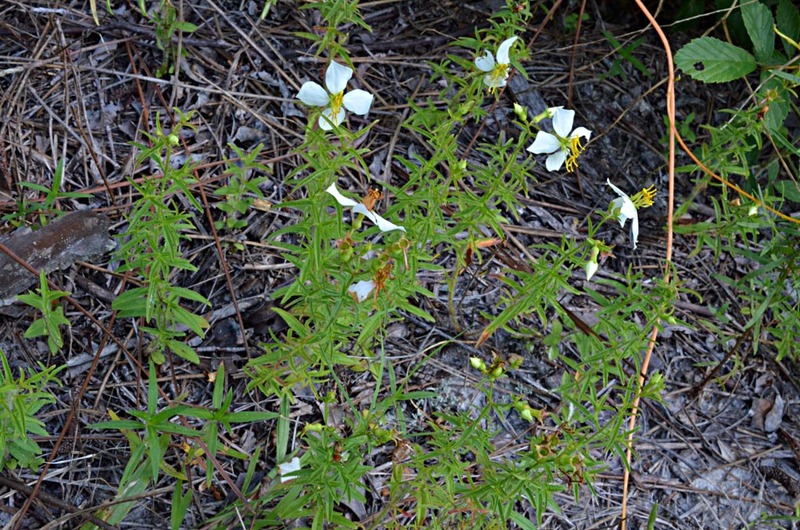 Found only in 4 counties in the Florida Panhandle. 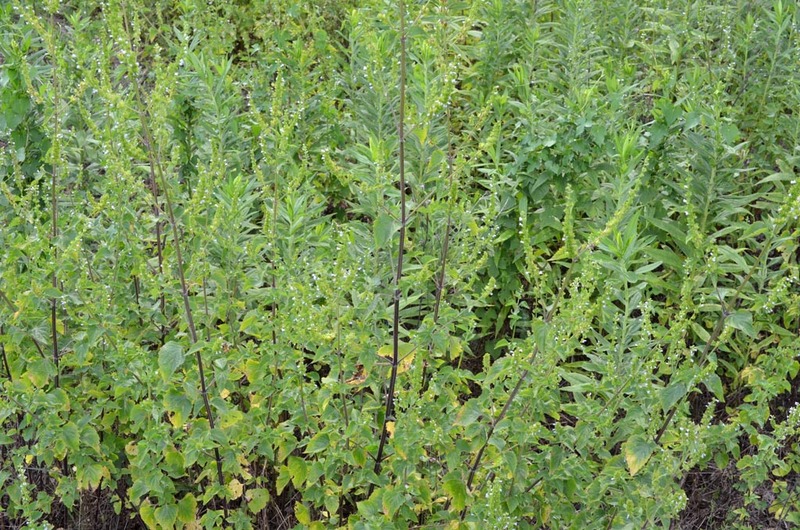 Last image shows basal leaves. 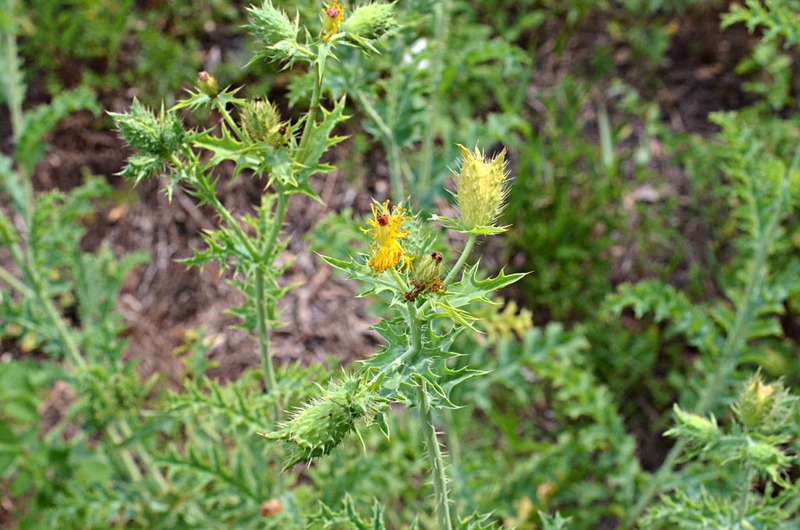 Found in weedy swale near Best Western motel south of Crawfordville on US-98. 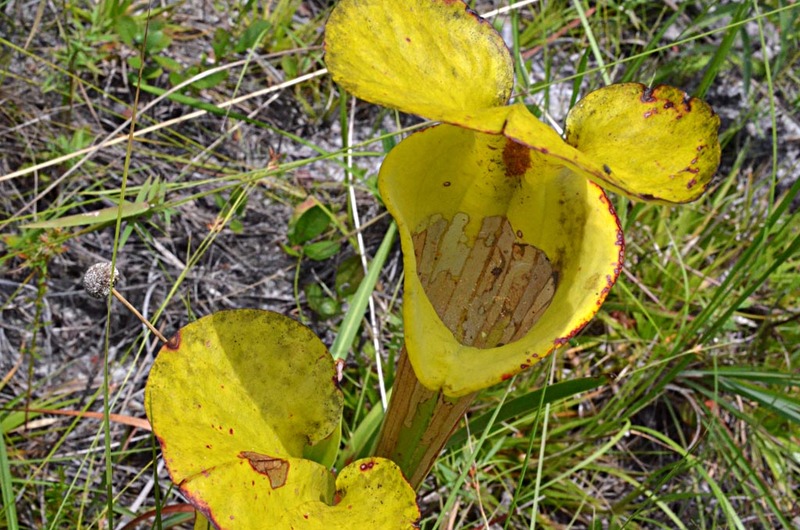 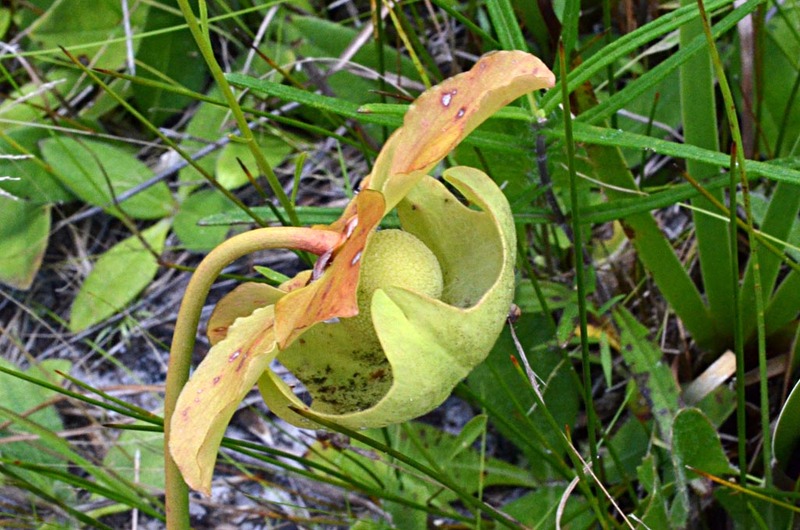 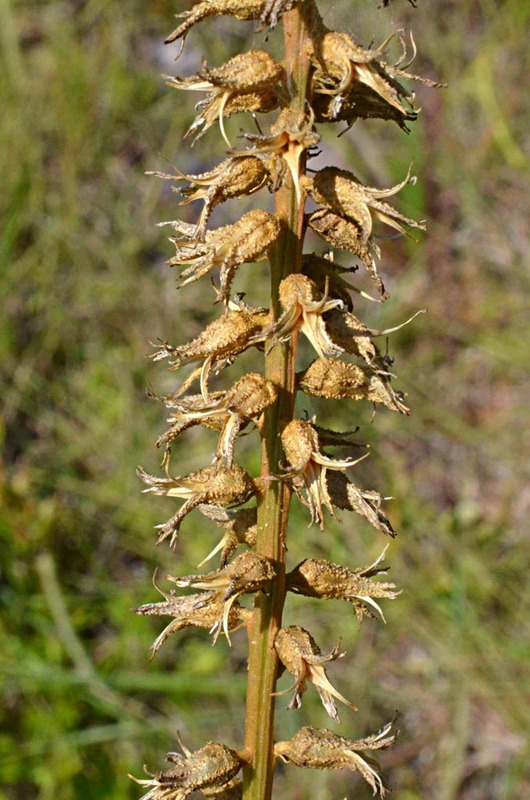 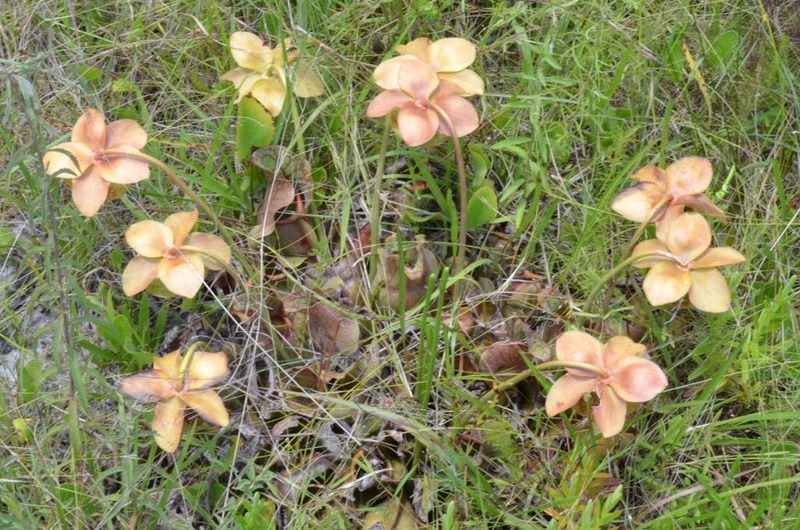 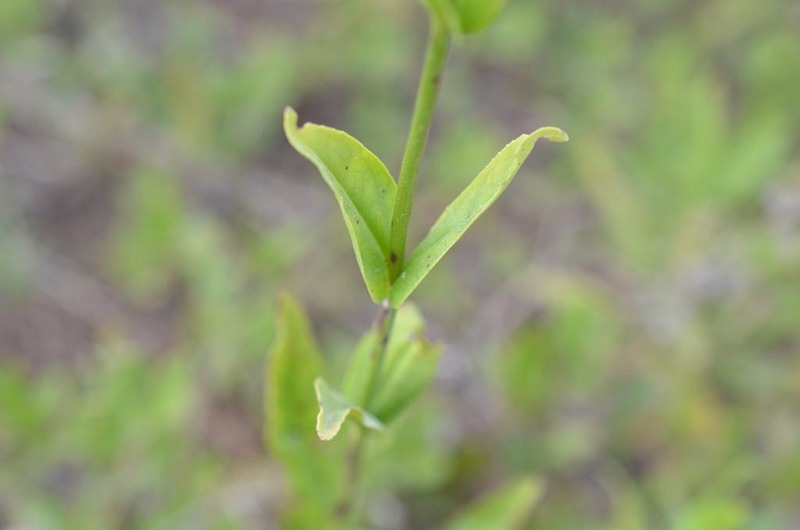 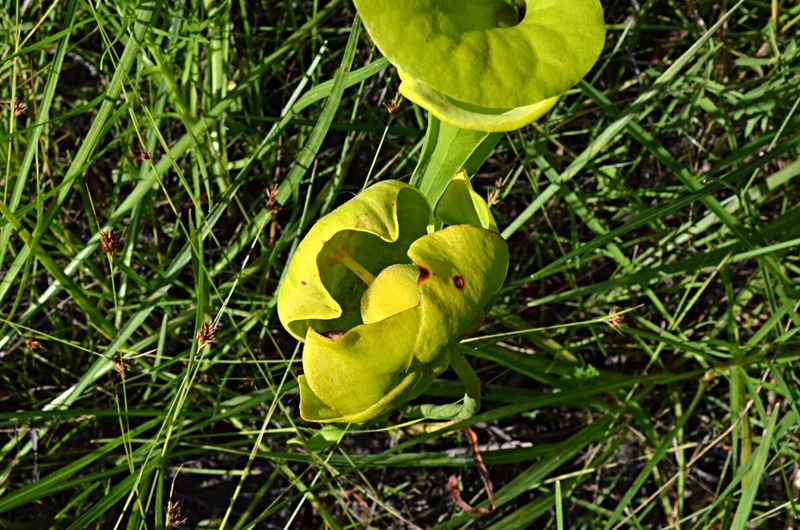 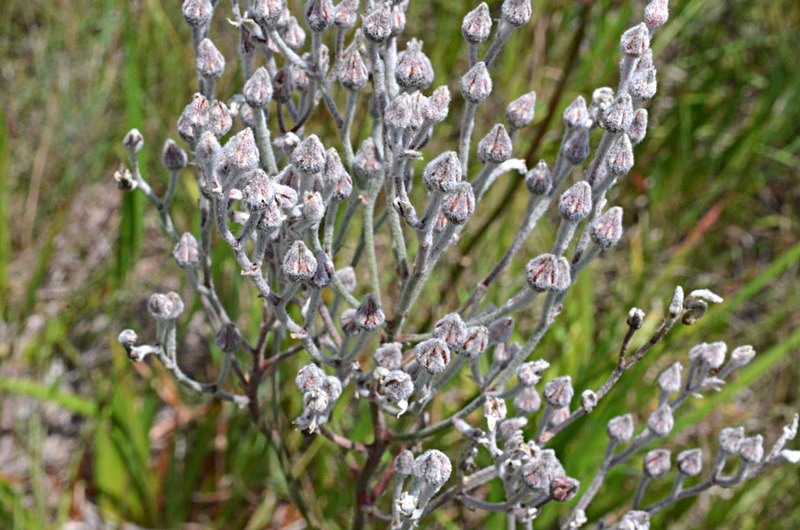 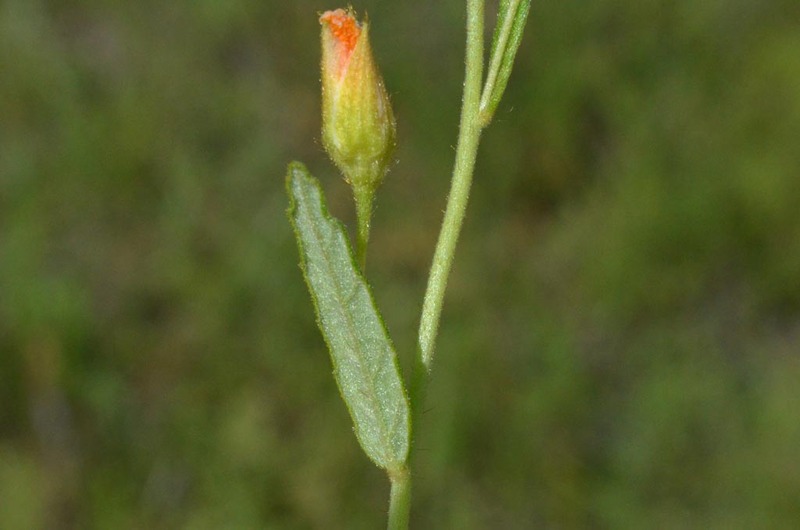 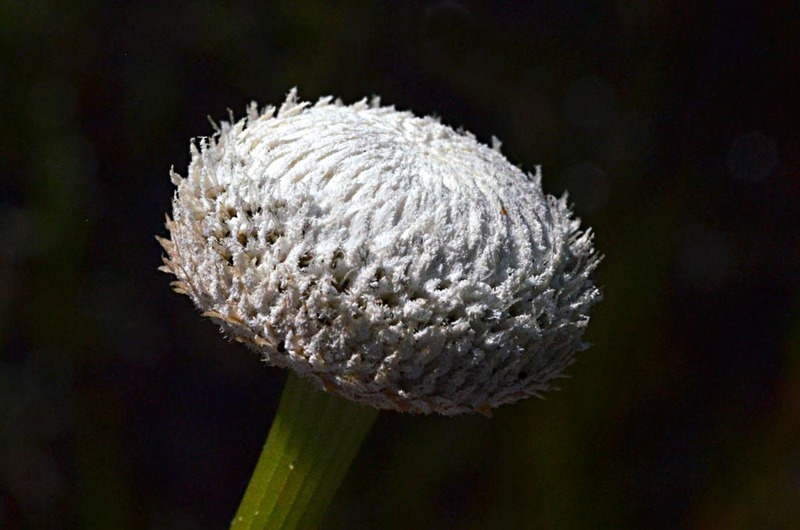 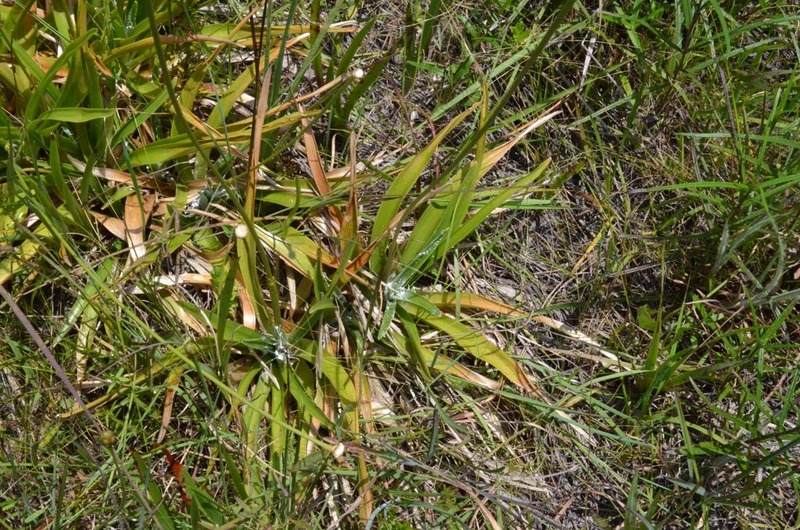 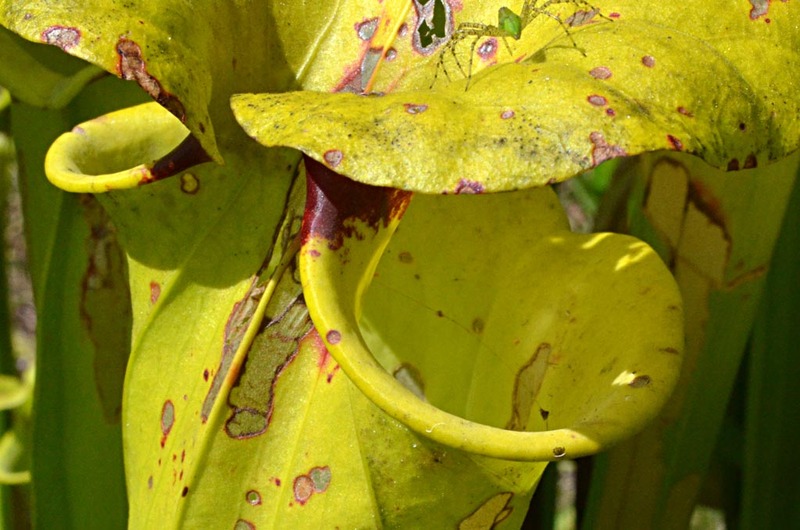 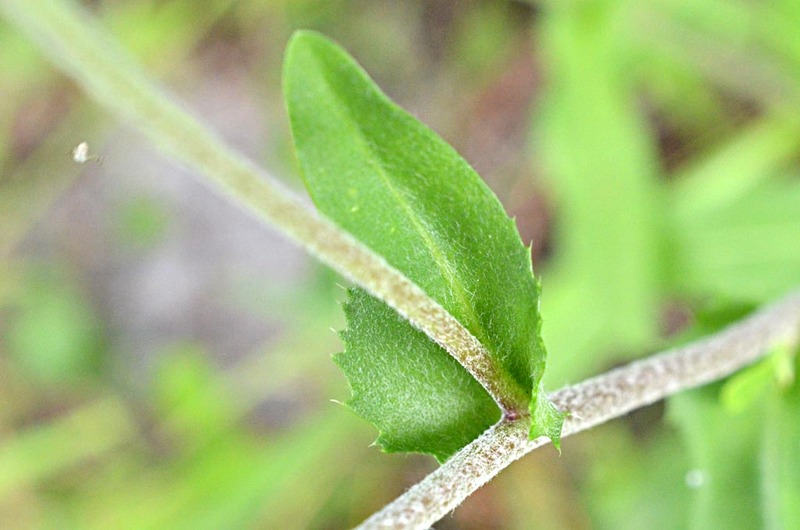 In the last image, the mouth of the plant has been covered over with a soft membrane. 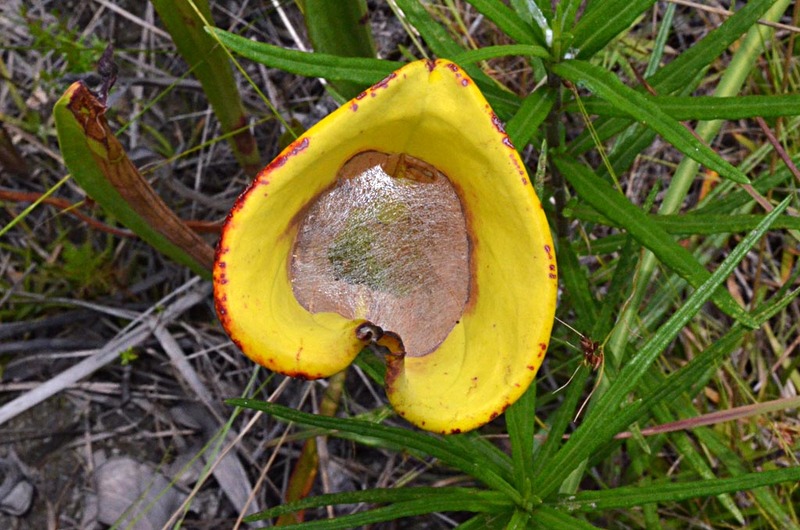 The membrane is convex, which indicates the presence of a gas inside the pitcher. 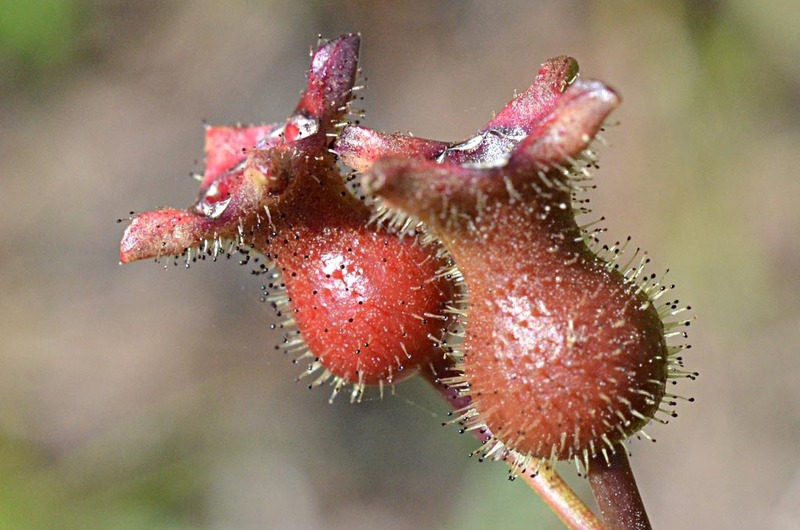 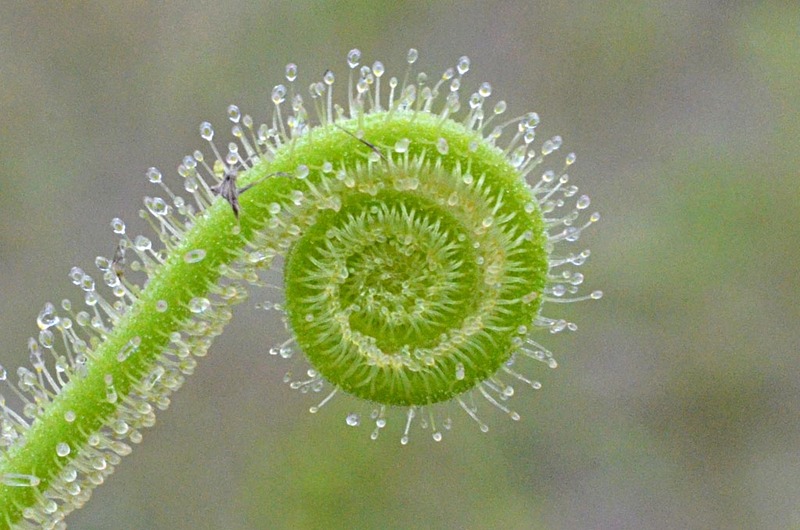 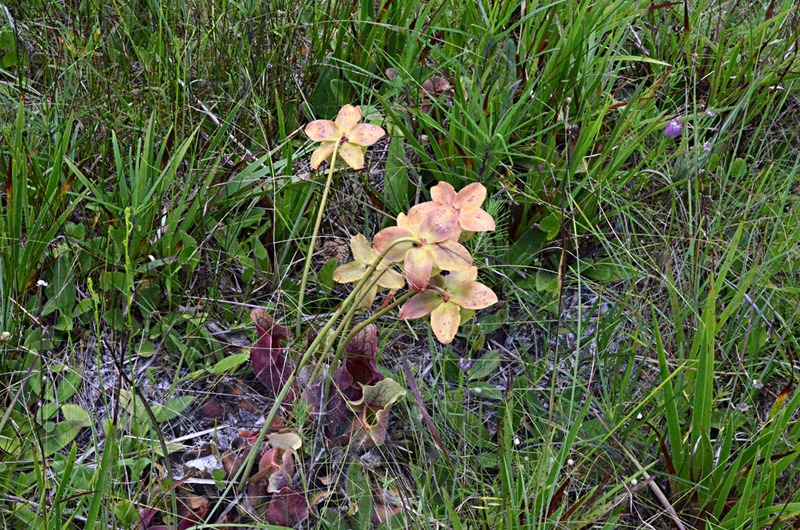 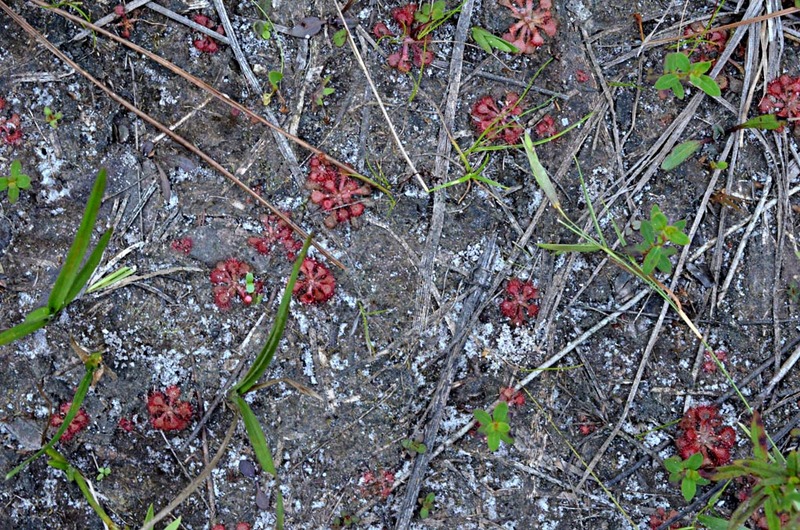 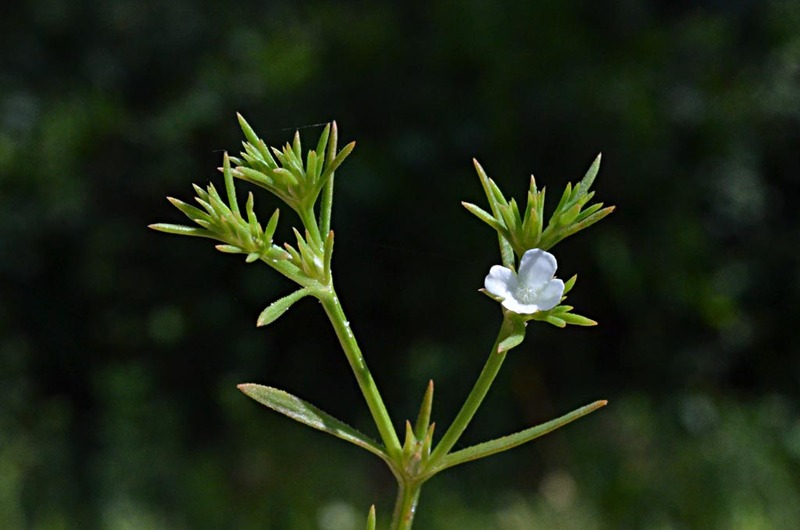 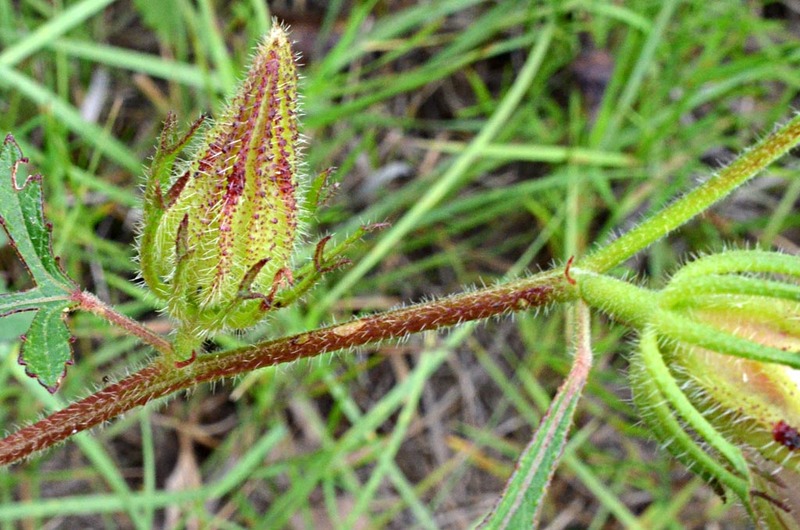 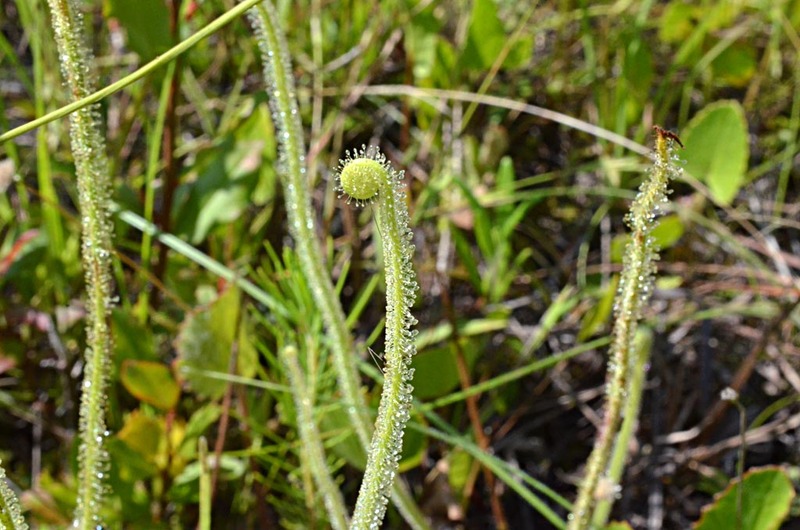 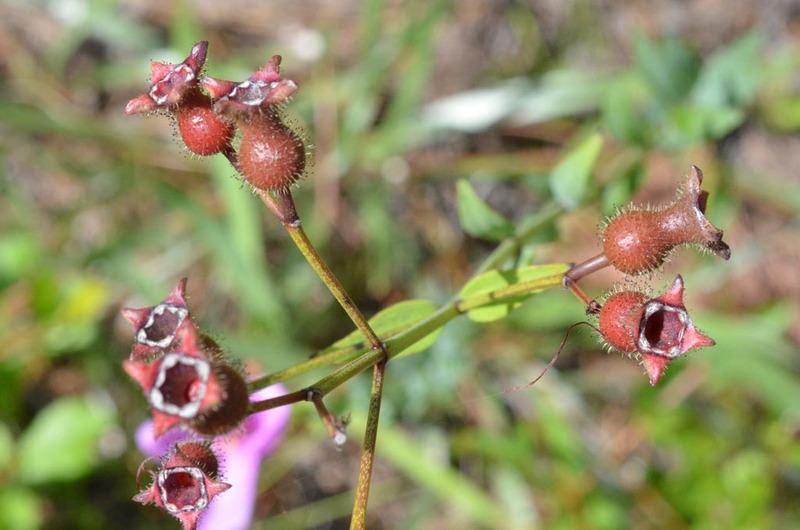 It is possible that this is Drosera brevifolia. 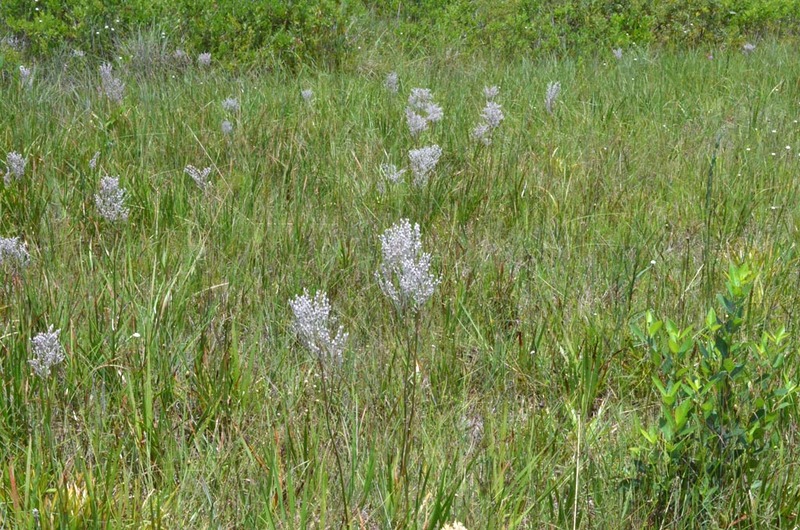 More study needed to determine the species (may be more than one shown). 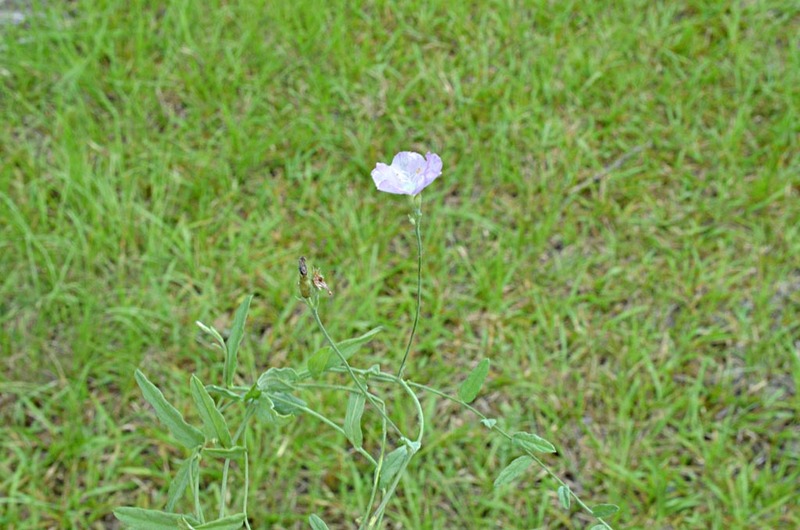 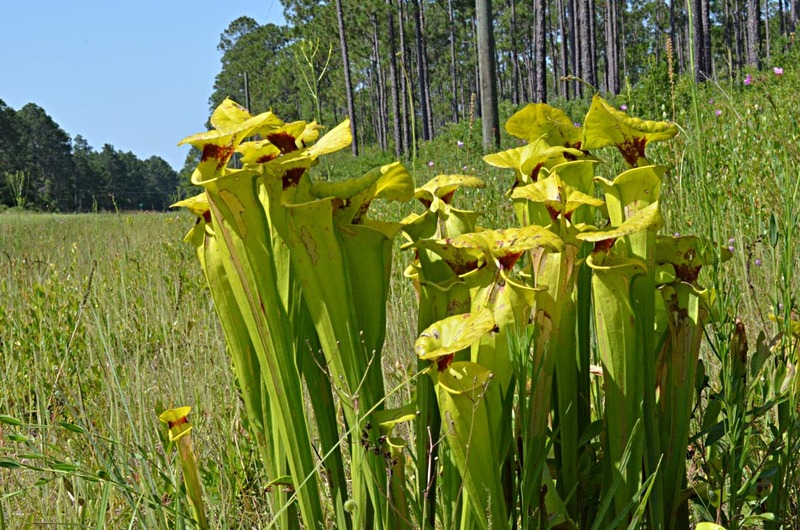 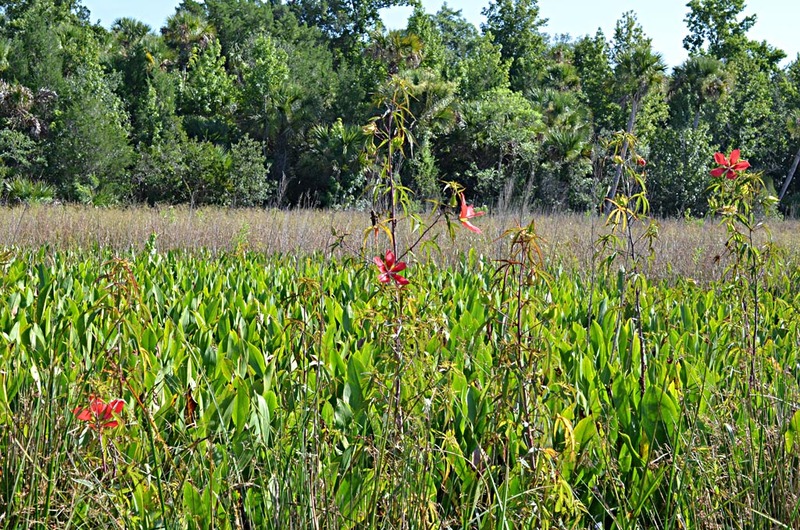 Found in a weedy field near the Best Western motel, south of Crawfordville on US-98. 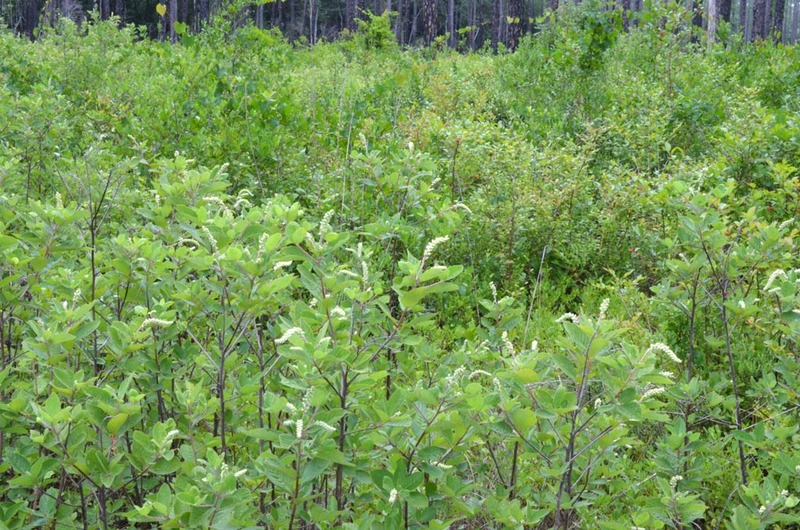 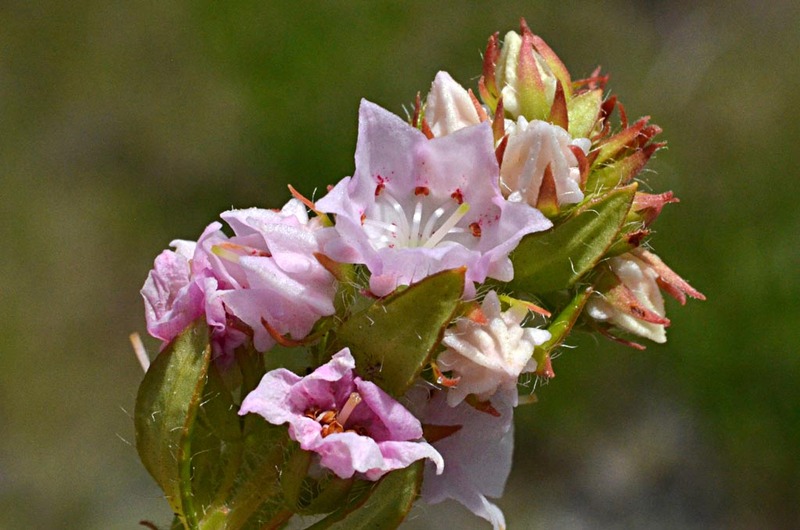 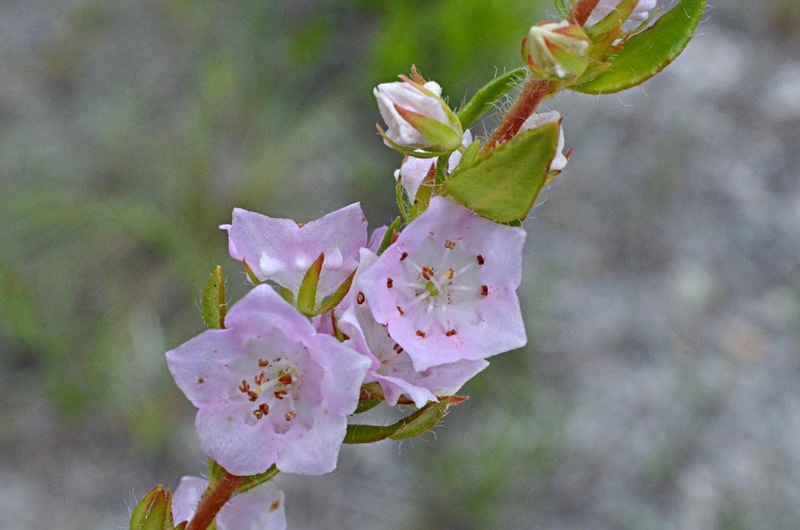 This plant is a relative of mountain laurel from northern U.S. areas. 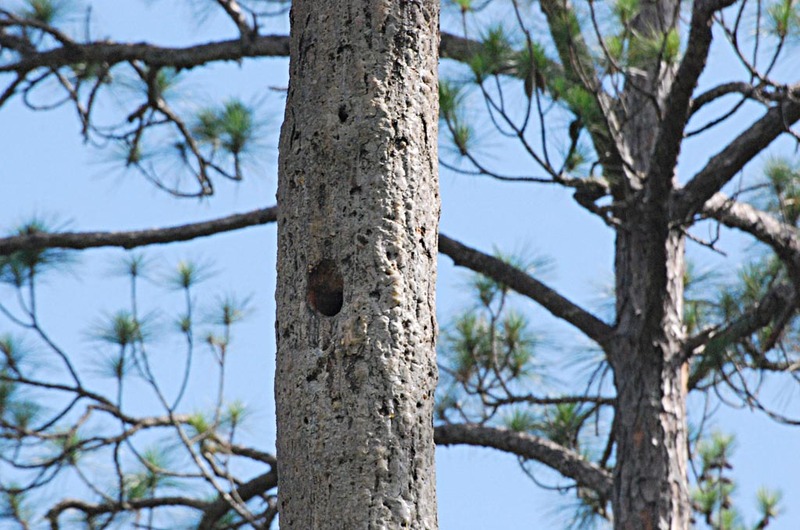 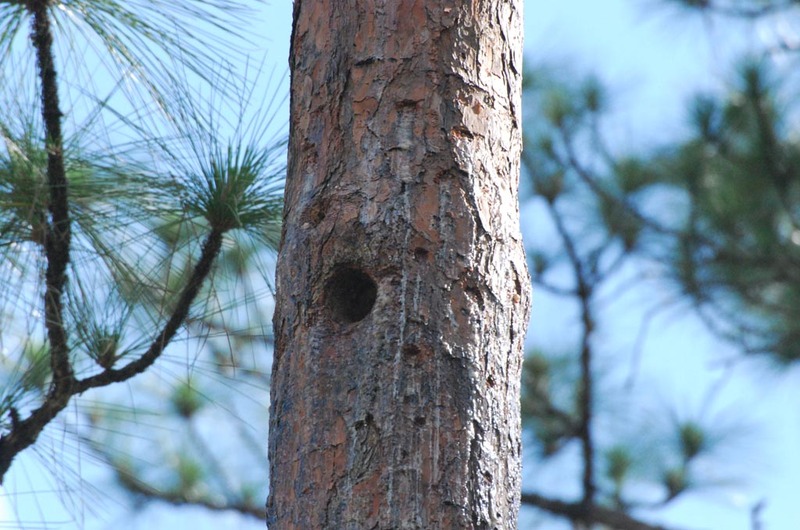 The red-cockaded woodpecker builds nest cavities in live pine trees. 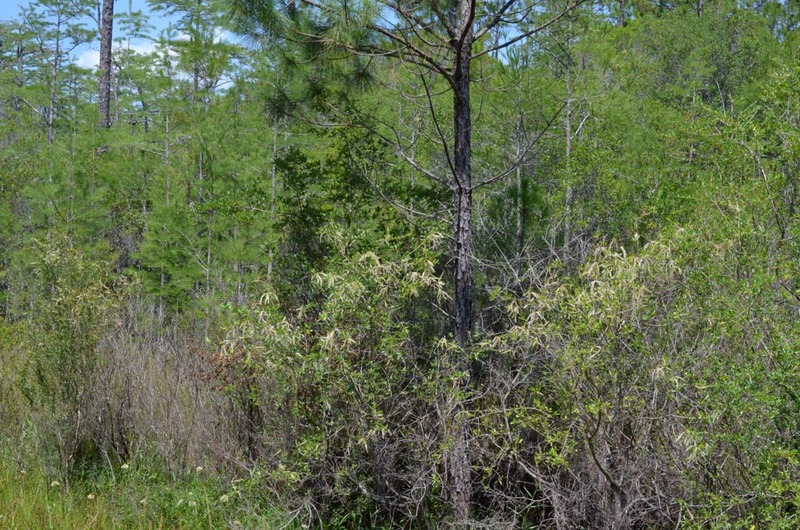 The running sap that flows from around the hole helps keep out rat snakes and other predators. 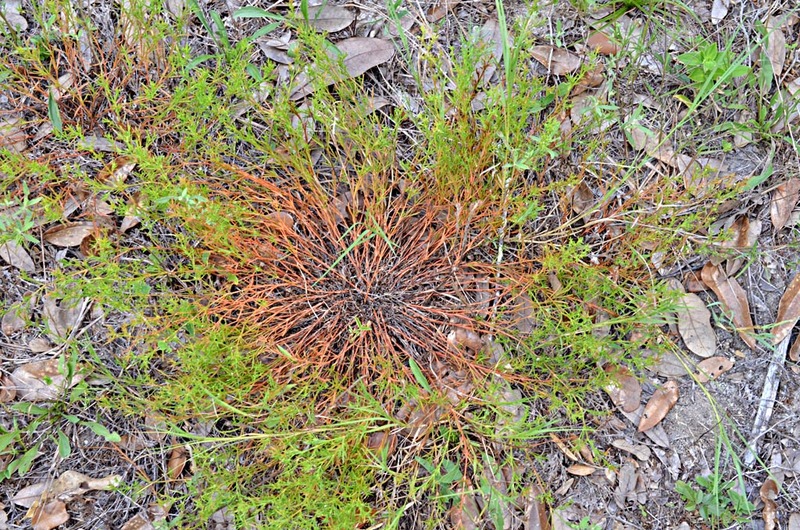 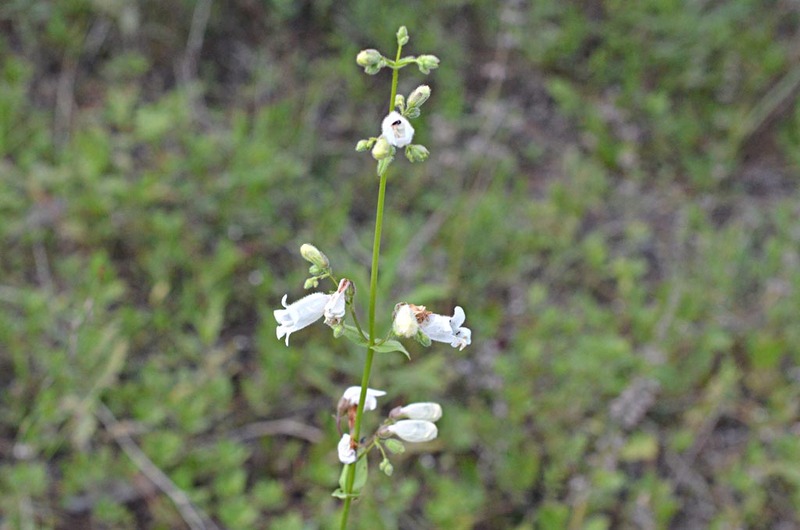 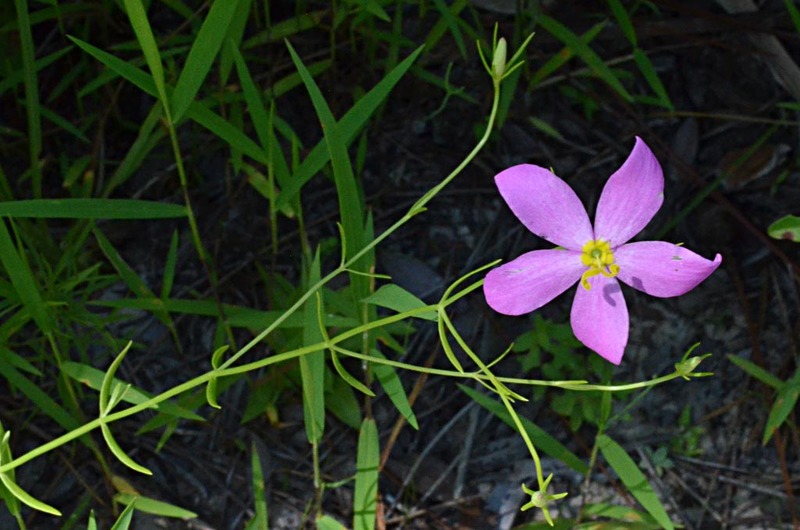 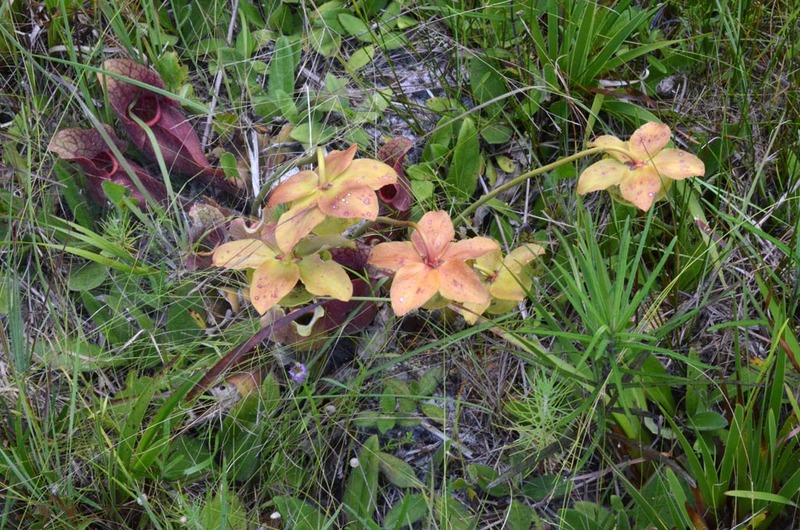 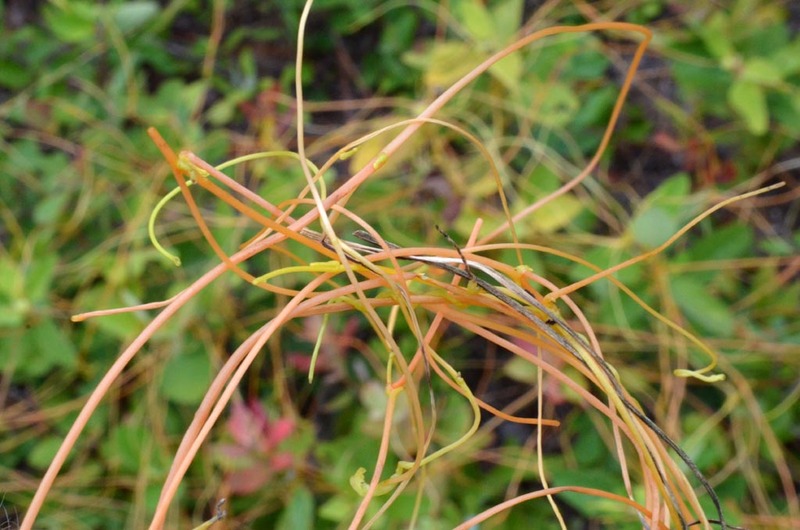 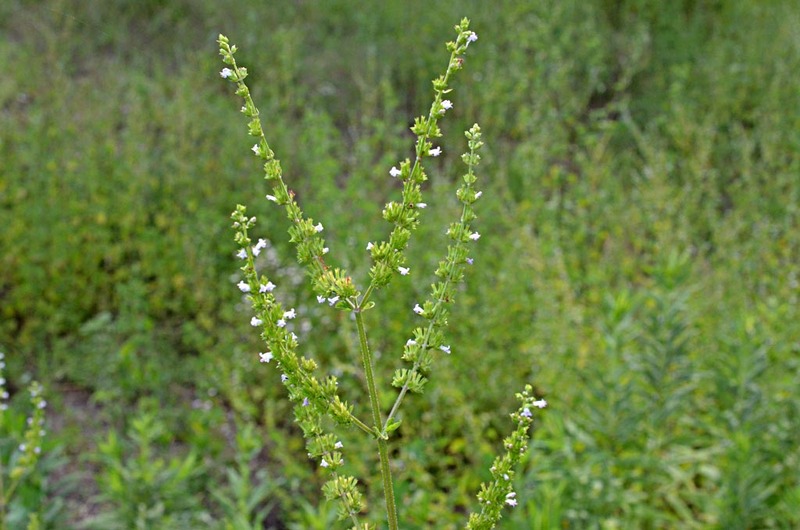 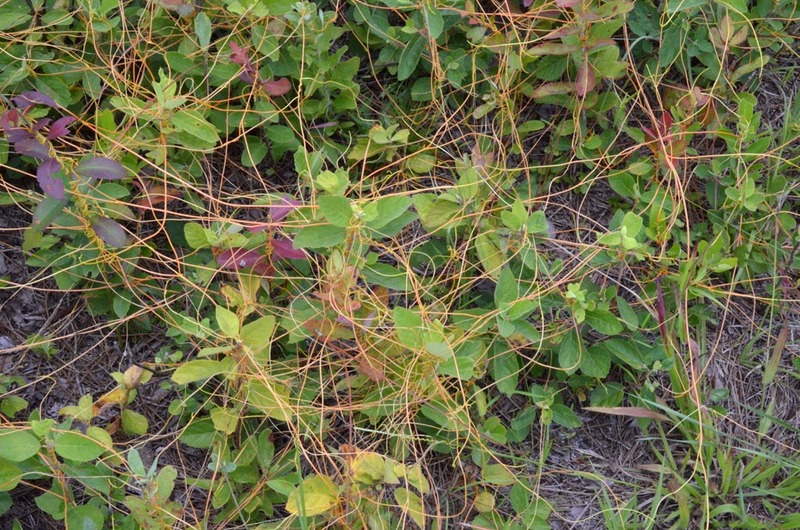 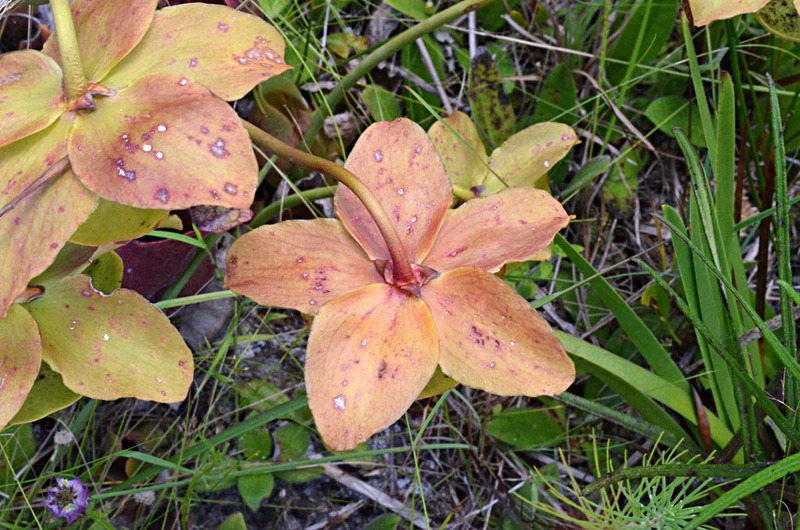 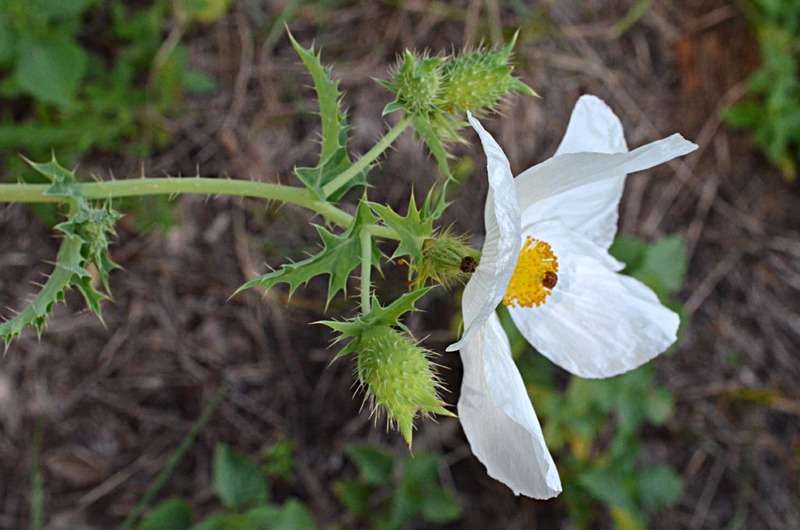 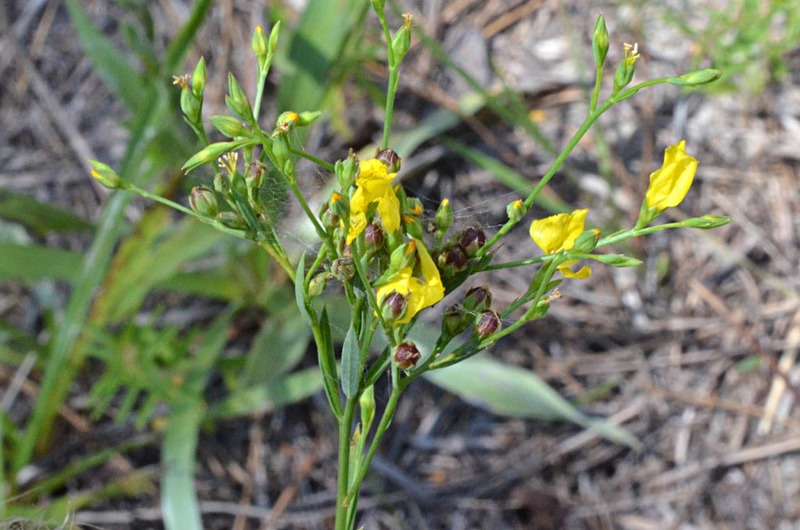 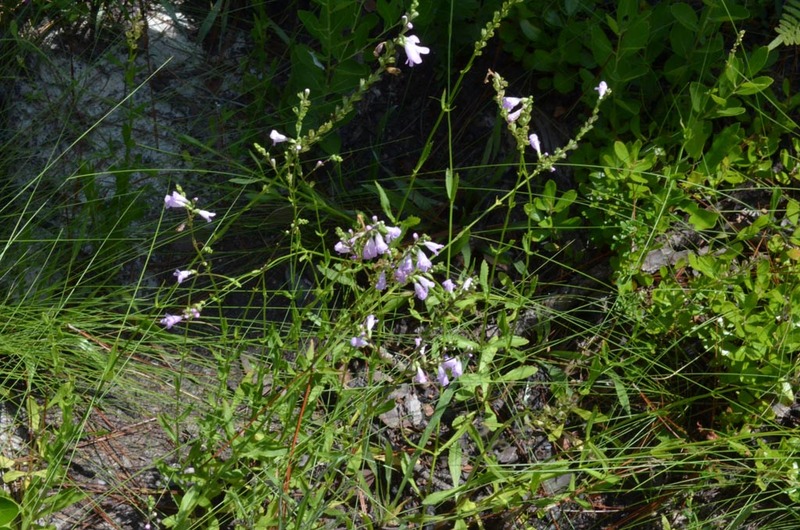 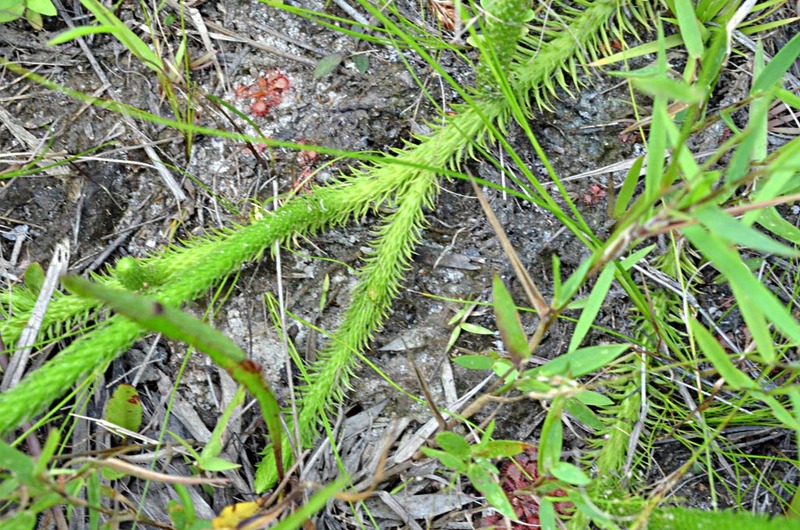 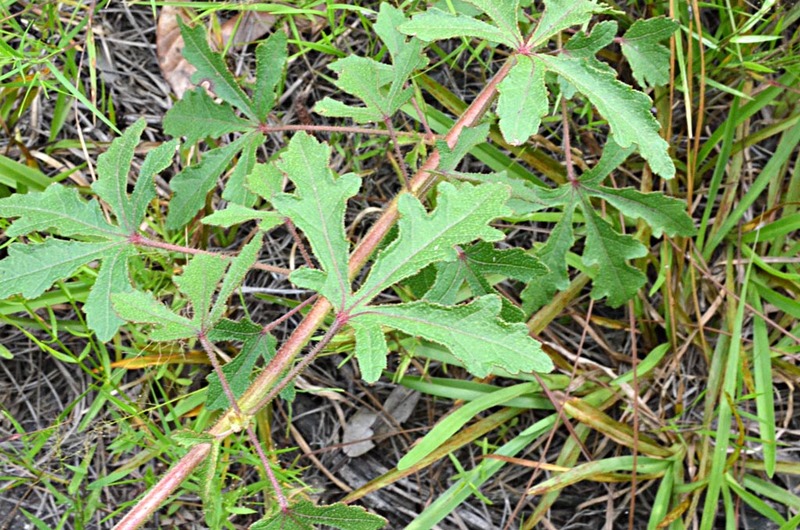 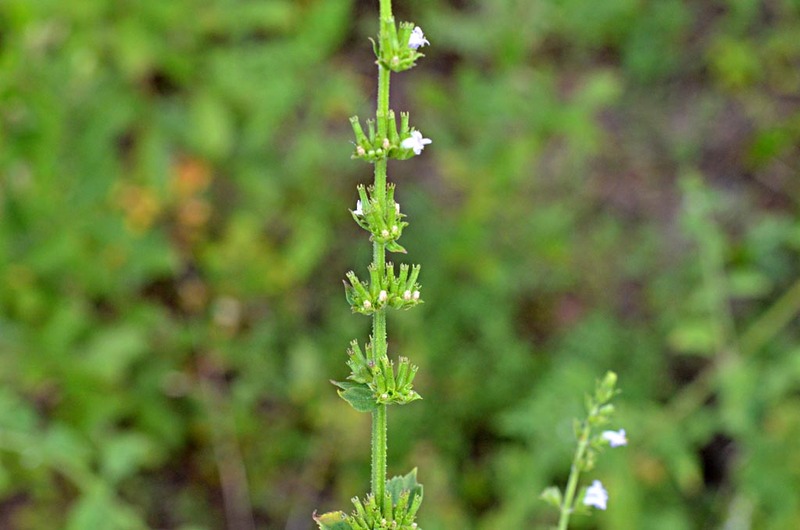 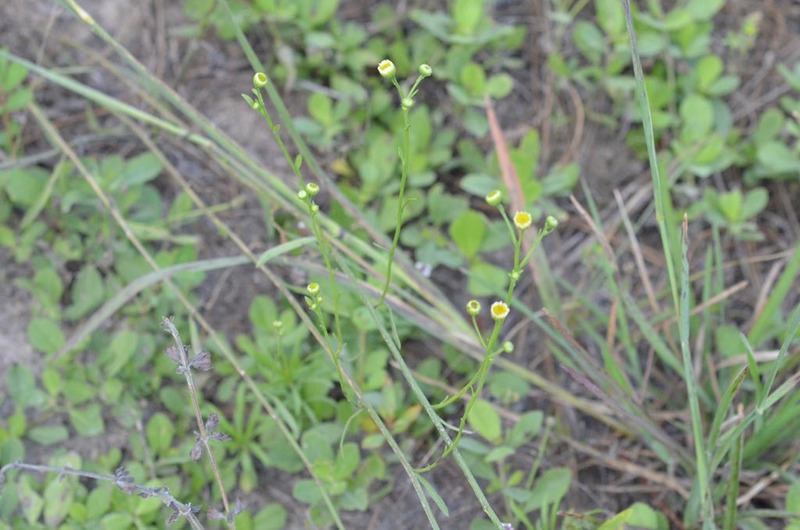 Found in a weedy swale near Best Western motel on US-98, south of Crawfordville. 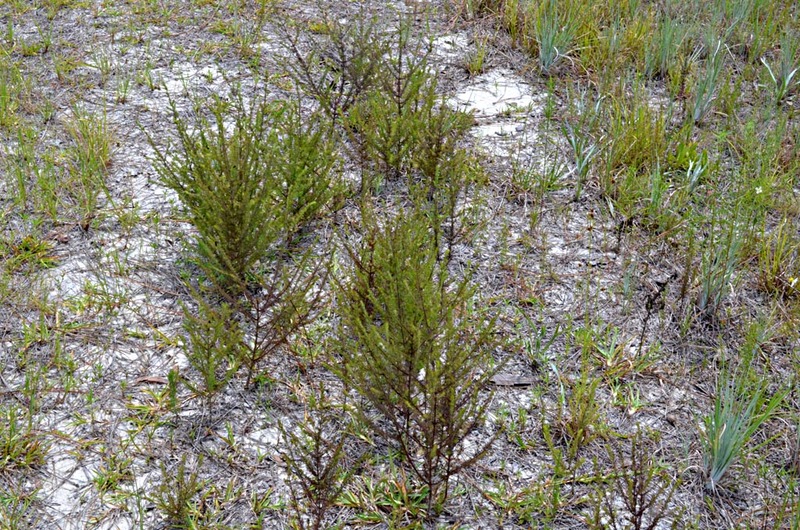 Widespread, generally in dry areas. 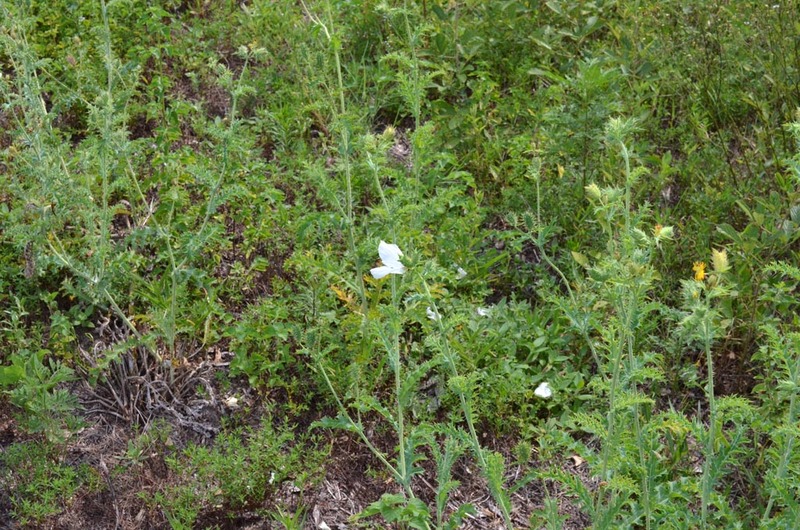 Roger Hammer thinks it might be a Dalea. 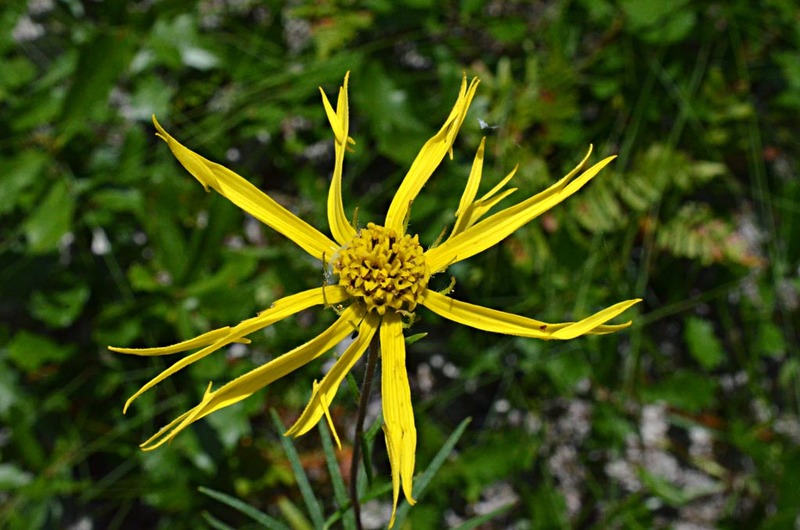 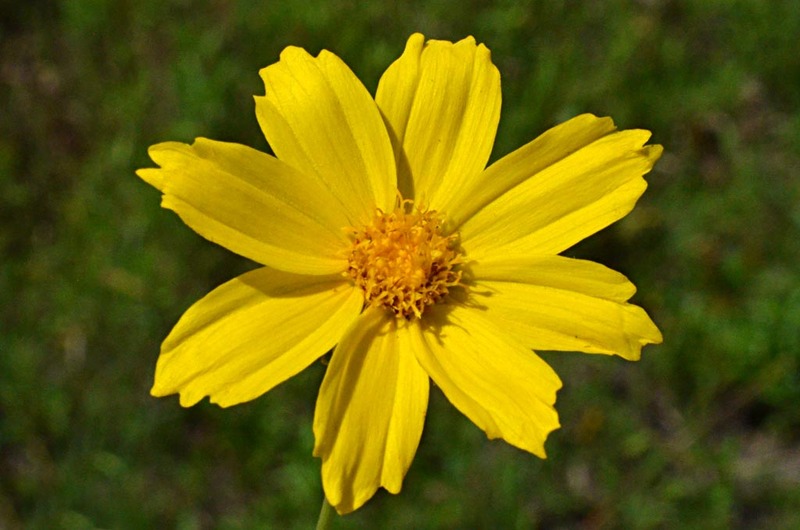 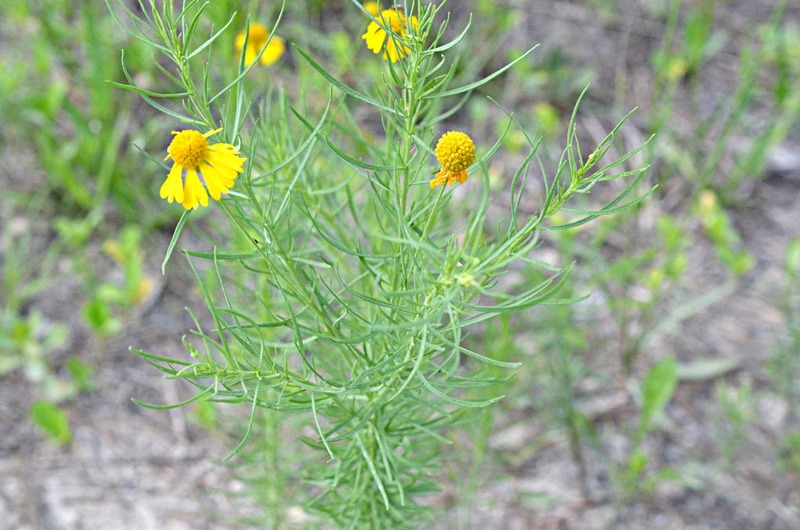 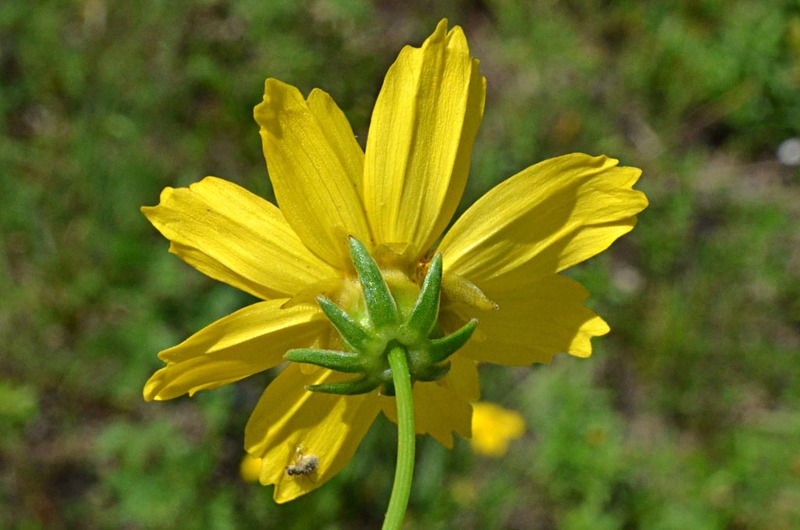 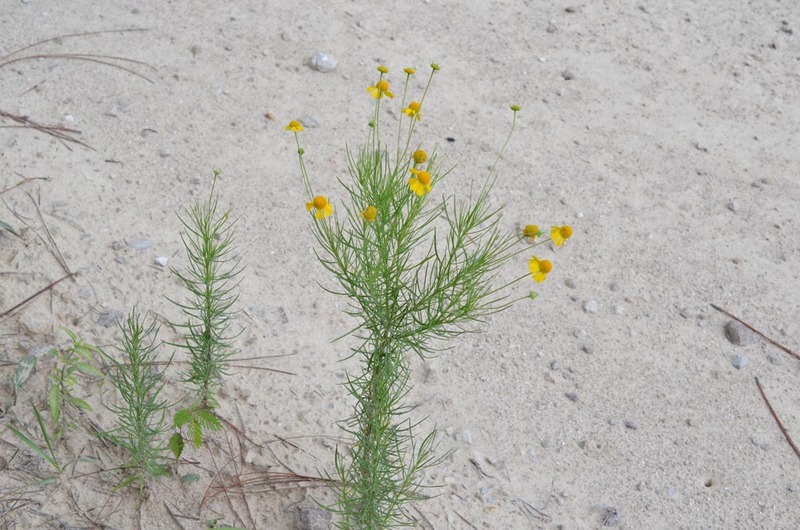 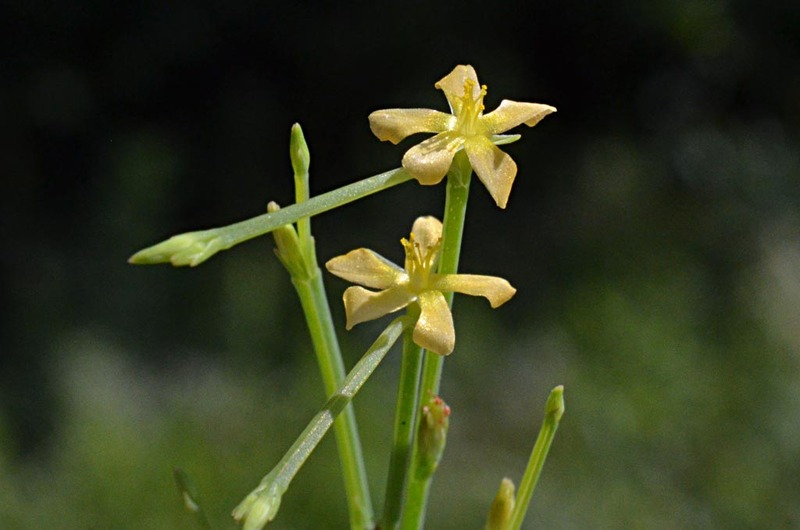 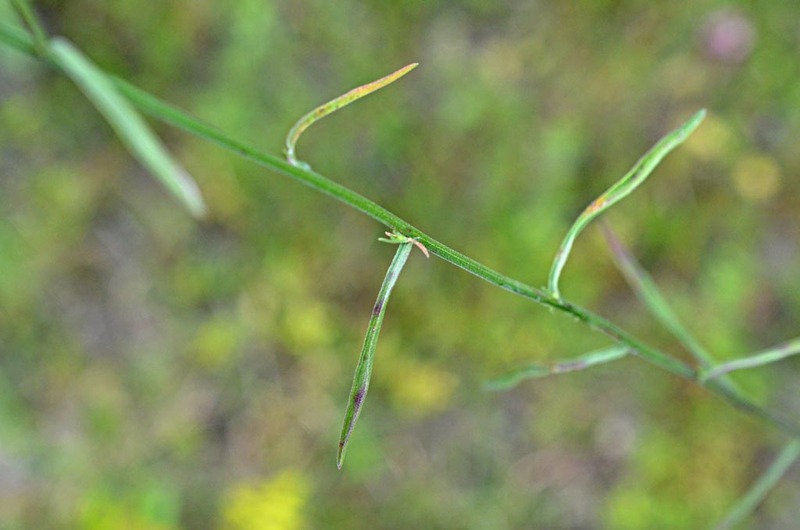 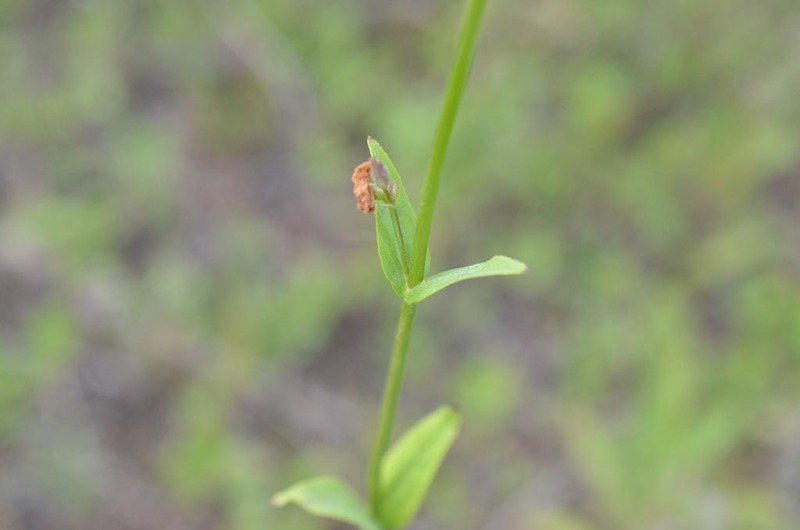 I had initially labeled this is "Unidentified;" however, Roger Hammer later identified it as Coreopsis lanceolata, one of the few Coreopsis with yellow disk florets.